Established in 1998, G.e.t. 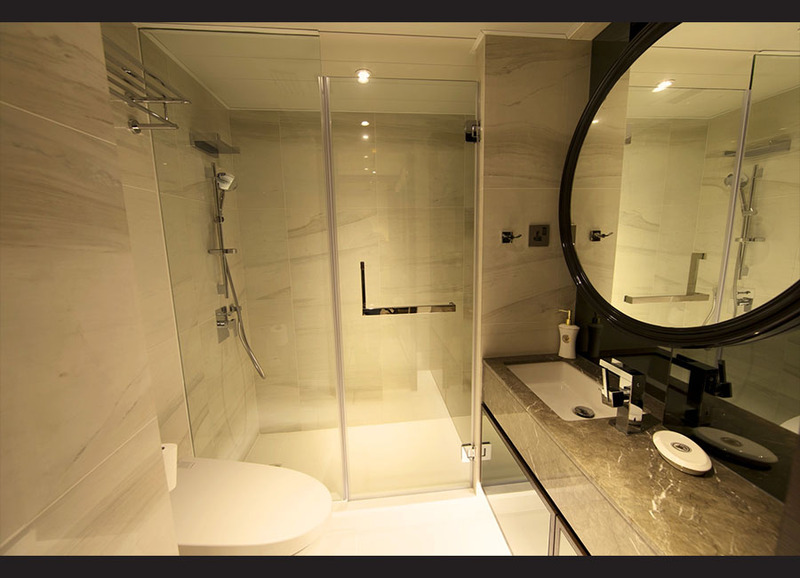 Casa has now become one of the most successful companies in the industry of imported tiles and parquets. G.e.t. Casa is also determined to becoming the best provider of building decorative materials in the world. Providing quality services and products in the last decade, G.e.t. 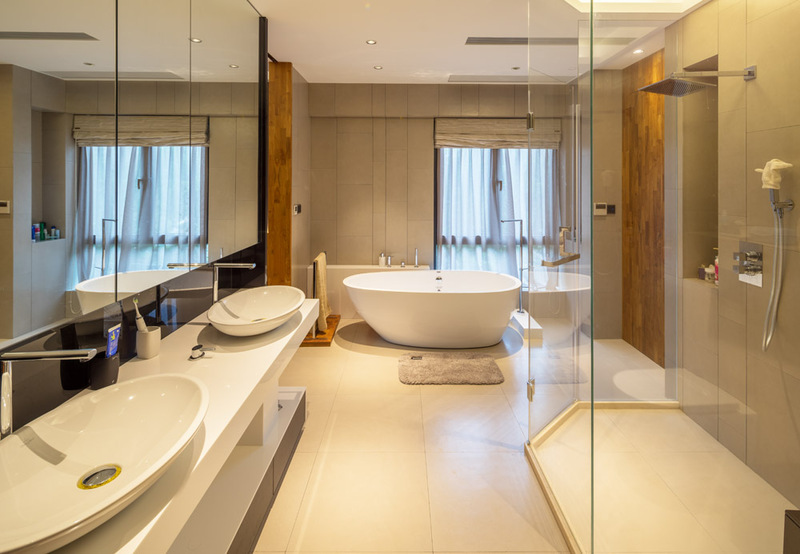 Casa has gained industrial recognition to become the sole distributor of many international brands of ceramics, parquets, and the market leader in the world of imported building decorative materials in Chinese market. As a market leader, every year G.e.t. Casa selects the hottest products directly from Europe, in order to inspire you with the hottest trend and the unique experience. Today, G.e.t. 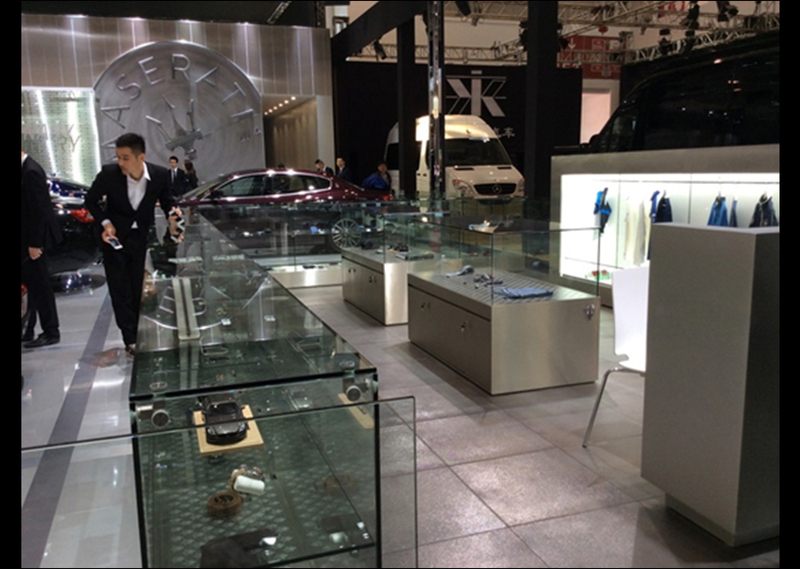 Casa has 28 showrooms in 24 different cities in China; Hong Kong, Shenzhen, Guangzhou, Shanghai, Beijing, Nanning, Dongguan, Suzhou, Nanchang, Xiamen, Kunming, Fuzhou, Guiyang, Changsha, Taizhou, Chongqing, Shaoxing, Cixi, Chengdu, Wuhan,Xuzhou, Xi’an, Zhengzhou, Shijiazhuang, Tianjin, Haerbin and Dalian. 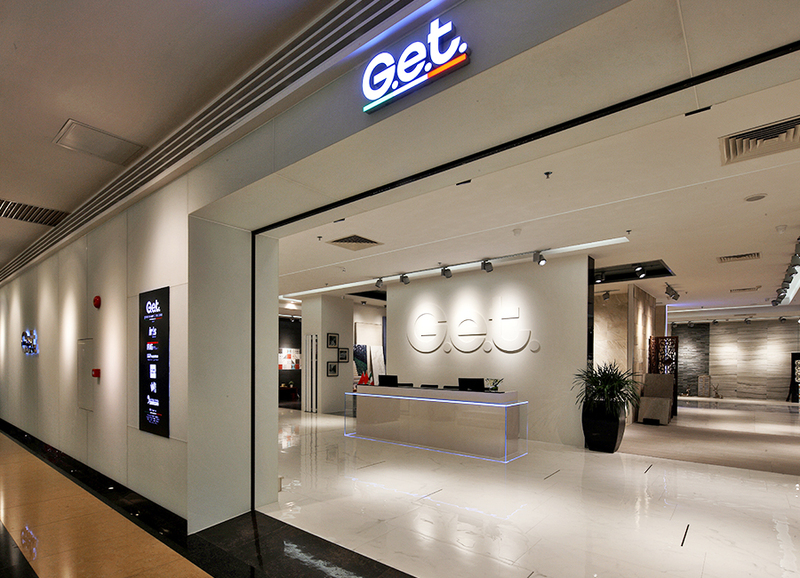 Along with the direct showrooms, G.e.t. Casa has also owned a completely developed network of franchisee and distributors, providing high-quality services and products throughout the country. G.e.t. Casa guarantees and commits to providing you with the 100% Italian-Made, the best-quality and the most stylish building decorative materials. 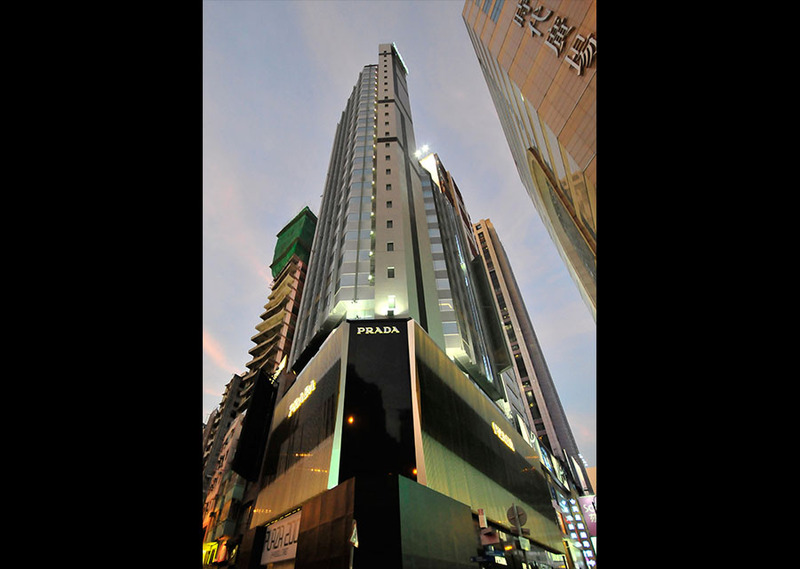 All products provided are awarded annually with "No Fakes Pledge" Scheme issued by Hong Kong Intellectual Property Department, and “Quality Tourism Services” Scheme issued by Hong Kong Tourism Boards. It has revolutionized the world of Architecture, Interior Design and Household Customers in Qualities and Brands. Technical assurance is another aspect that G.e.t. Casa values. Partners of G.e.t. 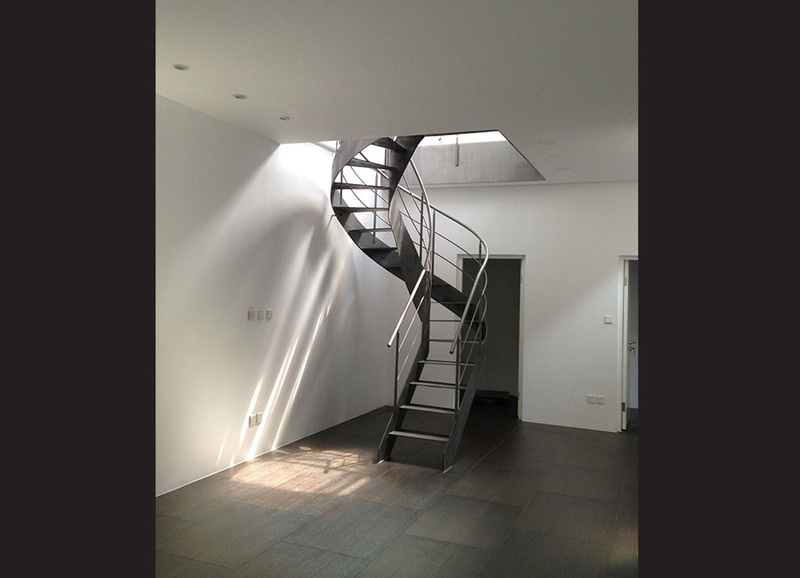 Casa are internationally famous and certified by the industrial standards. Products by G.e.t. Casa are respectively certified by Industrial Certifications. Different certificatons are granded for different types of products. Generally, certifications granded include but not limit to: the International Organization for Standardization (ISO), Programme for the Endorsement of Forest Certification Schemes (PEFC), Forest Stewardship Council (FSC) and Green Building Council (GBC), etc. G.e.t. Casa is the sole agent and provider in Asian world, of a number of historical and listed brands from Europe for quality tiles, parquets and wallpapers. Tiles - G.e.t. Casa has been partnering with Coem, Cerdisa, Cisa, Gardenia, Iris, FMG, Ceramica Sant’ Agostino, Floorgres, Viva, Fioranese and Tonalite etc. Given the combination of history and advanced technology, it results in the stylish design, unique-ness and durability of the products, providing you with an amazing interior appearance and a long-lasting living place. Parquet - G.e.t. Casa is the sole distributor of Gazzotti, who is the sole supplier of wood parquet for the Italian Royal Family. Given the advanced technologies, supreme quality of products and more than 100 years of history of making parquet, Gazzotti is a leading producer and brand in the market of wood parquet. Wallpaper - G.e.t. Casa shares values of creativity with Inkiostro Bianco. As the sole distrobutor of Inkiostro Bianco, G.e.t. 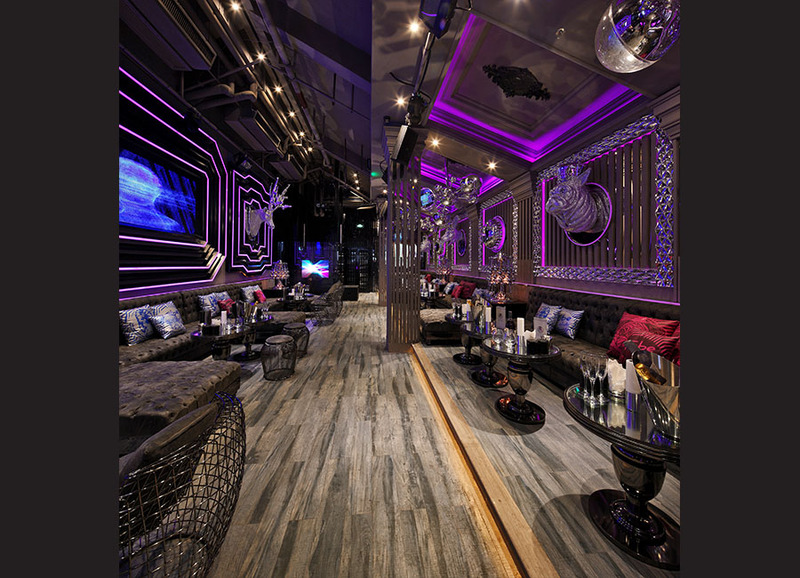 Casa brings high-quality fiber glass wallpapers and graphical creativity into living place. For more information and story behind each partner,please click here. Modernity and simplicity are the foundations of G.e.t. Casa showroom deisgn. Through designs of the interior and presentation of products, G.e.t. 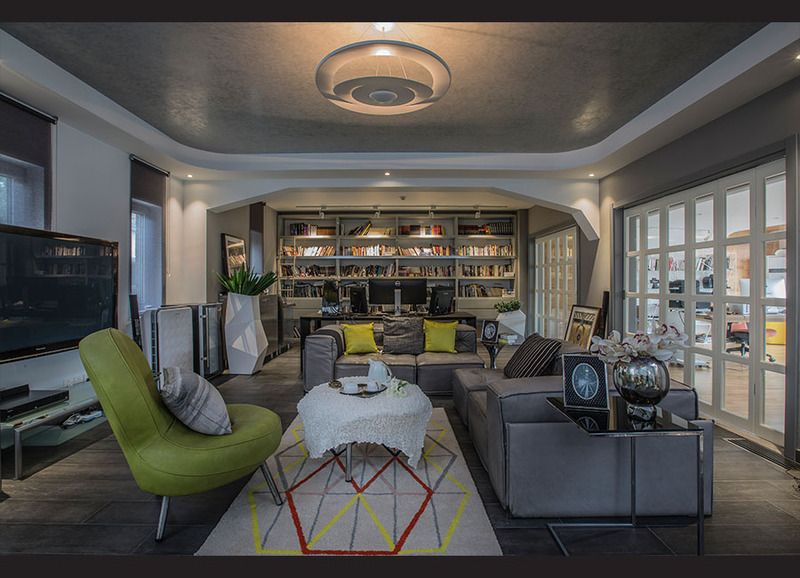 Casa is aimed at inspiring people with the quality of living and style. G.e.t. 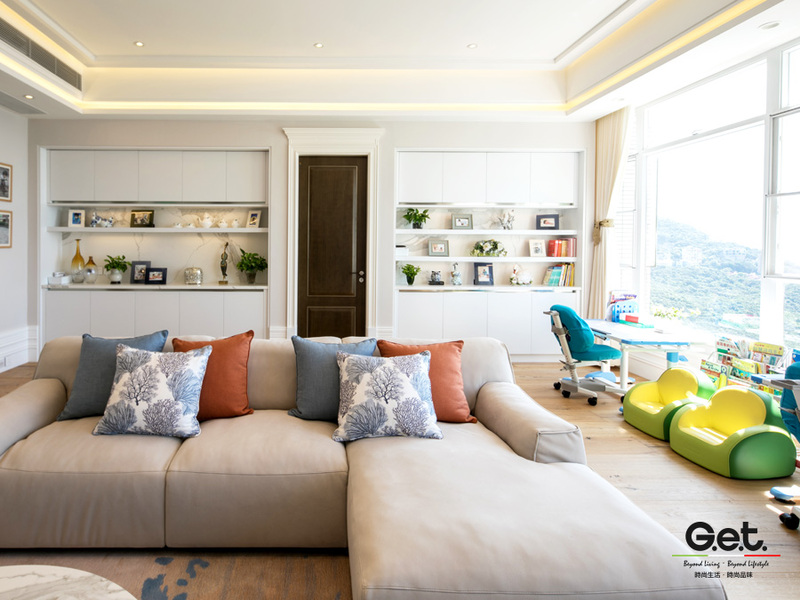 Casa applies the same design concept to create showrooms in different cities to create a strong brand identity, and allow people anywhere to experience the inspiration of a quality living and style, whereby G.e.t. Casa is able to create a better place for the Asian world. The presentations of products in showrooms have been created by a team of well-equipped interior designers with more than 10 years of experience. Illustrating the products with an actual appearance and decorated with decent exhibits, you could have an incredible journey in the world of quality ceramic tiles, parquets and wallpapers in the simplest and the most direct way. During our twentieth anniversary, G.e.t. 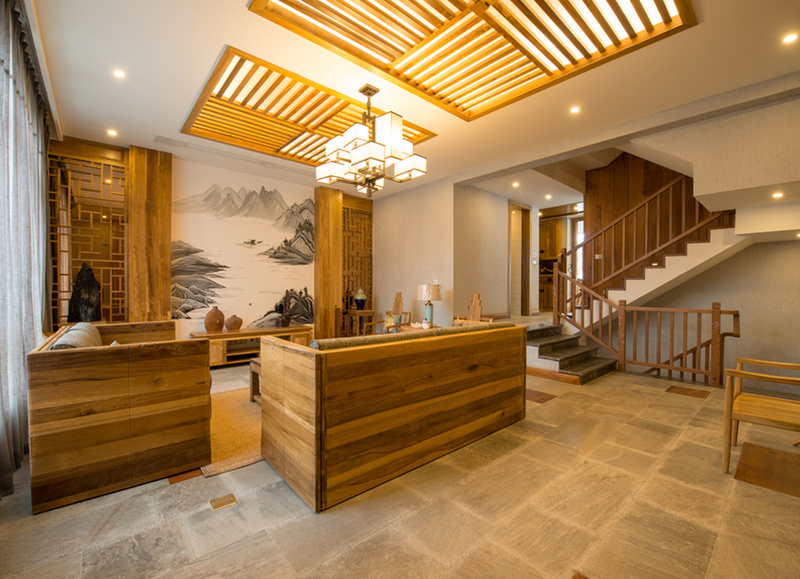 Casa once again receives recognition from our society, awarded the "Most Outstanding Enterprise Award 2019" and the honour of “Greater China's Most Reputed Building Decorative Materials Distributor”. Thank you for your support and recognition of our efforts, our product and service. In the future, G.e.t. Casa will stay true to our mission and keep moving forward! G.e.t. Casa will actively into social activities held by the "caring company" in the business, to promote business and social service sector cooperation, jointly foster a culture of innovation, caring and sharing, construction, care and share the achievements of social sustainable development. 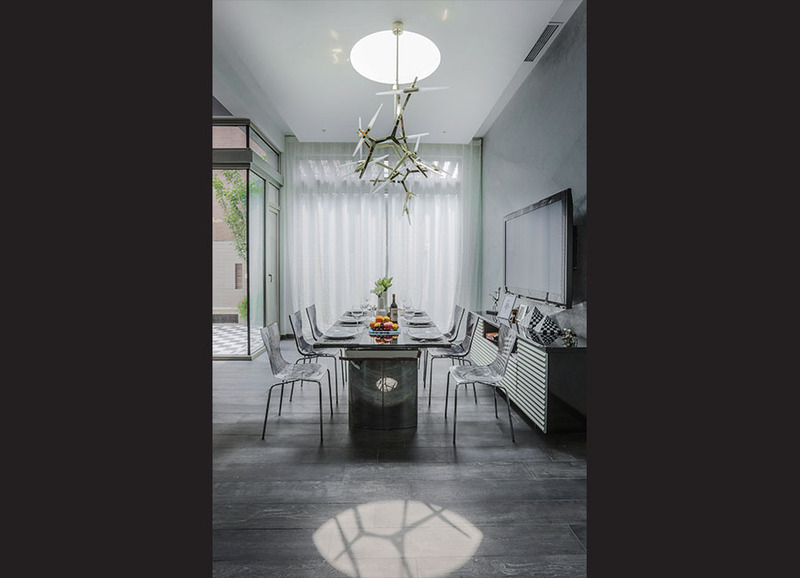 Weiguan Interior Design hopes to use the snow white, look for undefiled and natural, and show the quality connotation of elegance and entry luxury. The project is white as the main tone, white wall, embedded lockers, presenting distinguished and extremely beautiful simple style. G.e.t. 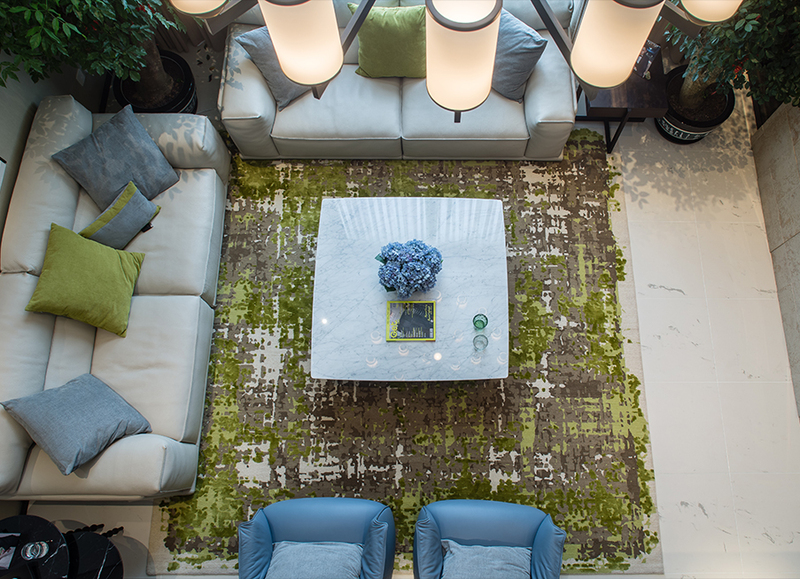 Casa and Ricchetti Group hosted design forum in Salone de Mobile Milano. 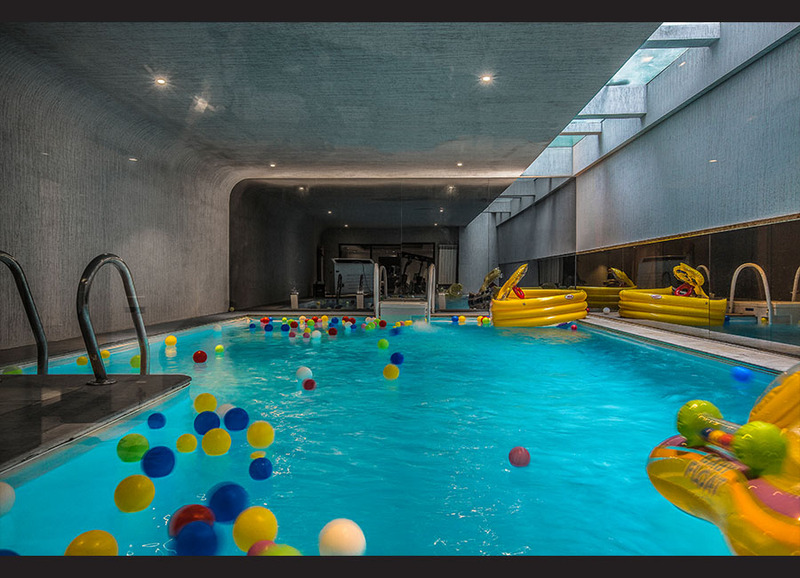 It is part of the charity based Architectural Design Award Competitions. We have honor to invite the prestigious international panel of jury: Barrie Ho MH, Sylvia Yammine, Gaby N. Khoriaty and Zhu Jingxiang. With the benefits of our close relationship, G.e.t. Casa invited Chief Executive Officer of Ceramica Sant’Agostino, Filippo, to have an interview to discuss the development of Italian ceramic tiles in China market. 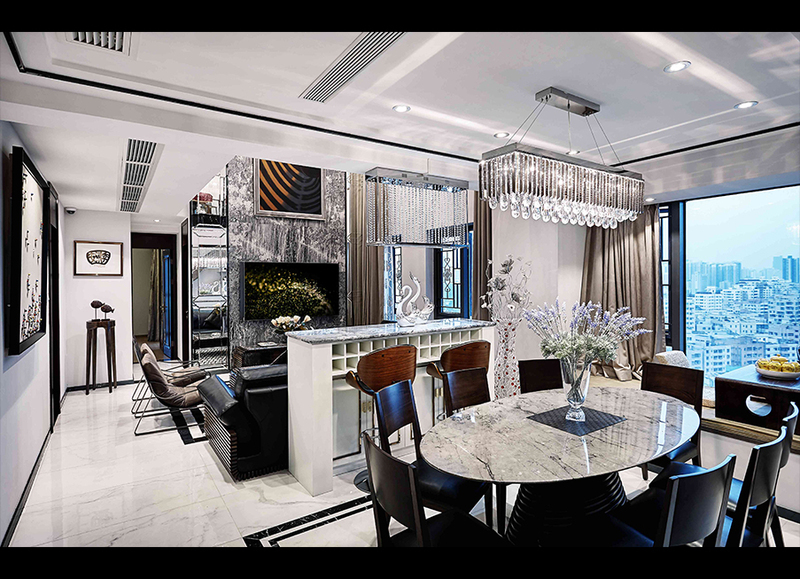 This project is a luxury apartment in North Point, Hong Kong, owned by a young couple. To satisfy the clients’ need for grey color tone and consider the need for a pair of young children, the designer considerably selects the high-quality tiles in softy grey tone. It is a new design located Wenling District, Taizhou. Light is the source of everything on earth. Time, space and life are the non-stop current, and closely related to lights. 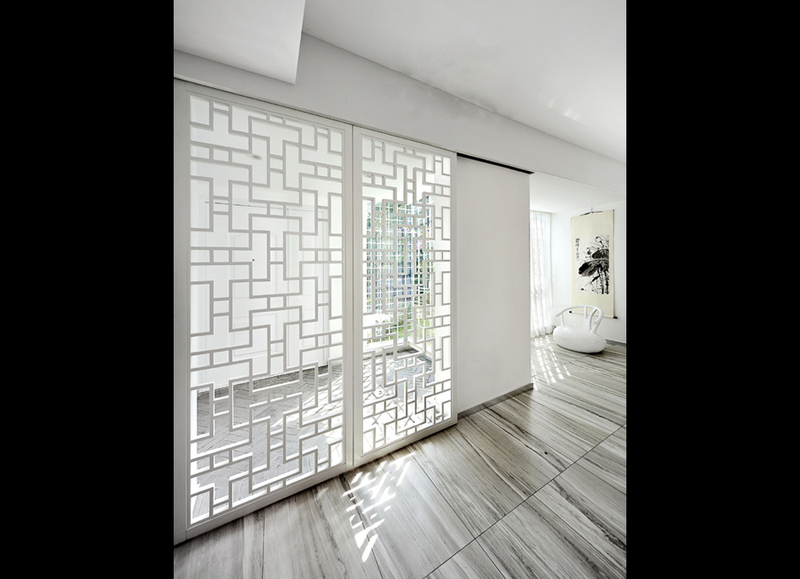 Designer of this project delicately brings light into the interior, allowing light to dissolve, spread and dye, while creating the inspiration for and leaving the marks of lives. What are you awaiting? A Wonderful Italy Trip will belong to you! The Registration & Submission Deadline of Architectural Design Awards Competition is now extended to 28.2.2018! Regarding to the response and the motto of the campaign, G.e.t. Casa now extends the registration and submission deadline to 28.2.2018 in order to promote the message to more design experts. They feel insufficient care. Hence, with the intention of giving a home and lots of love to these poor left-behind children, “G.e.t. LoveIN築動愛 2017” has been launched and targets to build a “Child Care Centre” to the left-behind children in Maozishan Village. 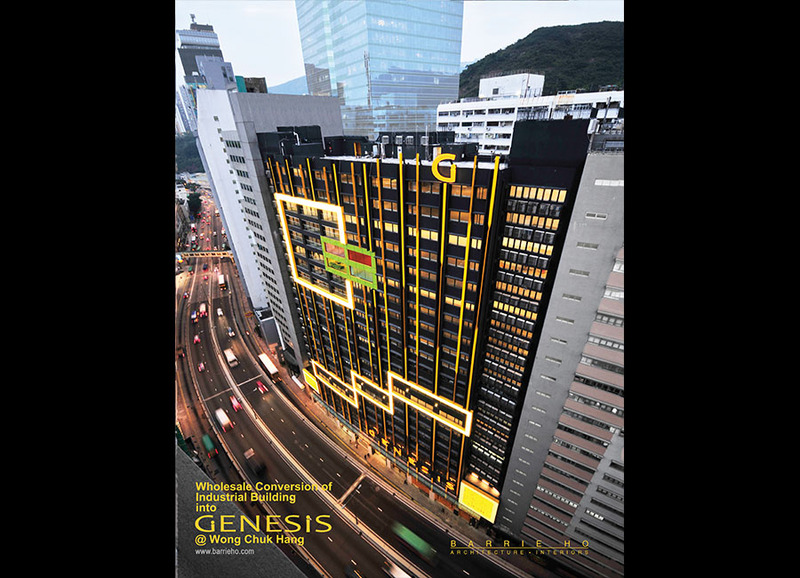 Annual limelight of architectural and design field “G.e.t. LoveIN築動愛2017 – Architectural Design Awards Competition” is now ON! In order to bring out the flash news of competition to the audiences, G.e.t.Casa has launched a series of touring conferences to introduce the campaign. "G.e.t. 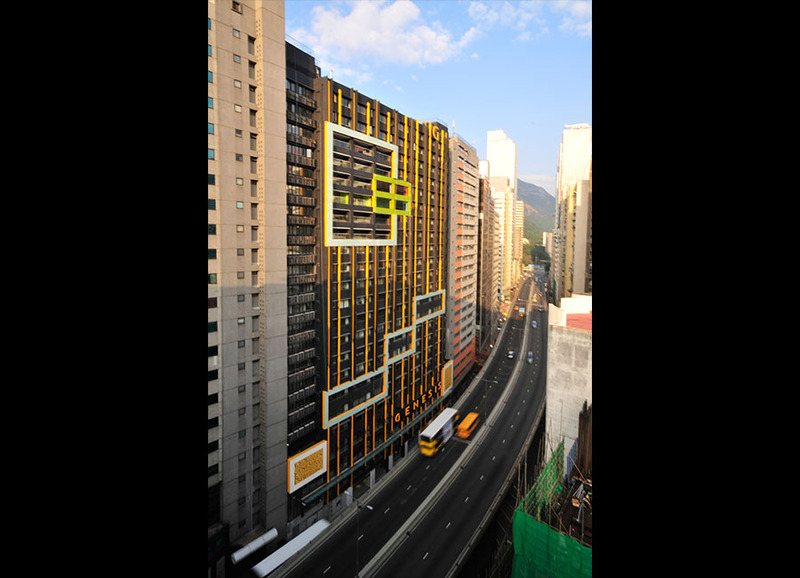 LoveIN 築動愛 2017—Architectural Design Awards Competition” is now open for application! As mentioned in Great Learning: “to cultivate the moral self, regulate the family, maintain the state rightly and make the world peaceful”. The family, as the starting point to make outstanding achievement in society, is just like a number of concentric circles with love as the common circle center and different tolerance abilities as their radiuses. The family is also the starting point of our life. On 15th Dec 2017, "G.e.t. LoveIN 築動愛2017" was grandly kicked off in Cimen International Brand Building Materials Centre at Shanghai. Uplifting the child development via "Child Care Centre", "G.e.t. LoveIN 築動愛2017" also aims to launch the Architectural Design Awards Competition. The charity project “G.e.t. LoveIN 筑动爱 2017” will be launched on December 15, 2017. Throughout this project, the “Child Care Centre” is targeted to be built and meanwhile, the “Architectural Design Award” is grandly promoted. On the 28th Oct 2017, an opening cocktail party which theme was “Venice Night” was grandly launched at G.e.t. Casa Cixi branch. 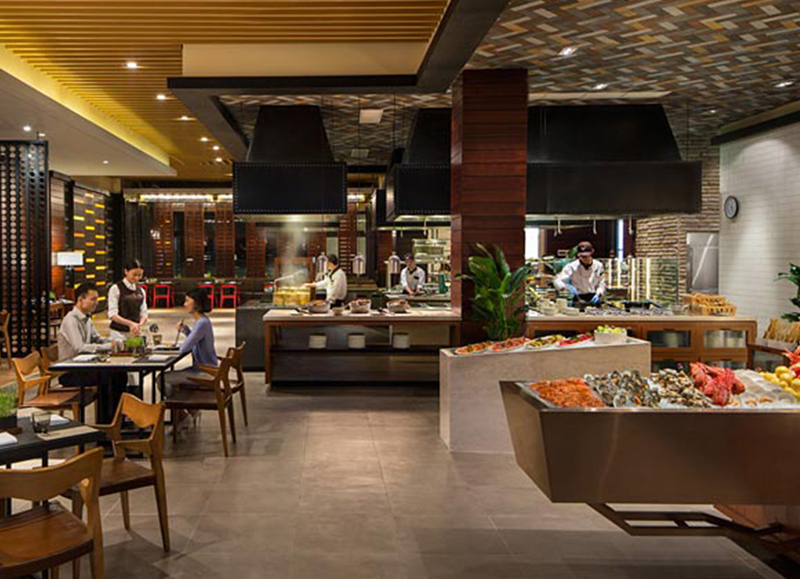 Shanghai OSTRA is high-end restaurants serving precious original marine ingredients. Coming through the door, you can see the fresh that are neatly stacked, including chefs` choice French oysters, Spanish Red shrimp, wild Iranian caviar, and all those from the original taste of the sea around the world. Sitting at the bar offers you an interesting dancing show of lobsters and oysters. 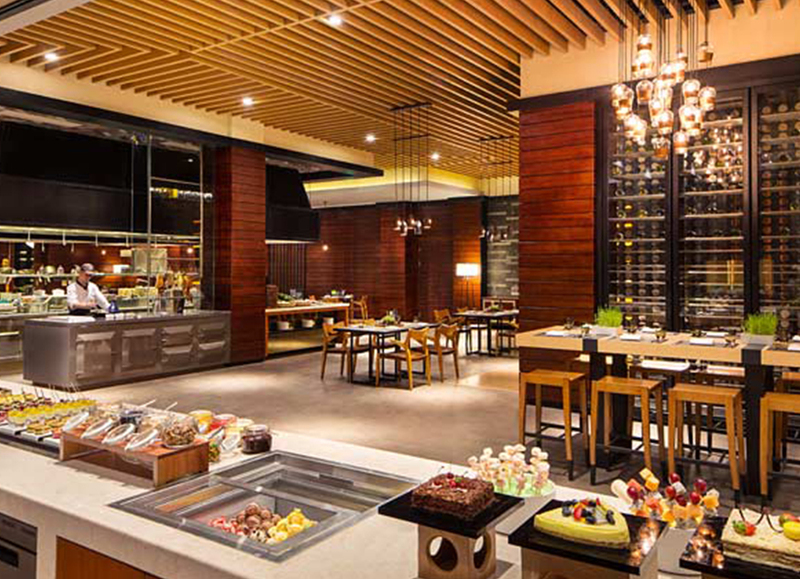 “Understated luxury with connotation”, is a well-deserved description for OSTRA. On 18th Oct 2017, G.e.t. Casa was pleasure to take part in 30th anniversary of CERAMBATH which was grandly held in Foshan. 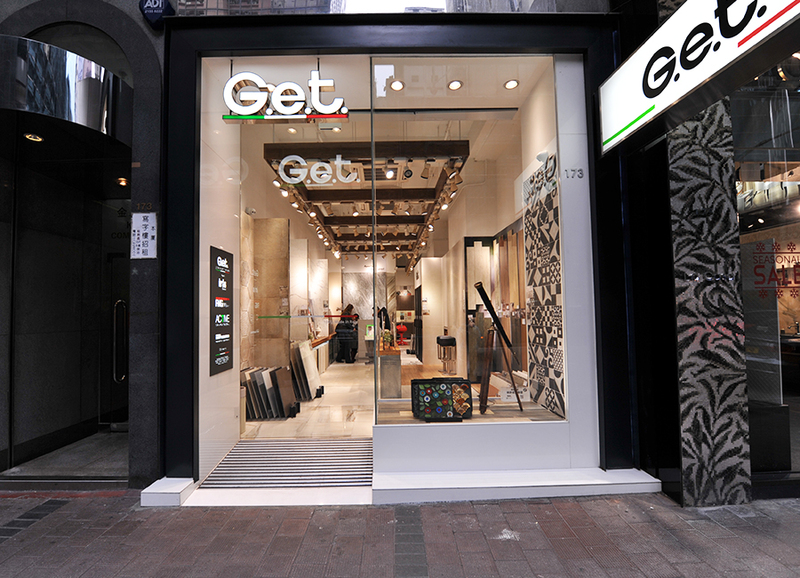 Presenting up-to-the-date, high qualified and trendy Italian building decorative materials, G.e.t. 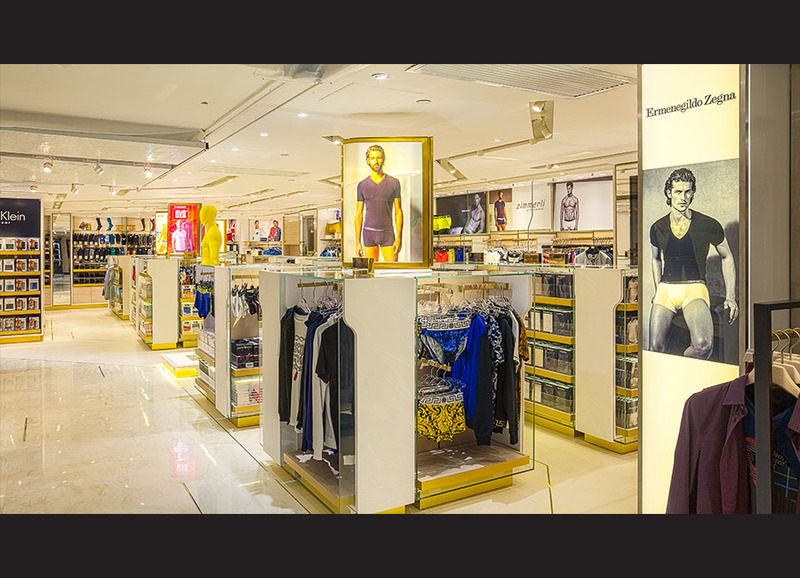 Casa was eager to lead the customers entering the world of Italian art culture and tasting the motto “Beyond Living, Beyond Lifestyle”. 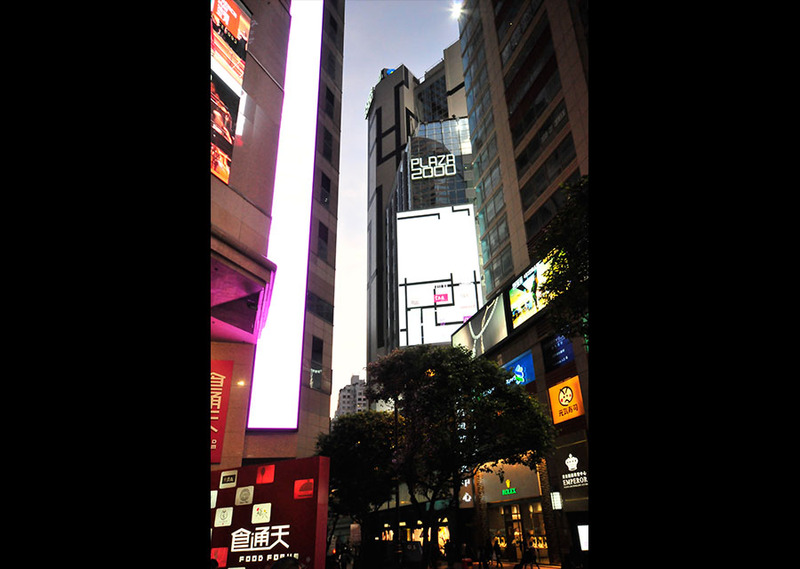 Poly YunXi is located in Bai-yun district of Guangzhou, near the famous Bai-yun Mountain. Embracing the scenery panoramic view of this natural oxygen source, the outdoor environment is beauty as heaven; we can imagine how exquisite the interior design is. This year, International Exhibition of Ceramic Tile and Bathroom Furnishings (CERSAIE) would be the limelight of the city during 25 to 29 September 2017. 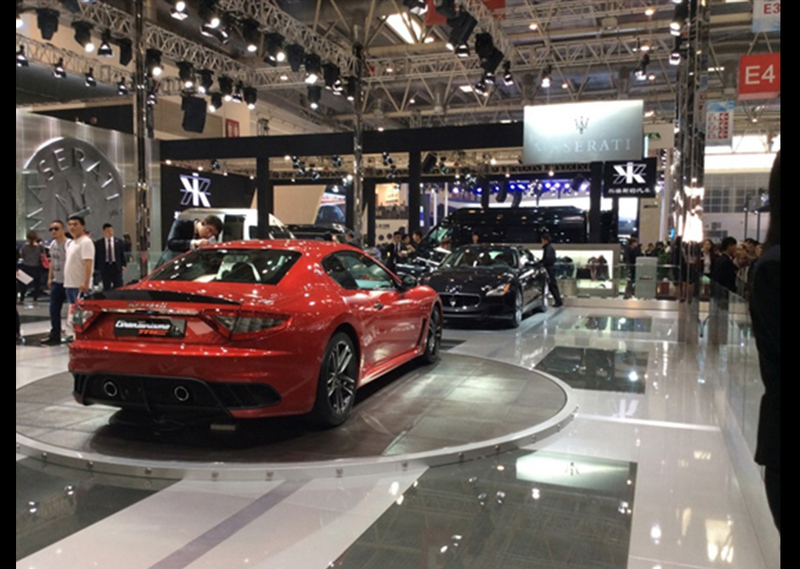 Thousands of branded experts flocked to the exhibition to explore business opportunities. There was no exception to G.e.t Casa which was as usual to attend the grand occasion. 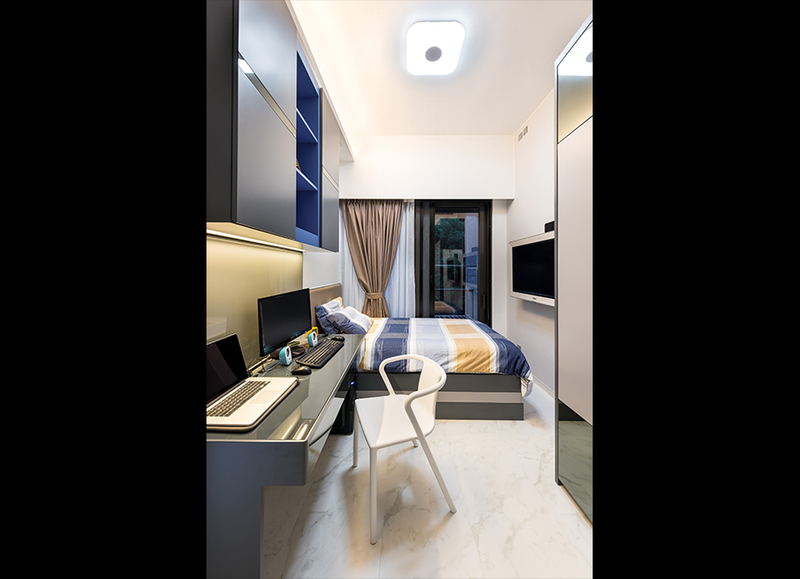 This case is a residential unit located in Shenzhen Mangrove West Coast, a place designed for a young couple with two children. 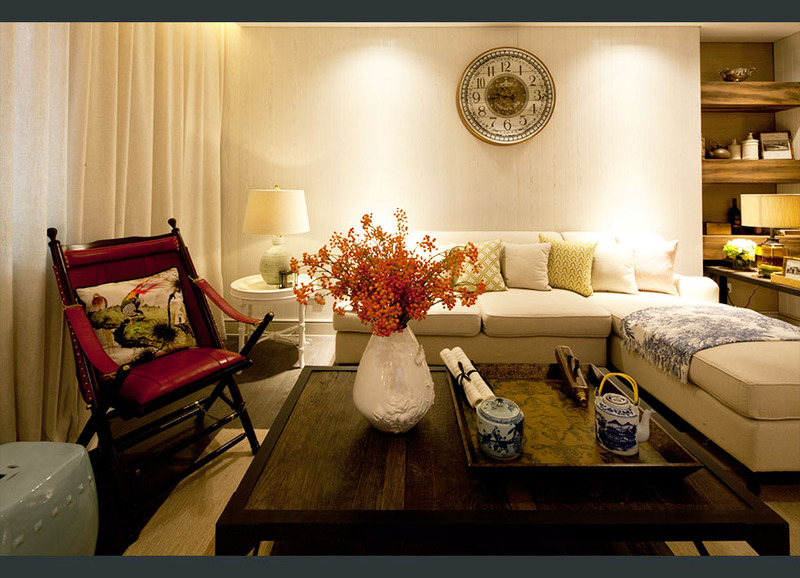 The owner advocates to the simple sense of elegant atmosphere, low-key style but rich connotation. The overall design is full of the echo of "nature", highlighting respect to "moral", as well as the owner’s strong deep love to his wife and children. When thinking about italian coffee, espresso is the first word that comes to one's mind. In Italy, it is not just a type of coffee; when you order un caffè in Italian, you will automatically be served an espresso. If you prefer your coffee a bit less strong, you will have to order a caffè americano (american coffee), an espresso to which hot water has been added, resulting in a drink that will still be stronger than the coffee usually served in the States or in the UK. The motorcycle industry has a saying: "America sells culture, Japan sells product, and Italy sells individuality". 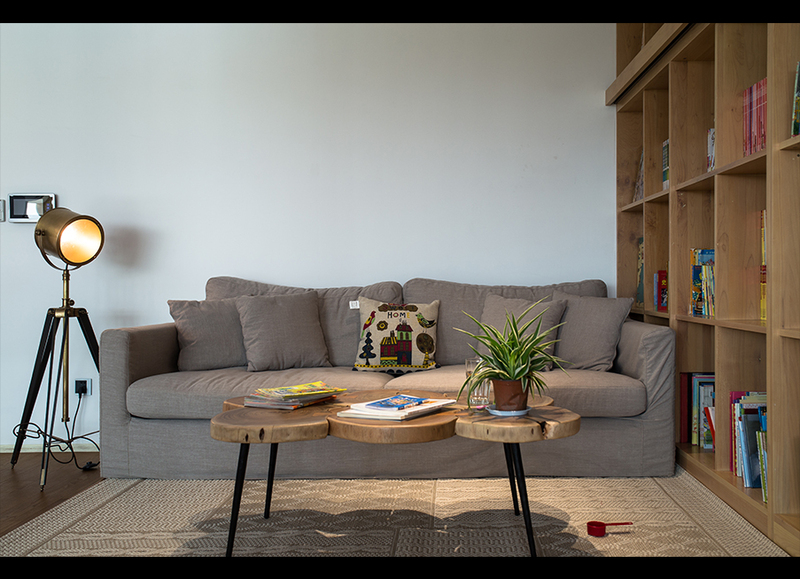 When talking about Italian design, the famous Italian writer and art critic, Umberto Eco proudly said: “If other countries have a kind of design theory, Italy is a set of design thought system, integrating both traditional and commercial. On the other hand, the American harley-davidson is on a different path, which is purely cultural. 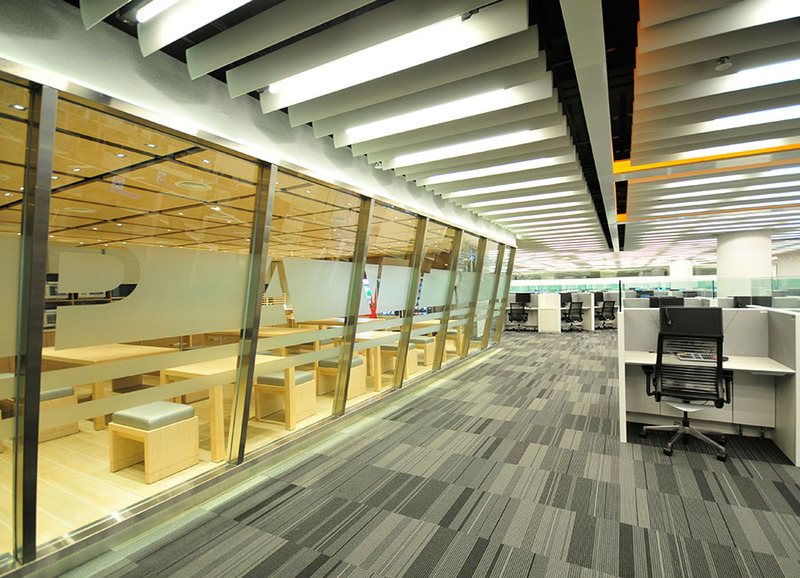 This interior design project is an office space located in the Da Biao International Building. 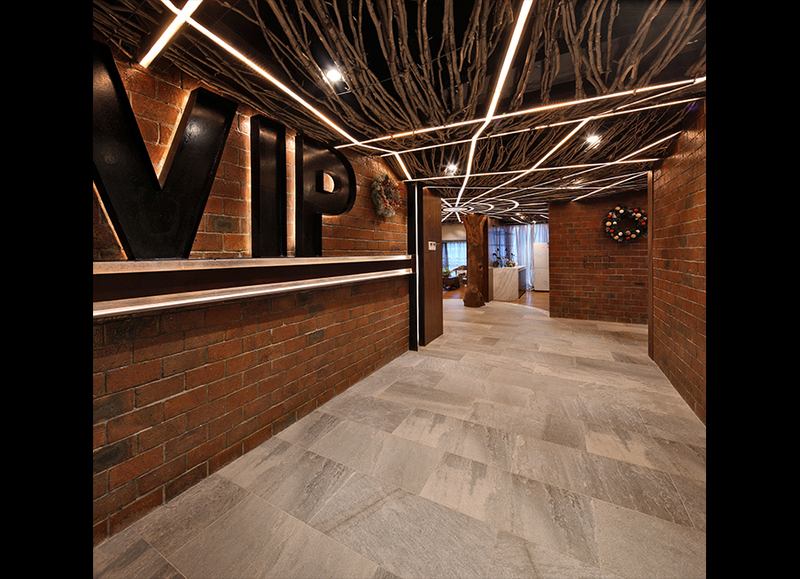 With the height of 5.8 meters on every level, majority office areas have applied the interlining to improve space utilization, except keeping the reception area the original height. There’s just so much to see in Italy: museums, castles, churches and landscapes, etc, the list goes on and on. But let’s be honest – a trip to Italy isn’t just about sightseeing. 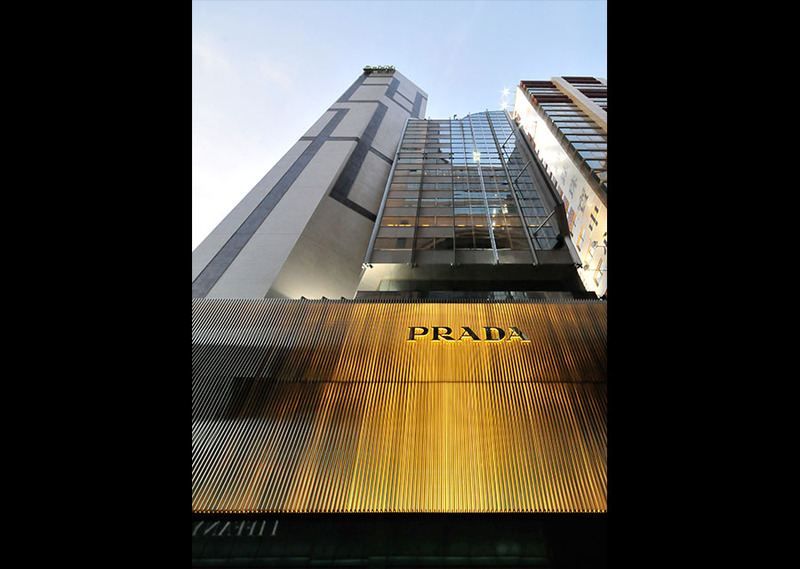 It’s also the perfect reason to indulge in some of the best shopping in the world. In Italy, fine craftsmanship is everywhere, and the opportunities to pick up luxurious goods – as well as beautiful budget-friendly trinkets – are literally around every corner. 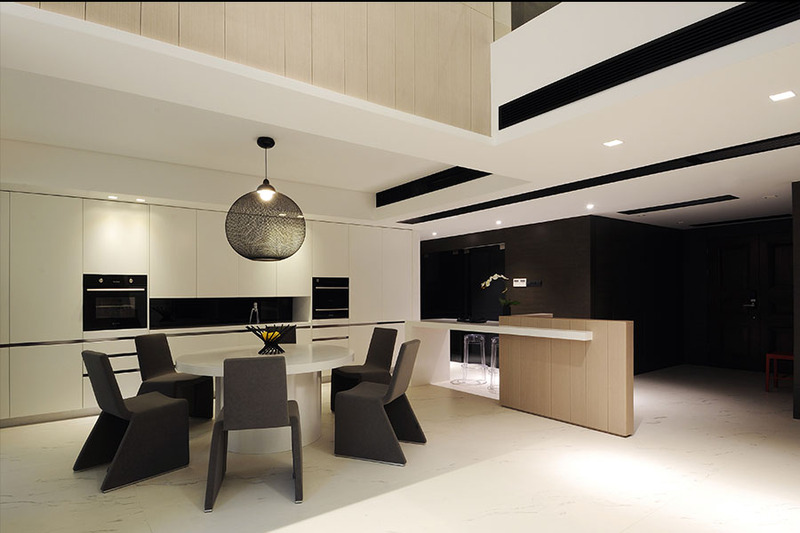 This project is a luxury house located in Malaysia, with an area of 800 square meters. 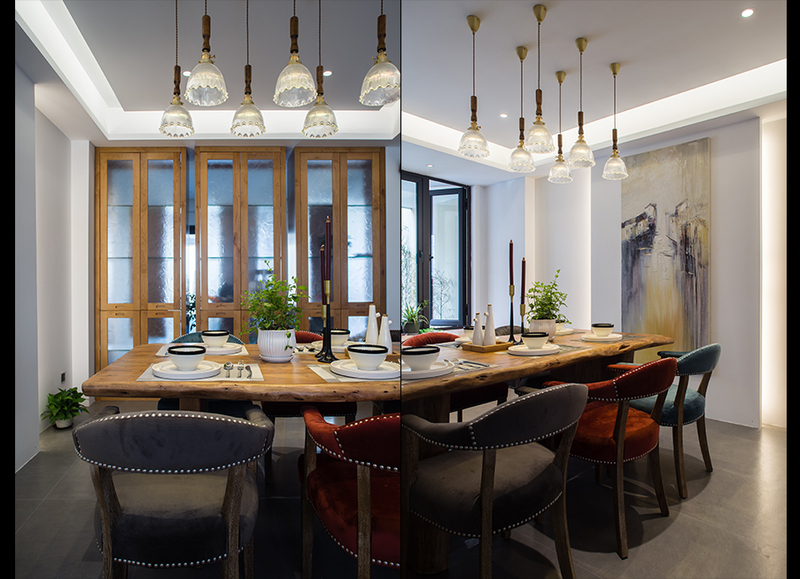 In this case, the designer switches between the sedate and leap from the vivid range of colour, and creates the atmosphere of different functional areas. The sedate colour is applied to sitting room, dining-room, family hall, while the kitchen, toilet, master room, guest room, children room are adopted with concise active colour. On 13th August, 2017, a new G.e.t. 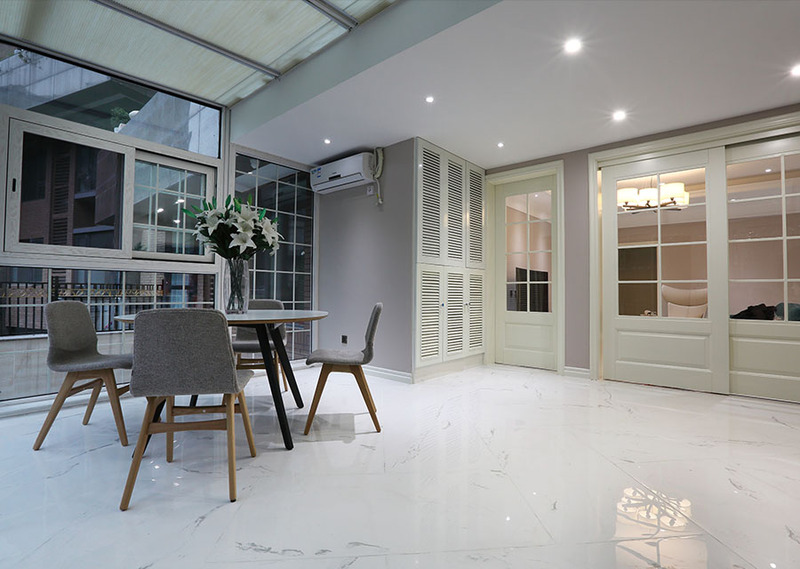 Casa showroom has opened in Yuyao Redstar Macalline. With plenty guests’ witness, including architects, interior designers and working partners, G.e.t. 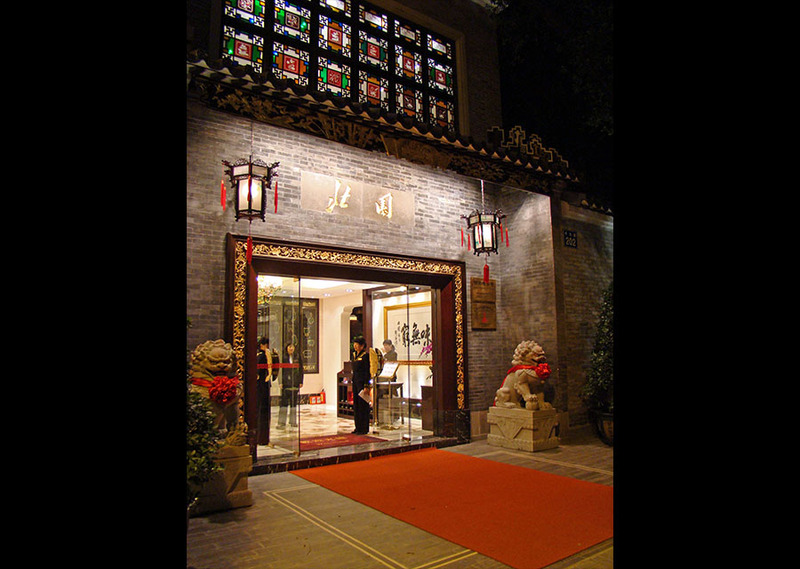 Casa Yuyao has shown her charm on the stage of fashion and stylish. 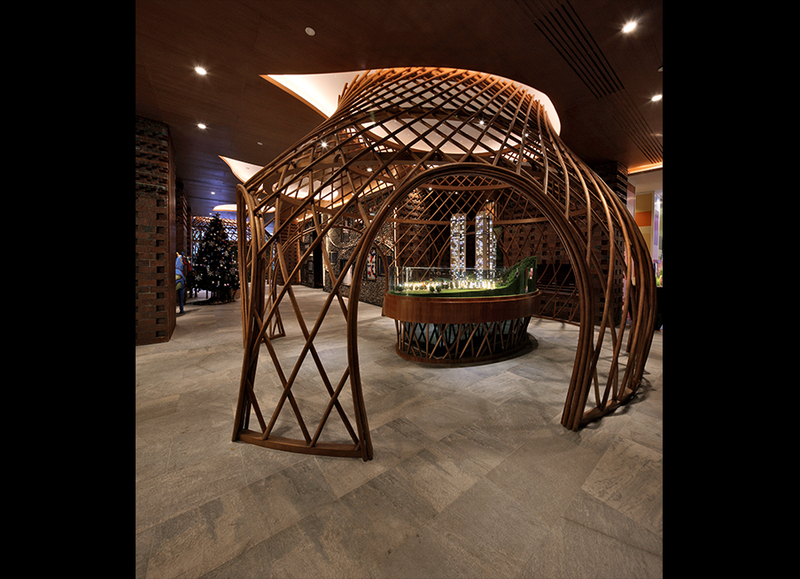 JOY BOX is located in Sino-Ocean Taikoo Li, Chengdu, a salad paradise for families, lovers and friends to explore healthy food. With the aim of providing the guests unlimited experience, JOY BOX not only focuses on delicious and healthy food. 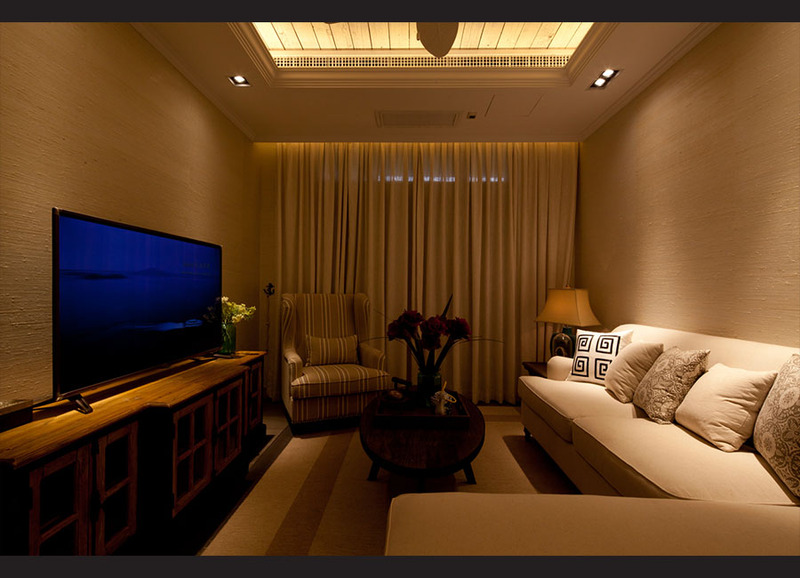 Comfortable environment is another important reason for a customer to stay. Holding a Swiss Pass gives you a privilege of using all public transport vehicles in Swiss, including trains, cruise ships, long-distance buses, and city buses, for a duration within the valid period. It is also free to visit more than 400 museums around the country, including popular tourist attractions such as the Olympic museum in Lausanne and West Yong Castle. In Europe, only Switzerland has a pass that covers public transport across the country. Take it, and the traffic and attractions in Switzerland won't bother! Dining is always a big part of travelling. Wherever we travel, we should always pay attention to the rituals and rule of local dining, in order to have a wonderful dining experience and hence a memorable journey. The following will tell you some of the Italian dining etiquette. Besides being able to enjoy local lovely foods, hope you will also be able to have a wonder dining experience with your families in Italy. 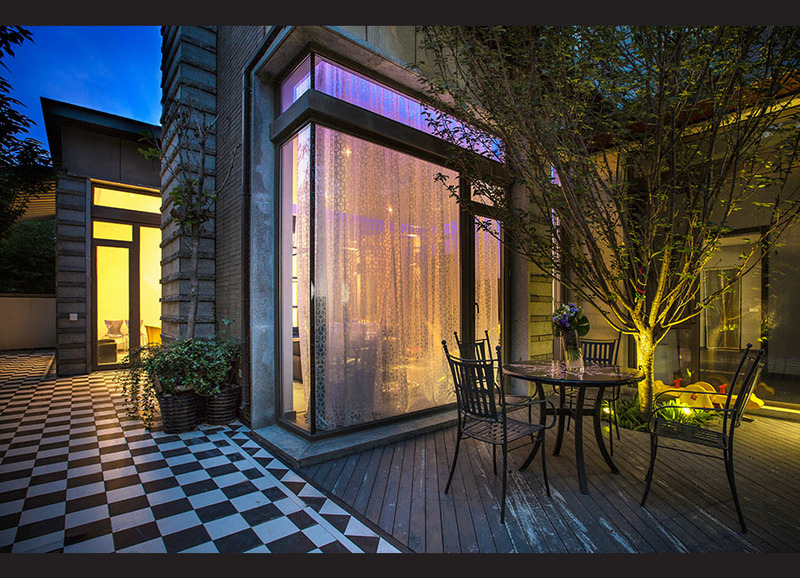 Located in an ecological area in Chengdu, China, it is actually an elegant design project for a luxurious mansion. 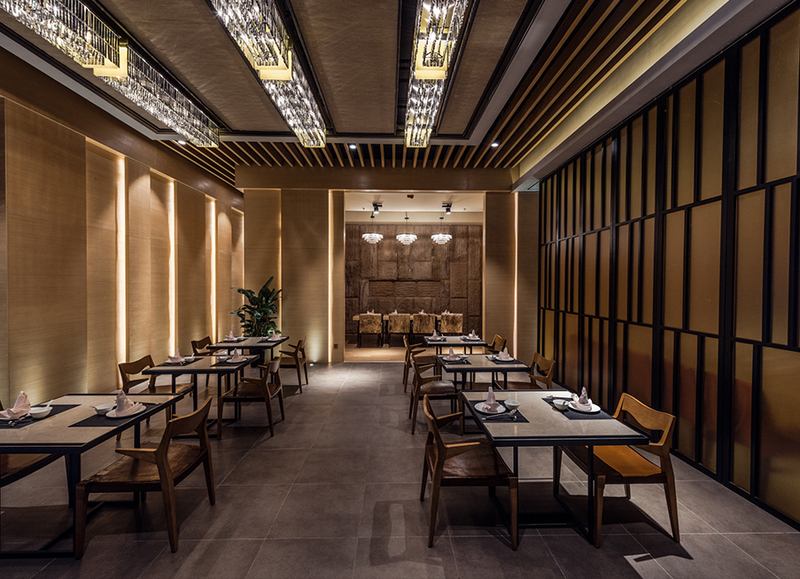 The tension and contrast between the contemporary elements and the classical Chinese environment are the features of the design, which give people the feeling of time travel. No more limits! Visit G.e.t. 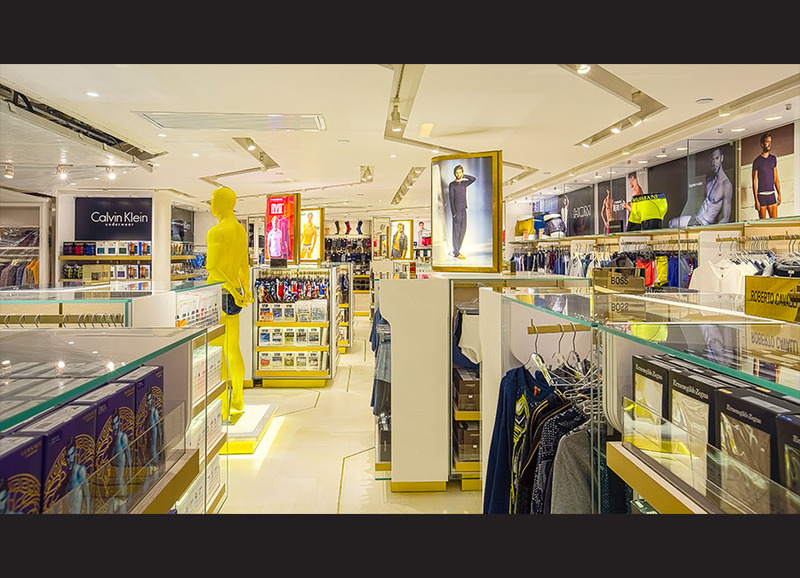 Showrooms through VR technology. Modernity and simplicity are the foundations of G.e.t. 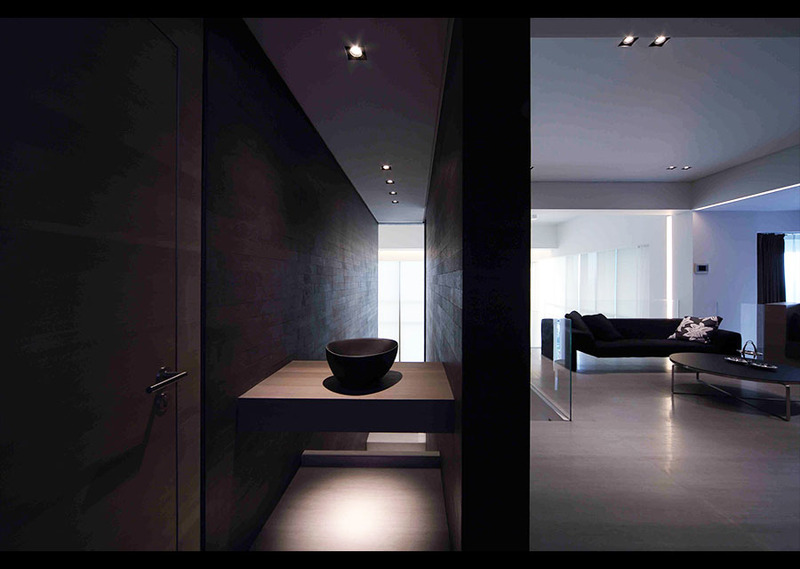 Casa showroom design. Through designs of the interior and presentation of products, G.e.t. 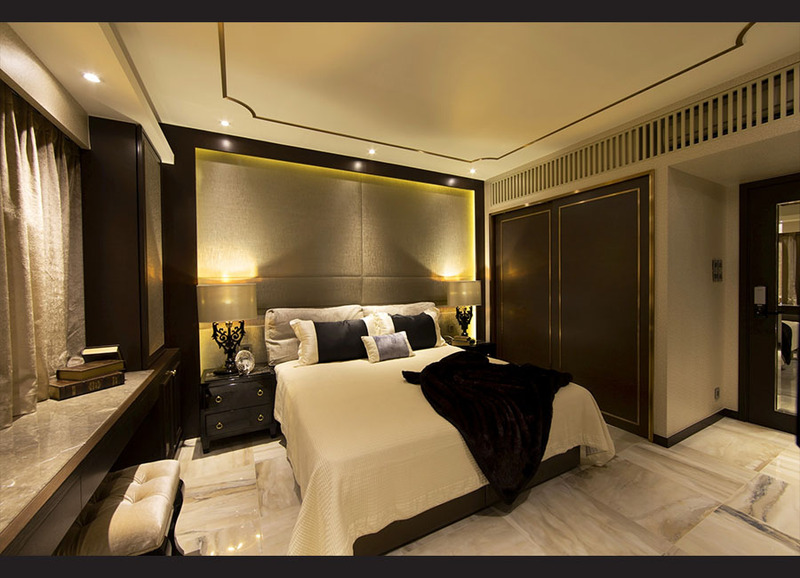 Casa is aimed at inspiring people with the quality of living and style. G.e.t. Casa applies the same design concept to create showrooms in different cities to create a strong brand identity, and allow people anywhere to experience the same inspiration of a quality living and style. In early July of this summer, G.e.t "2017 Franchise Strategic Conference" was held in Phuket, Thailand. G.E.T. 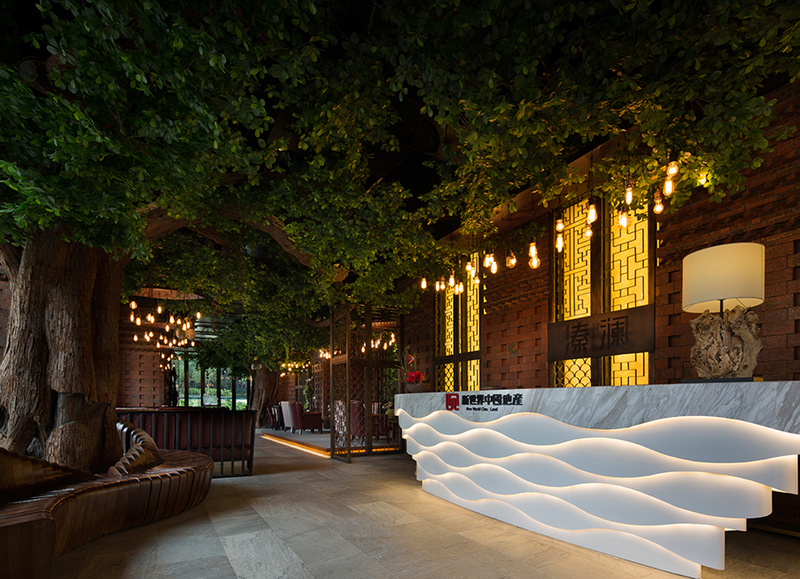 has invited the representatives of franchisees all around China, and brand partners: Ceramica Sant'Agostino, Cerdisa & Cisa and Cambria, all gathered in this picturesque scenery, to share with each other, and further explore the business strategy. "Less is more." is always recognized and advocated in the world of design. However, there are too many outside factors that limit and strain designers to input “MORE” rather than creating a design in accordance with the original concept. 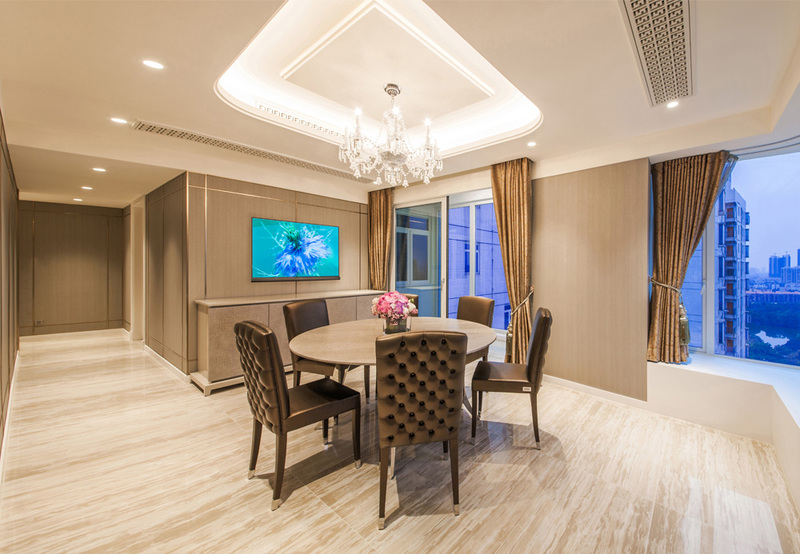 The Riviera is one of the luxurious residential properties in Zhujiang New Town, Guangzhou. 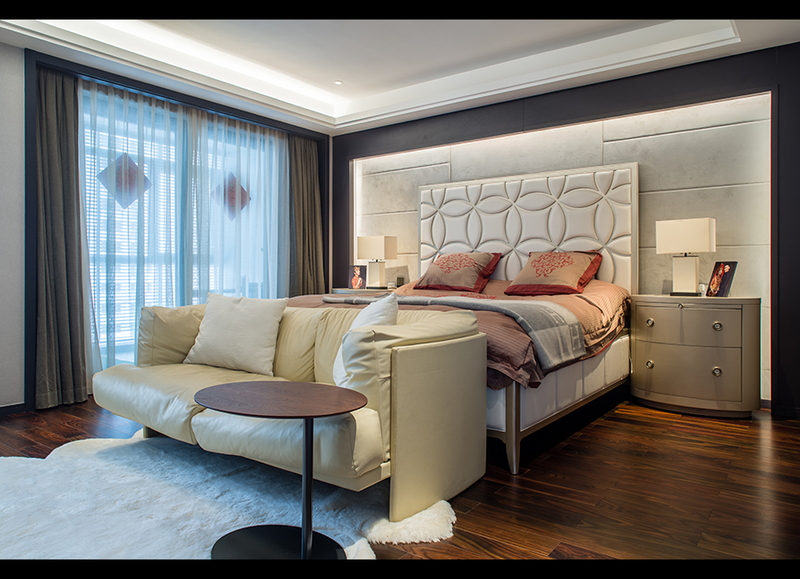 In this project, not only emerging the Chinese and Western elements, the designer creates a modern environment of style. This penthouse is built at an area that is so close to nature: Mountain, beach, country park, horse-riding, golf club, you name it. Owner of this house adores cleanliness and nature, as simple as it sounds the concept of this house is based on the color and use of natural materials. Italy is named as the capital of design. In the past, the architectures across the ancient Europe had been greatly inspired by the ancient Italian architectures. However, after a number of historical and cultural moves that led to the revolution of other styles of European architectures, the phenomenon of the Italian architectures had also been affected. In the coming paragraphs, we will disclose several styles employed in Italy after the Roman period. 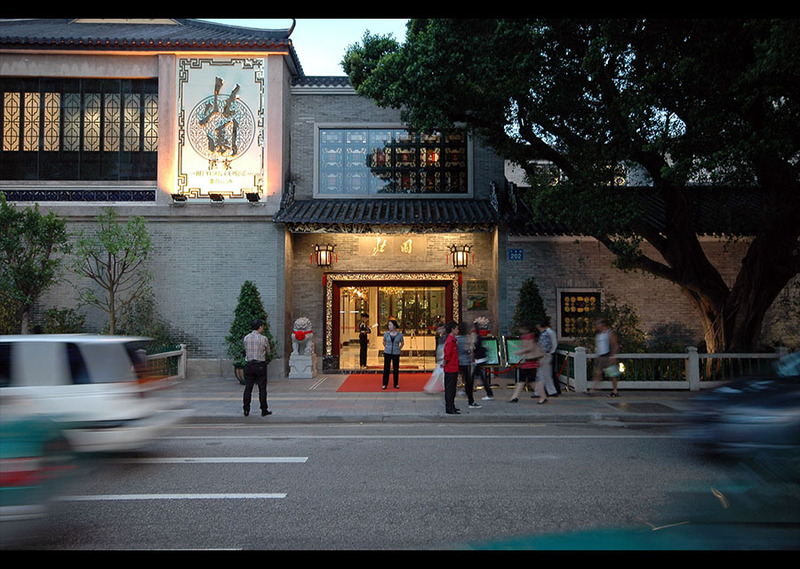 In the Milan Road, Tea Garden, Nan’an District, Chongqing, China, there is a project in which the designer uses a modern design language to illustrate the pursue for the perfection of arts. By not making any exaggeration, pursue of nature is achieved by simplicity, providing a quiet yet comfortable living area for modern people. Just being simple in every aspect of our lives. 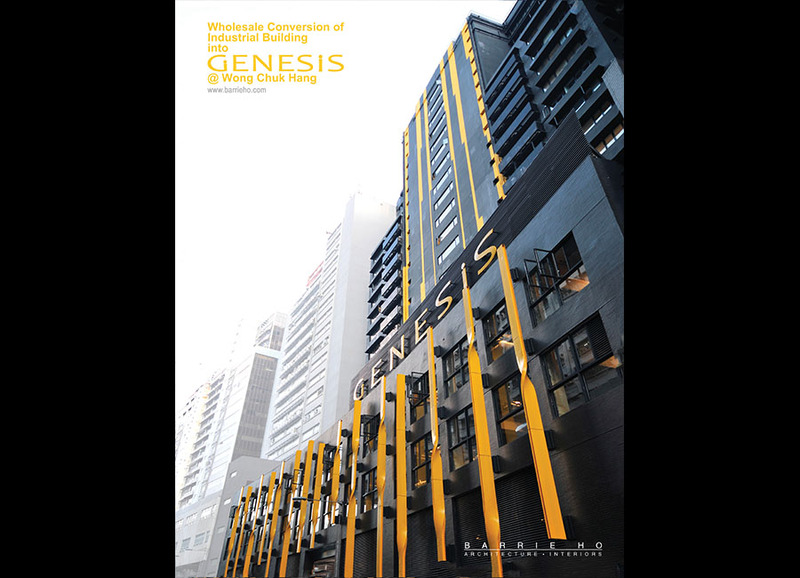 This project is a luxurious 3-room apartment in Island Resort which is a high-end residential property located in Chai Wan, Hong Kong.G.e.t. Casa provides a wide range of tile elements. 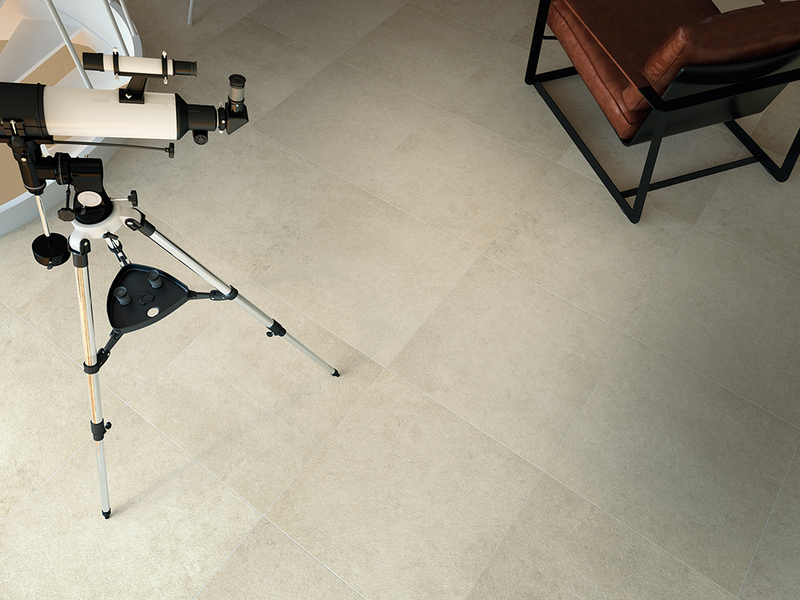 The Mamocrea Collection by Sant’ Agostino Ceramica is used for the flooring. 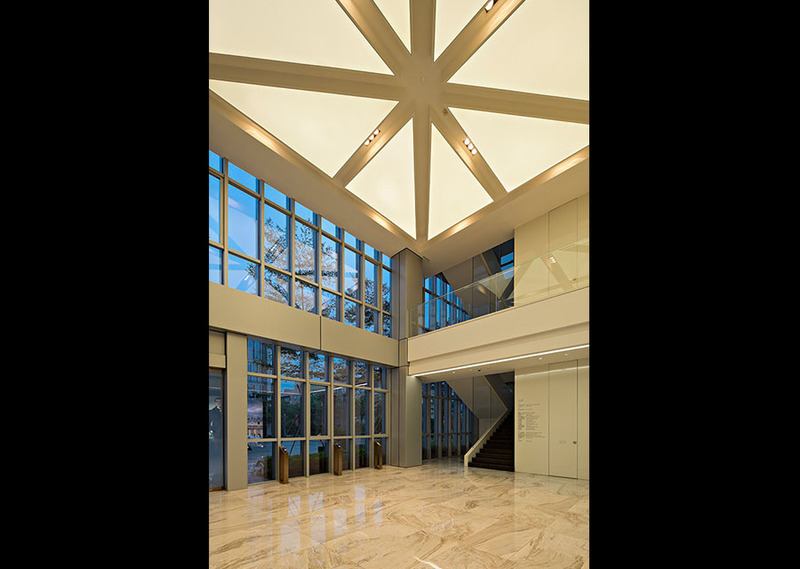 Its clear and detailed pattern of the natural marble enriches the visual details and elegant ambience of the space. 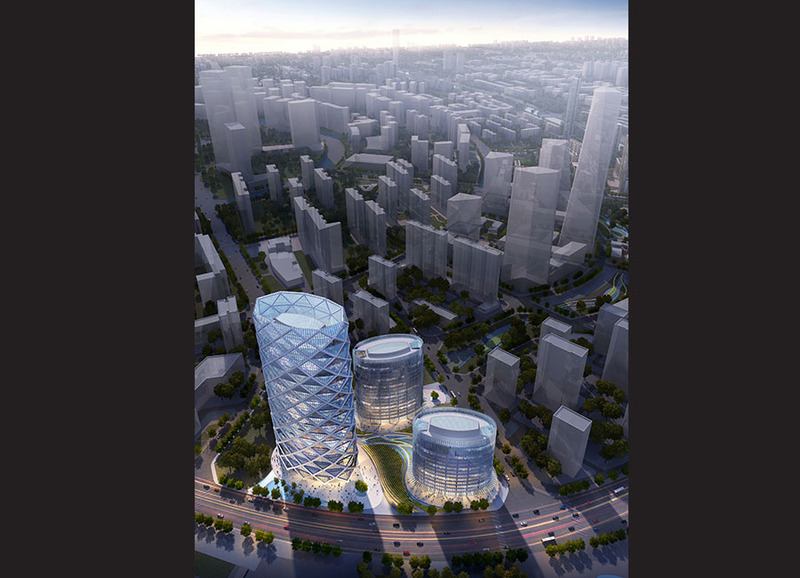 This project is located in Jianye Region, Nanjing, confronting Jiajiang River and Yangtze River. 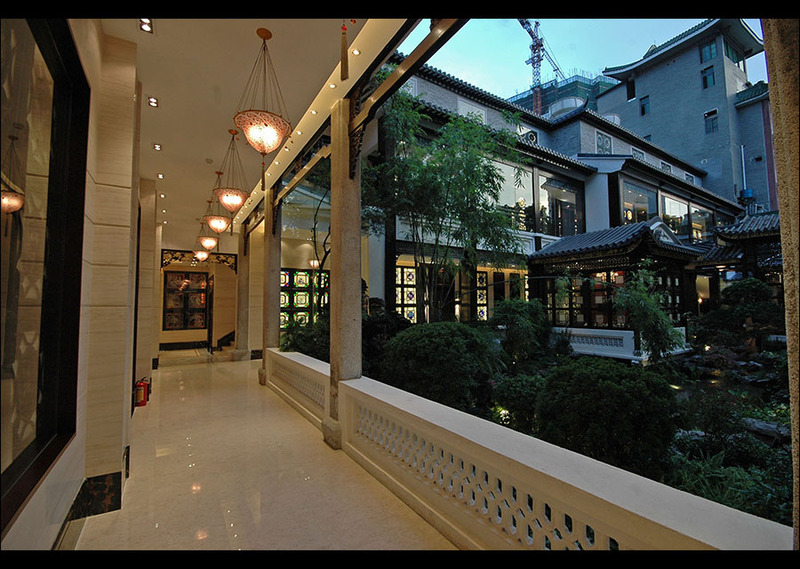 The whole property of Tian Zheng Bin Jiang is positioned as a rather high-class property in the region. 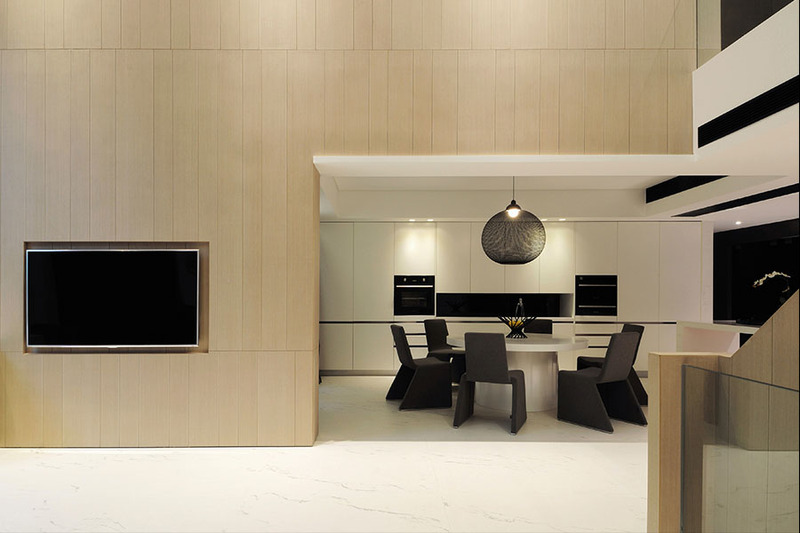 In this project, simplicity plays as the main concept for the interior design. 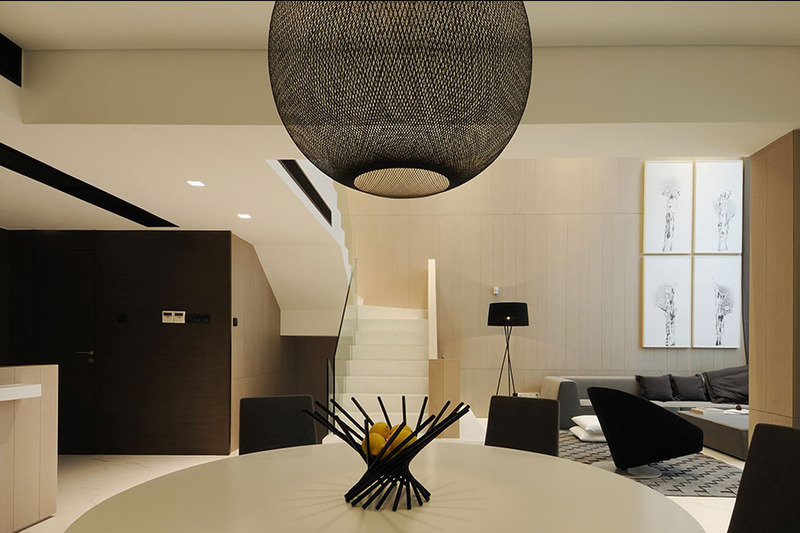 The color combination of black, white and grey provides new inspiration for the interior. The depth of colors defines the freshness and complexity. Given the needs for the satisfaction of functions, it has also connected everything, from space, human and objects into something relatively remarkable and meaningful. G.e.t. 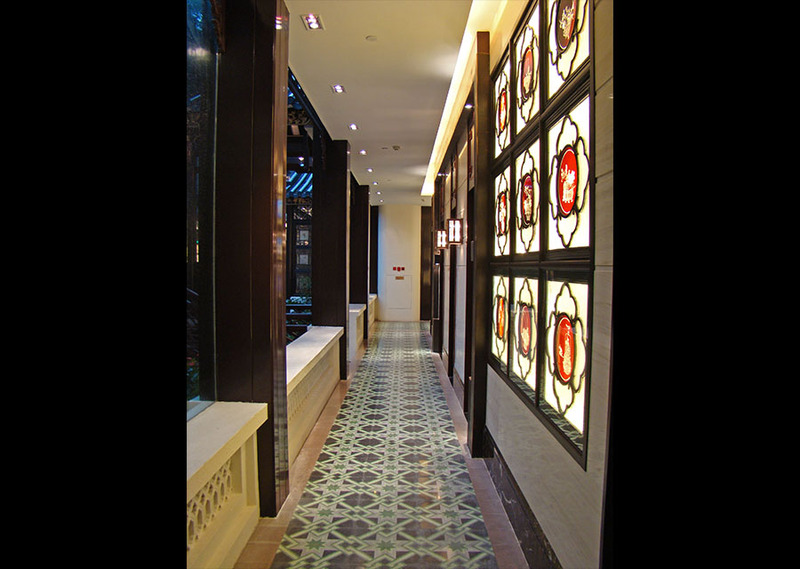 Casa is proud to provide flooring tile products for the integration between the interior and the exterior of the resort. In the area of a Chinese restaurant, tiles by G.e.t. 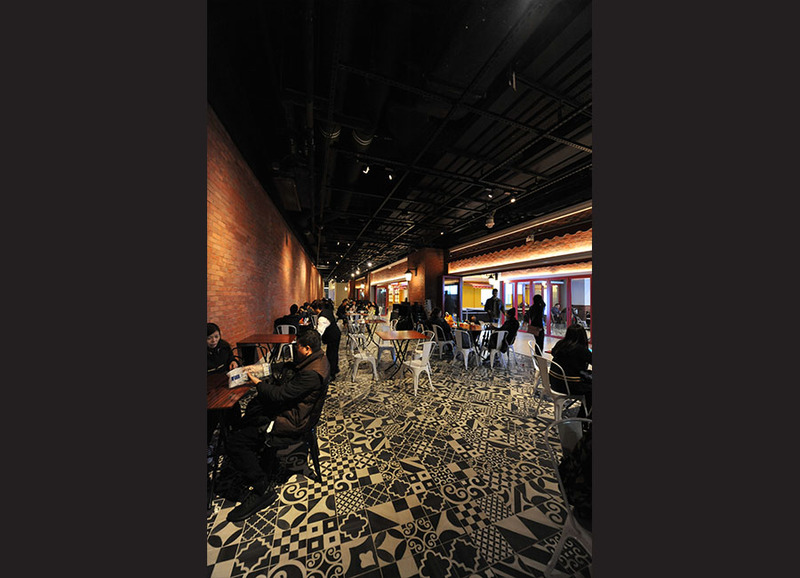 Casa is laid on the floor, which symbolic pattern and colors add a dramatic and filmlike sensation into the area. On the contrary to the brick wall, it creates a strong sense of integration of the western and eastern colors. G.e.t. 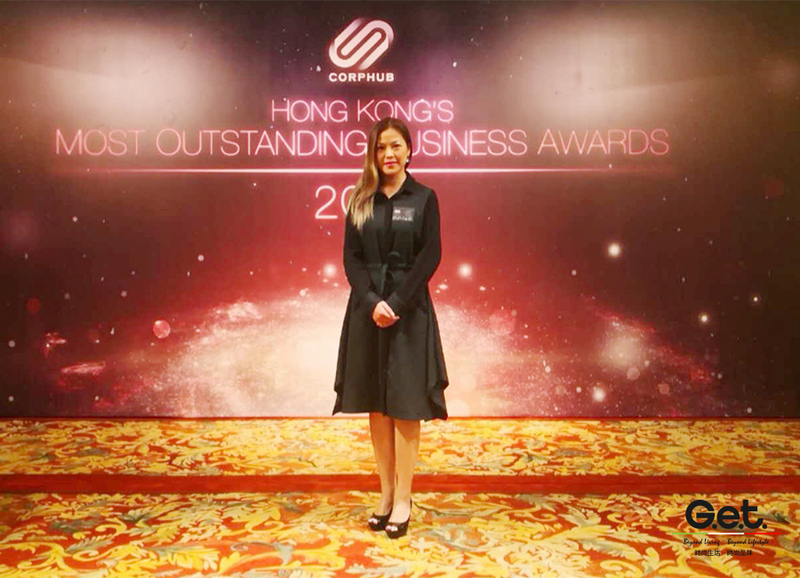 Casa is honored with the “2017 Famous Brands Hong Kong” at April, and being invited to attend the “2016 Famous Brands Hong Kong Awards Presentation and 2017 1st round Selected Brand Announcement” event, held at Hong Kong Domain Mall on 20th April 2017. 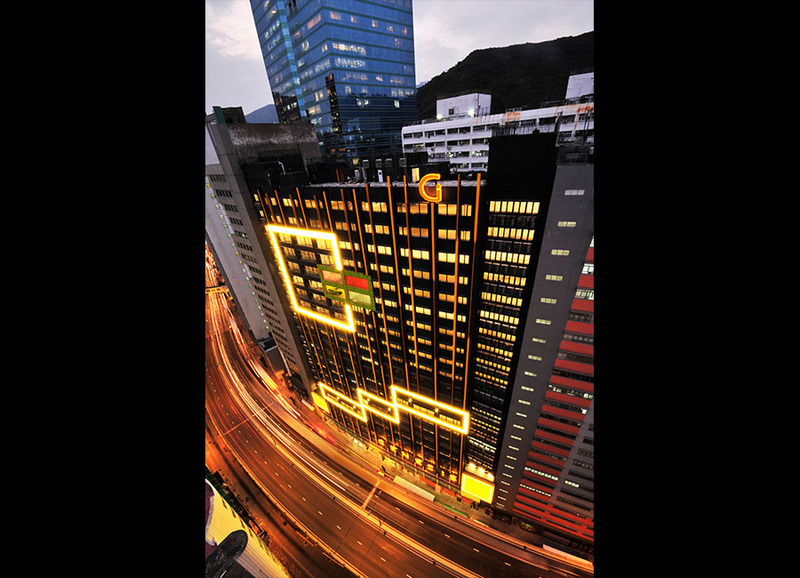 Mr. Kim Cheng, the Associate Partner of Hong Kong district, represented G.e.t. Casa to accept the honor on stage. The project is the first operating shop for LePur, a young Beijing based brand focused on producing high quality fresh yogurt. The client was asking to design something related to the traditional image of a yogurt shop, white and clean, and yet reveals the values of health, fresh and natural with a more contemporary, young and innovative image. “2016-17 GSDA Ceramic Art Innovation”, a world-wide design competition co-run by G.e.t. Casa and the Italian Ceramic Manufacturer – Ceramica Sant’ Agostino, has been accomplished in last year. Following the creativity sowed on the tiles, today it is a flower blossoming time in the early spring at Milan Salone Del Mobile Design Week. 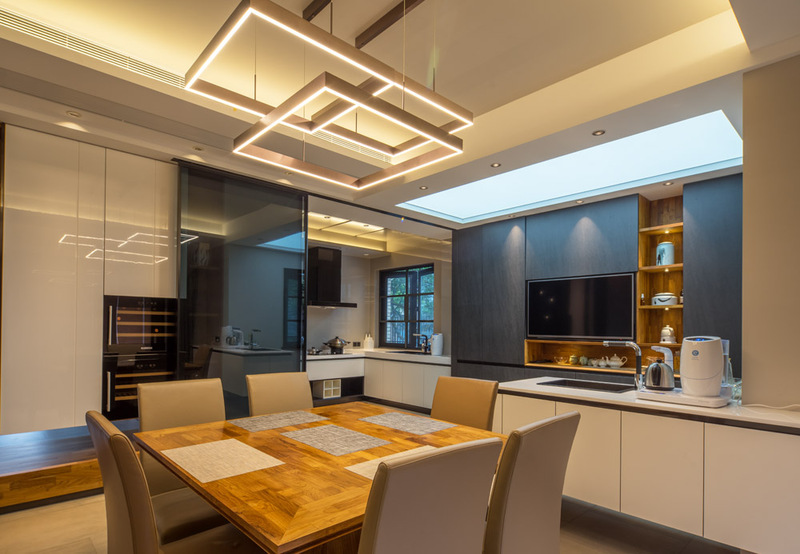 Some people perceive that “Interior Design” is simply about fully or partially removing, reseting and placing any new furniture and accessories to decorate, etc. 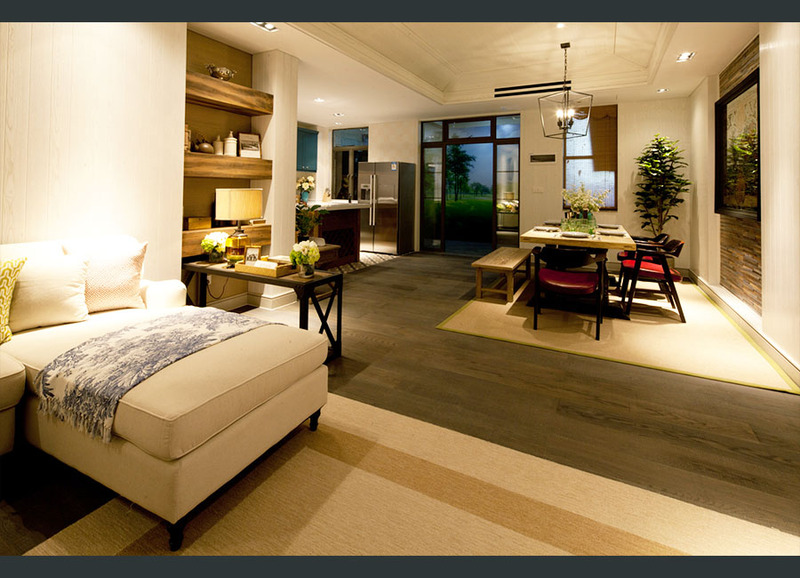 However, “Interior Design” is more than just that. In fact, it is a knowledge that covers a wide range of fields. Those fields include Arts, Construction and Architecture, etc. Furthermore, sometimes and somehow “Interior Design” is no longer only about the interior, but also about the emergence of the interior and outdoor surroundings. 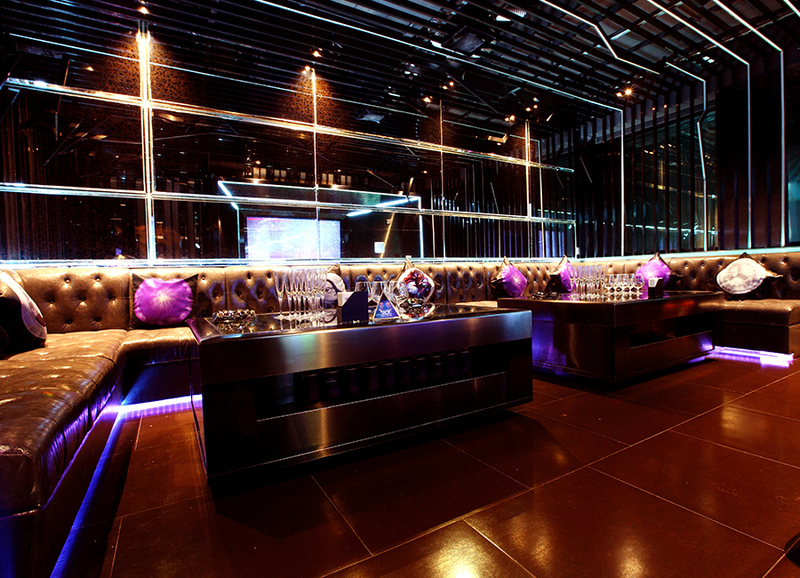 It allows the interior to absorb the outdoor ambience and extend the interior sensation to the outdoor environment. 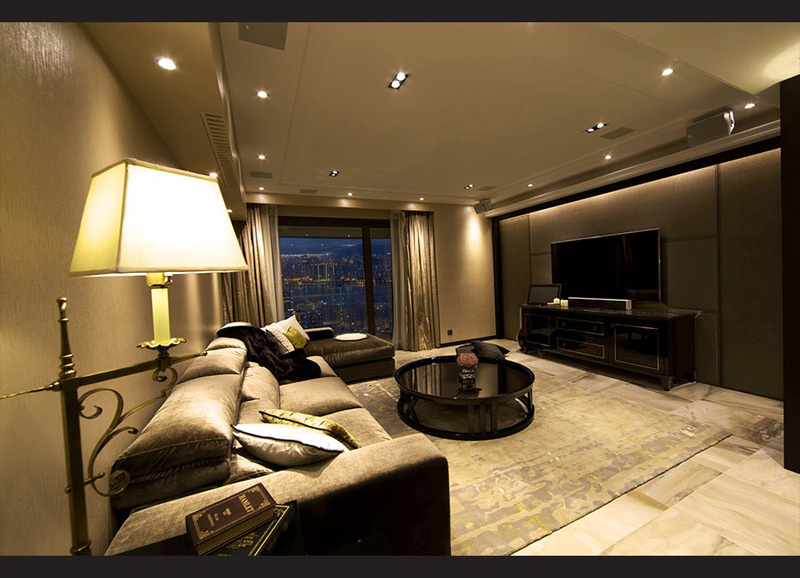 It enables us to feel the preset ambience even in the surroundings of the interior. The linear site originally fosters a linear narrow architectural block with a juxtaposition gesture. 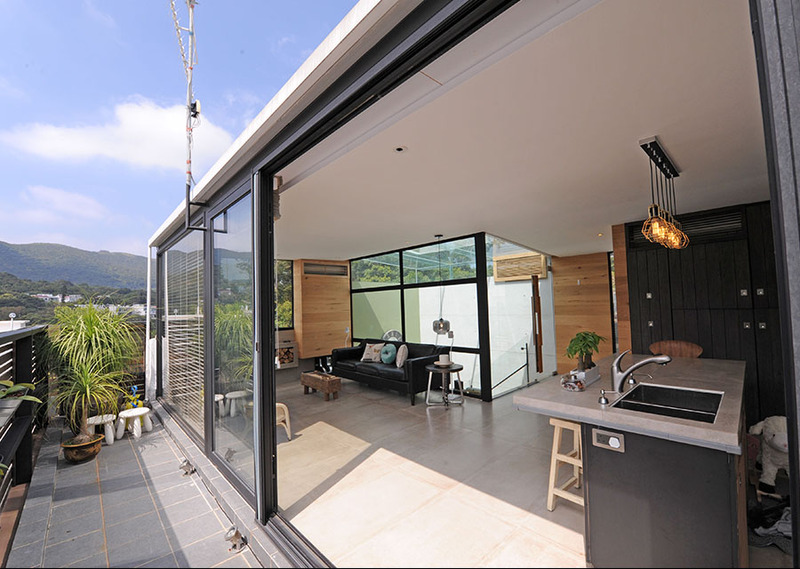 However, the 180 degree sea view fosters a stronger Superimposition setting by opening up the architectural massing to create a central void for both airiness and openness as well as creating a strong visual linkage around the interior of the Lodge. Grey was traditionally regarded an uninteresting color. However, if used carefully and skillfully, grey color is able to create different gradient style with different visual effects. In the world of colors, Grey has a neutral characteristic. When used alone or as the main tone, it is able to provide a comfortable vision and sense. While matched with other colors or used as a transition, it is able to loosen the contrast between colors, softening the edges and corners between tones. 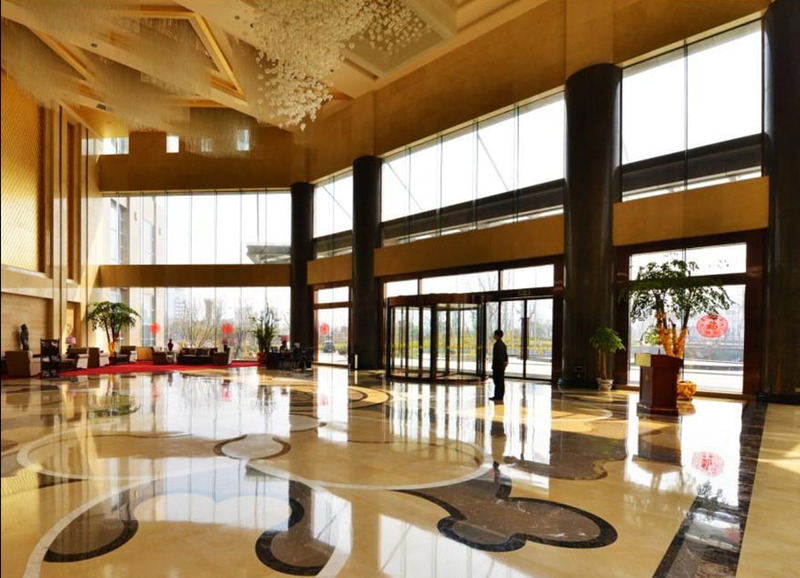 Located midway between the Forbidden City and Beijing Capital Airport, Poly International Plaza occupies a prominent position in a new business district adjacent to the Capital Airport Expressway. 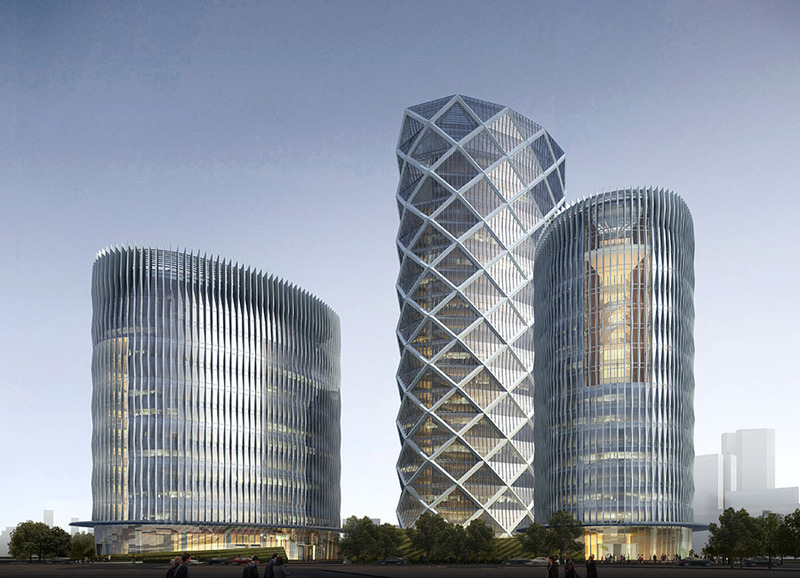 The project site comprises a main tower and two smaller supporting towers. The elliptical footprint of the three towers frees the buildings from the rigid geometry of the adjoining urban fabric, allowing the landscape of surrounding parks to continue seamlessly through the project site. The landscaping covers garage ramps and egress stairs, minimizing their visual impact while creating a tranquil, undulating topography with pedestrian paths. As an international manufacturer, Gardenia Orchidea is devoted to designing and producing supreme and styled Italian ceramic products. Gardenia has gained a long-lasting reputation and history in China. G.e.t. Casa is now gladly cooperated with this renowned Italian Ceramic Brand. The latest Supreme Ceramic collection – Taste is now available in G.e.t. Casa, and only in G.e.t. Casa. Try a new way to experience the same premium quality of Italian brand. A famous Chinese Litterateur, Mr. Yu Qiuyu, once sighed that the culture of Europe is great and mature. The European people combine and integrate their histories, modern civilization, personal freedom and moral standards. Before flying to Hungary, I believed in this claim. However, after my arrival in Budapest, my mindset is reset. The East Europe may be seriously affected by the ruling of Soviet Union in the past. Being compared to the West Europe, it is little bit behind in terms of urban development. Although there is a tiny lack of delicacies and a language barrier (most people in Hungary are not able to speak English), when you dig deeper and discover more, you will soon realize that facts are different from what we might expect. Generally, People in Hungary are passionate, city is in orders, architectures are of special styles, views are fascinating, and Laws are completely set up, etc. The 5th Edition of G.e.t. Magazine is now available. G.e.t. Magazine is designed for all professionists in world of design & architecture, widely recognized by the lovers of design & architecture, designers and architects. Having the brand concept of “Beyond Living．Beyond Lifestyle” , G.e.t. Magazine is positioned to talk about the latest and coolest building decorative materials, projects and even some of Italian cultural topics. In the Spring Cleaning, only cleaning is not enough for the New Year. Protection is the last resort for the big day. But the question is how we could preserve the surface or covering for the best outcome. G.e.t. Casa is able to provide you with the bestand yet easy solution for any difficulties in cleaning, keeping our places in the best shape. According to the Chinese Traditions, people should clean their living or working place thoroughly before the Chinese Lunar New Year. However, a wide kind of dirt & stains in different places and corners post a serious headache to many people. 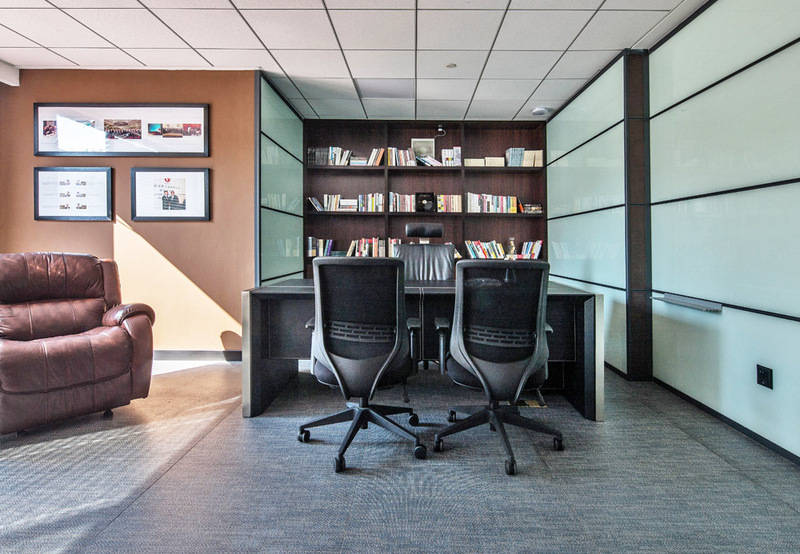 To help people with a thorough cleaning, a detail-oriented company like G.e.t. Casa launches a series of effective products to remove all kinds of dirt and stains, and protect your places for the New Year! 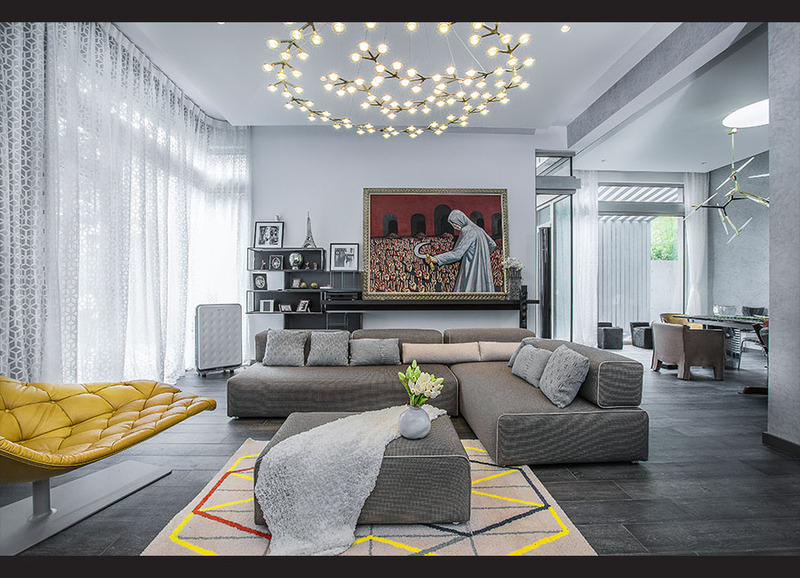 After the great designs and organizations, G.e.t Casa showroom in Changzhou is now to show you the latest and hottest designs，styles and different kinds of constructional materials from Italy .We look forward to seeing you in our new showroom! This year is a milestone for G.e.t. 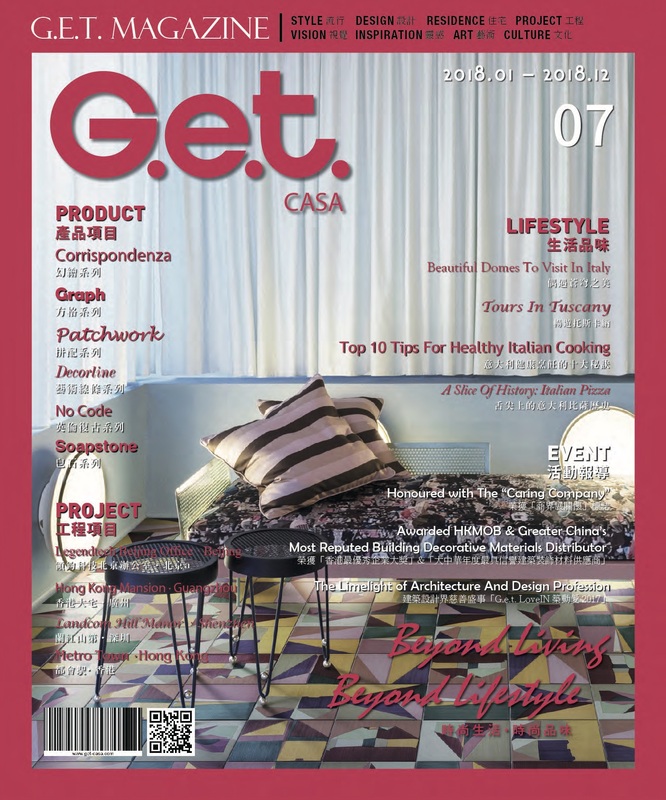 Casa, while G.e.t. 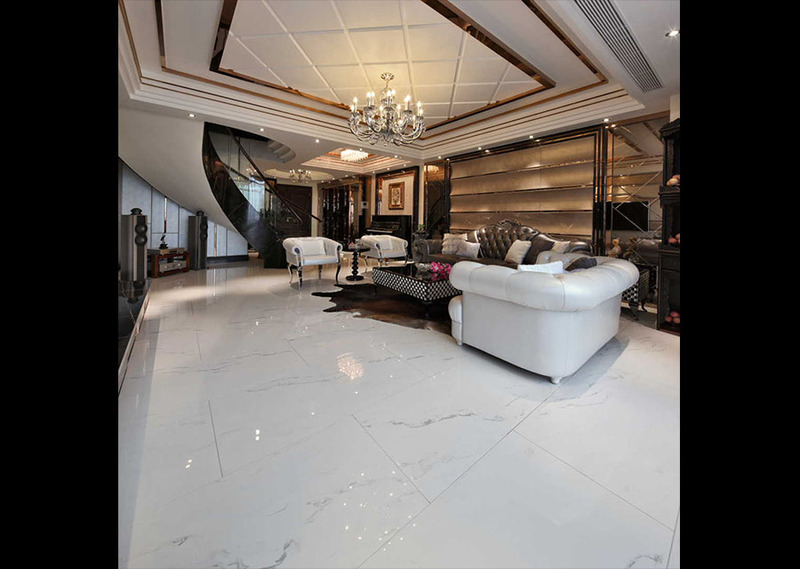 Casa is now working together with one of the biggest manufactures of tiles and ceramics in the world – Ricchetti Group, to create new chapter for the Chinese and Hong Kong markets. Profilpas is an internationally famous brand of metal profiles products from Italy. The 23rd of November in 2016 is not only the grand opening for The Wing of Imported product of Fusen-Noble House in Chenghua District, Chengdu; but also the grand opening of the 2nd showroom of G.e.t. Casa in Chengdu. The second round of “2016 – 17 GSDA Ceramic Art Innovation” has been completed. Thank you for your waiting and supports! It is time to announce the winners of “Best Product Design Award” and “Most Creative Design Asia Award”. From 26th Sep to 30th Sep, the mega 5-day event of "Cersaie 2016 Bologna" has already ended with a splash in the world. This year, it has attracted more than 100,000 visitors from around the world; and all exhibitors have shown their finest and latest products and designs. G.e.t. Casa takes you to enjoys some of the highlights. “2016 – 17 GSDA Ceramic Art Innovation” by G.e.t. Casa & Sant’ Agostino Ceramica, has raised a wide awareness in the country. After an exciting national voting of 2 weeks, let’s find out the most popular voted painting tiles! 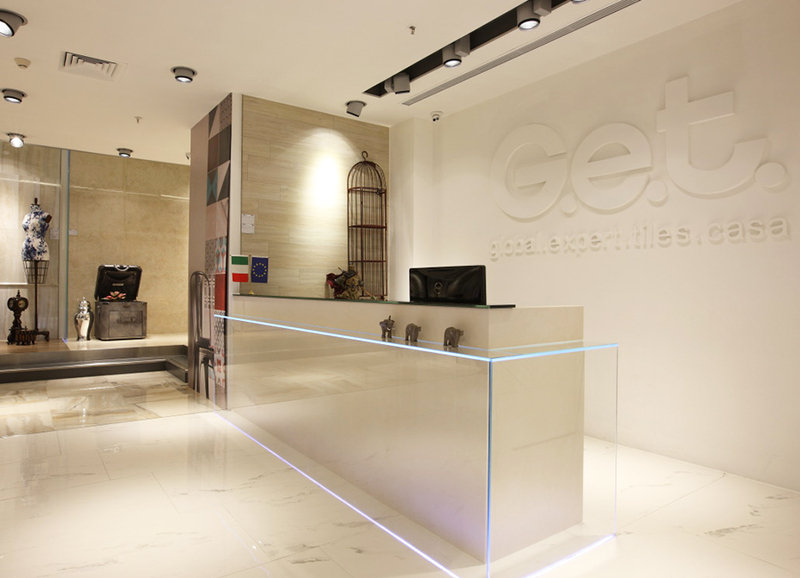 New showrooms of the Innovative building material brand G.e.t. 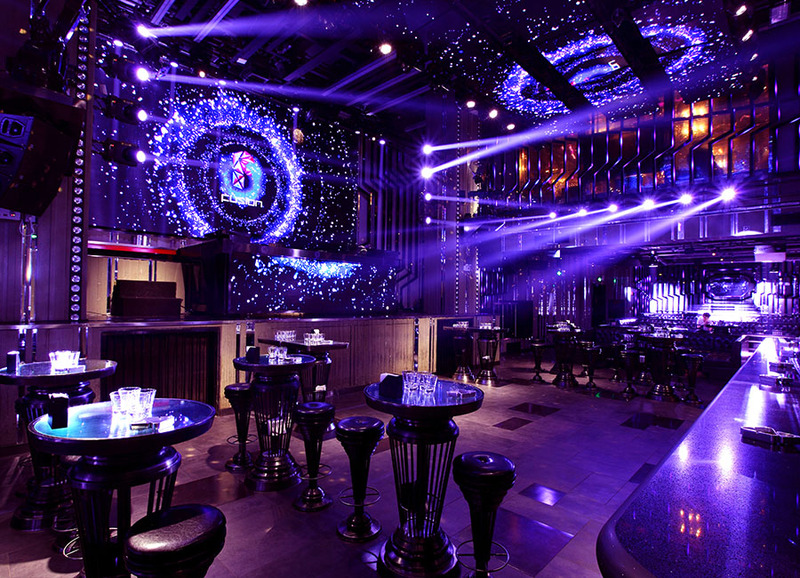 Casa launched in Tianjin and Xian in March and May this year! As usual, G.e.t. 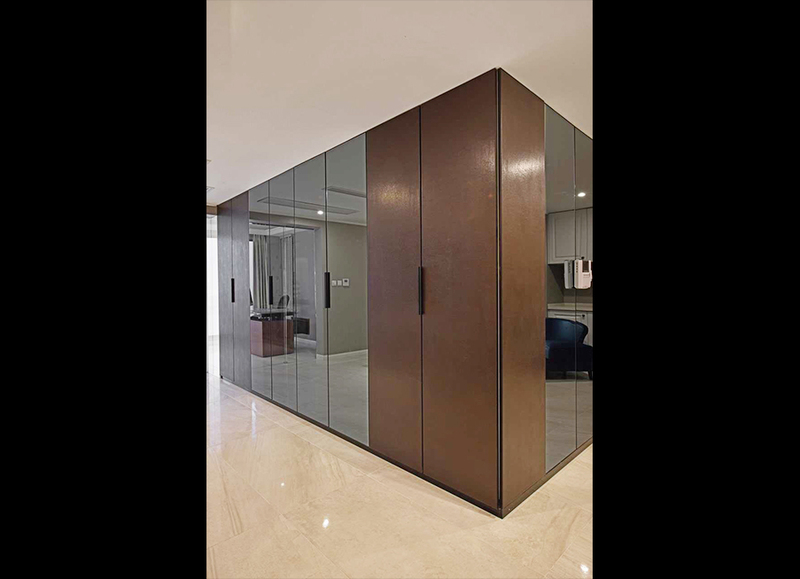 Casa designers adopt the luxurious construction material showcase design and showroom space to enhance the visualizing experience for the architects and designers. 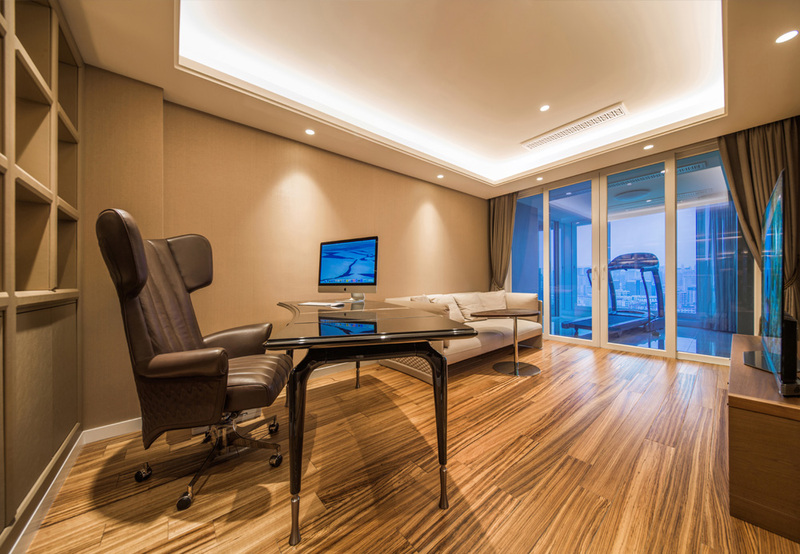 The natural and elegant parquet flooring is the global and latest trend in interior design, to fulfill the high-end aesthetic and quality needs, G.e.t. Casa vigorously introduces the Italian Royal parquet flooring – Gazzotti. The first 2 showrooms will be launched in Hong Kong and Shanghai soon, providing variety of choices for designers who are seeking innovative building materials. 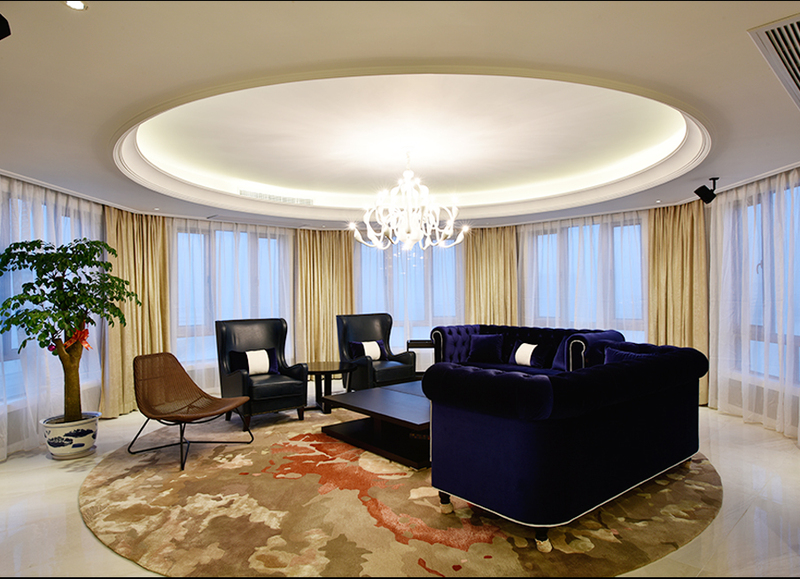 For the design of the VIP room in Jiaxing, the Design Director of Fei Fan construction materials company creates an extraordinary interior style with luxury products by G.e.t Casa. G.e.t. 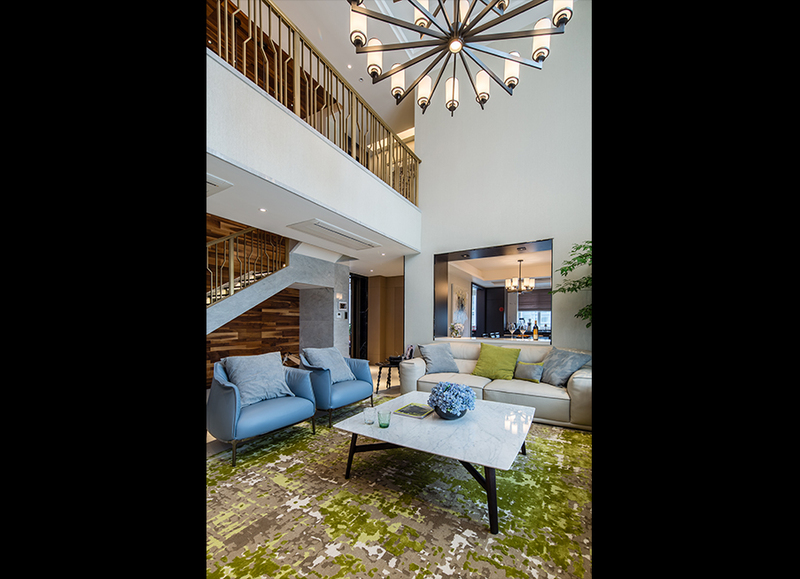 Casa Guangzhou showroom was officially re-launched on 28th April, 2015 following the renovation, it marked a milestone for the development in the high-end interior design in Guangdong. 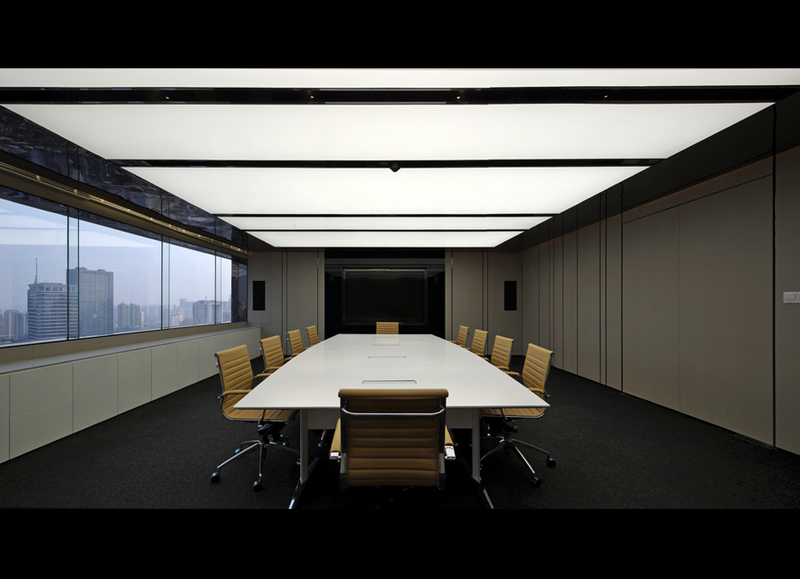 Woods Bagot is the biggest architectural consultancy from Australia, having studios around the globe. It is honorable for G.e.t. 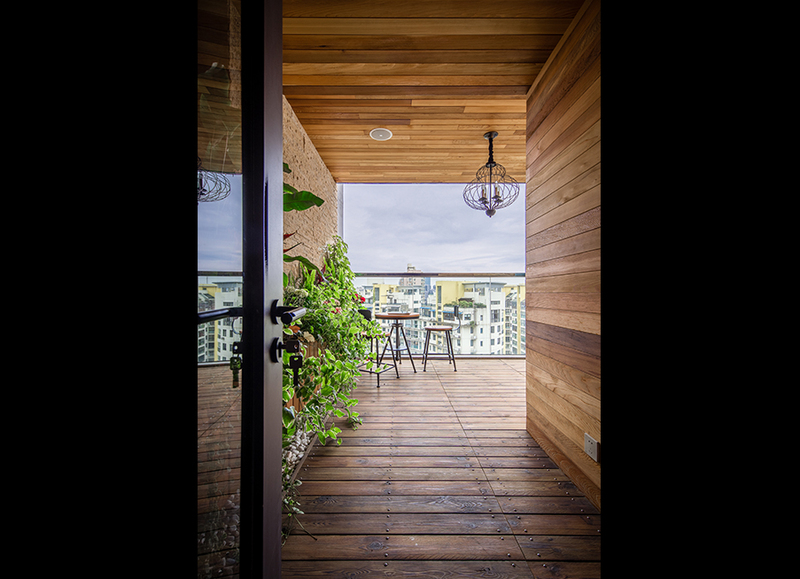 Casa to invite a talented Architect from Woods Bagot – Billy Ip , to express their corporate concept and designing philosophy. 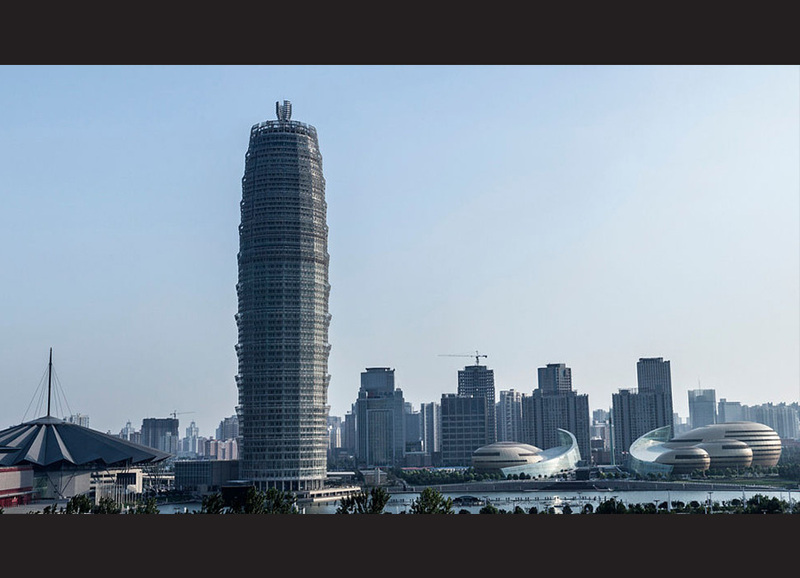 One of the greatest annual events in the world of designs, The 2014 Guangzhou Design week has been completed on December 5-7, 2014, at the Guangzhou Poly World Trade Centre Expo which is able to accommodate few 10 thousands people everyday. G.e.t. Casa is very pleasant to have the international Architectural Designer - Mr. Barrie Ho on the initial “Beyond Living . Beyond Lifestyle”. 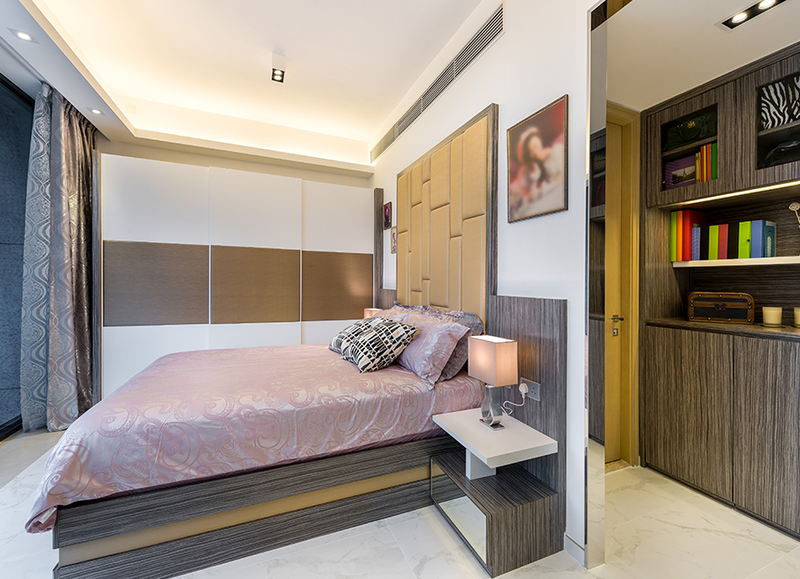 This project is an apartment of 2 stories with more than 400 square feet. To create a nice home for a young couple, the designer puts FMG Marmi Statuario Venato Extra for the living room’s floor. G.e.t. 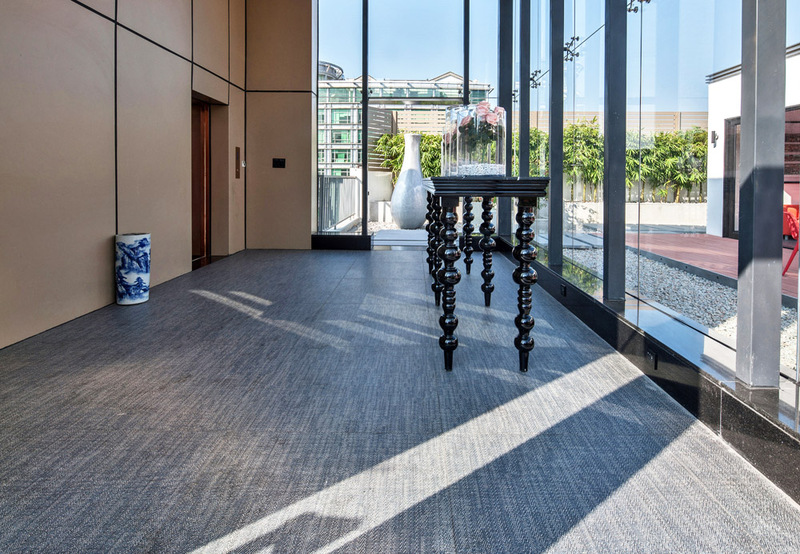 Casa is the sole agent for a number of the historical and listed brands in Asian world, which includes Coem, Cerdisa, Cisa, Gardenia, Ceramica Sant’ Agostino, Floorgres, Viva, Fioranese and Tonalite etc. 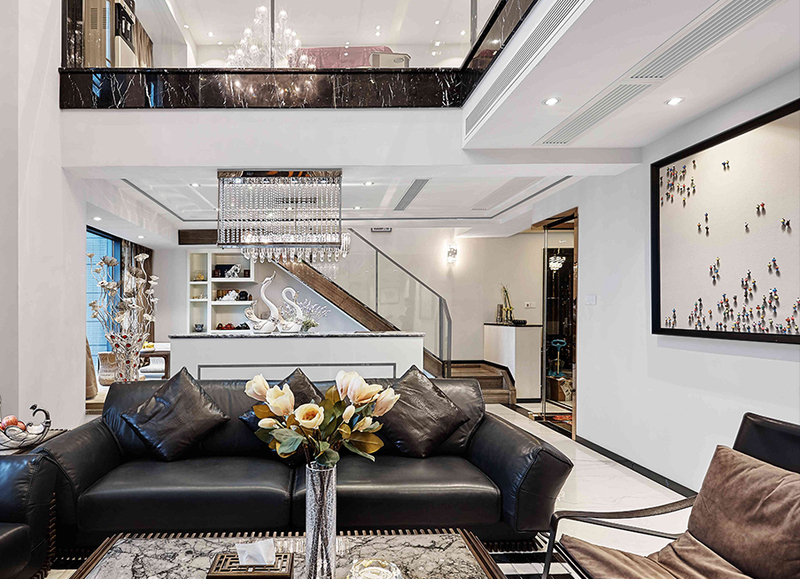 Given the combination of history and advanced technology, it results in the stylish design, uniqueness and durability of the products, providing you with an amazing interior appearance and a long-lasting living place. “Natural” and “Elegant” should be used to describe this collection. With the slip-resistant arrangement of the surface, Lanstone collection is suitable for all spaces of the interior, providing safety for the people and an elegant style for the design. Emerging with different style and interior elements, it is able to create a modern and minimal design that likes no others. A sense of cement craftsmanship is added into the colored base to enhance the charm of the design, intensifying the taste and ambience of the space. The availability of different colors is able to satisfy the chase for innovation in design, while the feature of different dimension allows it to go into different environment to innovate and create any vivid and unique design. Collection preserves the natural surfaces and textures of steamed woods, as well as the uniqueness of lives. 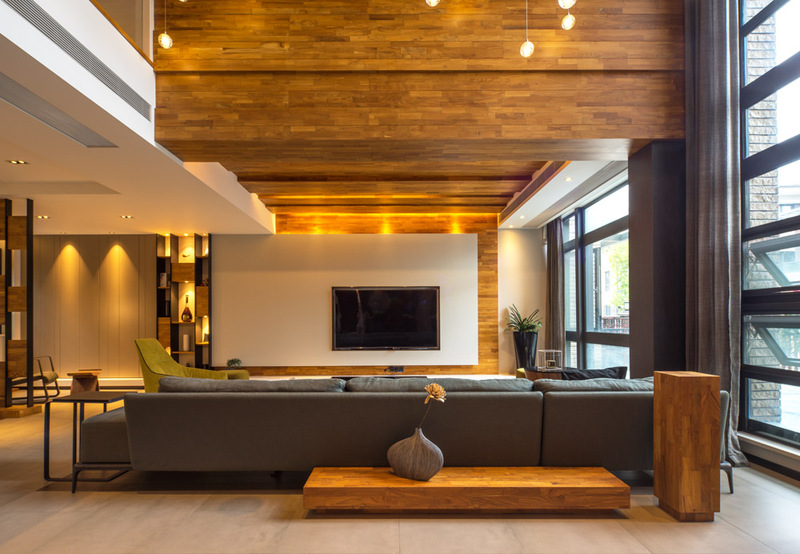 The random and vivid patterns of wood creates specialty for both vision and texture. The modernity and warmth of the collection make it easy to match with different elements, and creates comfort and yet innovation. Besides the natural patterns of old woods, it also puts oxidized colors to imitate the image of those old shops in Modena. The HD digital printing with 3D effects creates a series of non-repeated patterns of 5 square meters, illustrating the appearance of the genuine woods without being artificial. 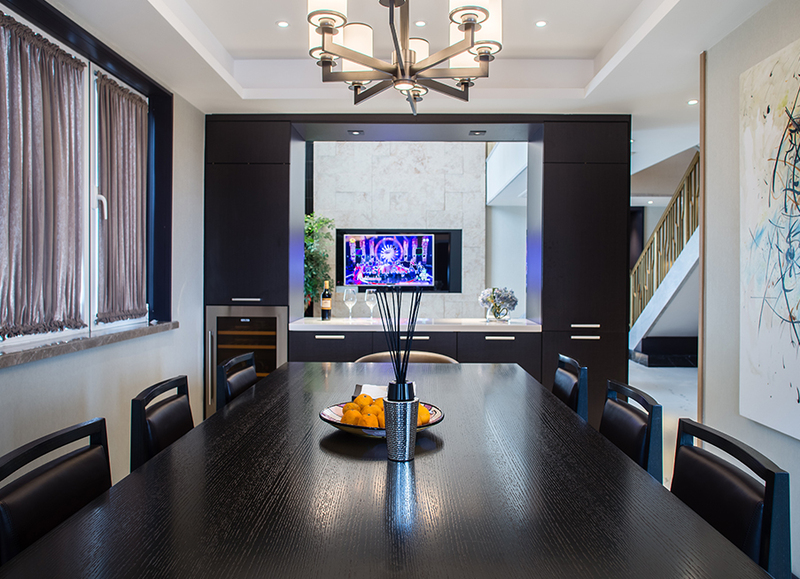 The rectified arrangement allows the perfect installation and matching to create more perfect interior designs. Innovation has no limits. Blue sky is to be the paper when clouds and rainbow are to be the inks. The advanced HD Digital printing technology instills metal and cement elements, turning blue sky into an artistic laboratory. The emergence of different elements creates different styles of specialty. In addition to the rich texture and color of the marble, our greediness keeps pursuing its immaculate and extraordinary. The designer traces back to the 16th century European style of Palladian architecture, and falls in love with history through pioneer production techniques. 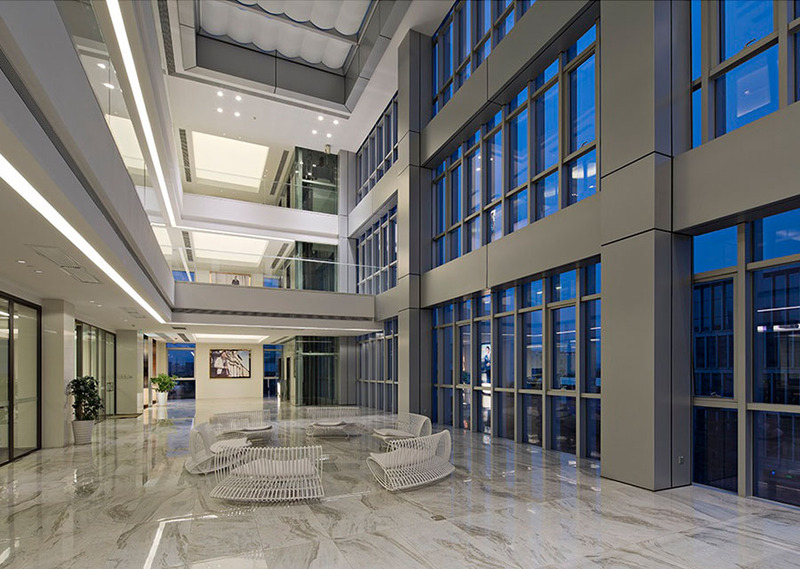 Walks/1.0 provides an abstract yet precise interpretation of the aesthetic properties of quartzite in a perfect synthesis of nature and technology. Aesthetical precision, rigor and formal cleaning distinguish the color choices that characterize the series, accentuating its unconventional simplicity. 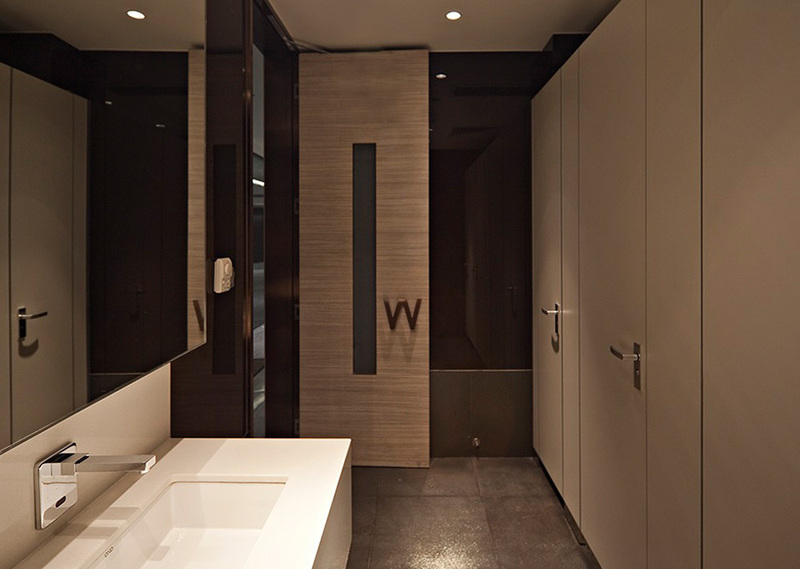 Naturalness is one the elements that modern designs always feature. Wild collection reinterprets the genuine naturalness of natural rocks and stones. Having different colors and natural textures to illustrate the true touch of natural rocks and stones, Wild collection is able to provide a unique experience of extraordinary sensation of the wild. Graph or millimeter paper, which the aim of being adopted by designers and end users as a drawing tool for vertical and horizontal surfaces, is printed with fine lines making up a regular grid used for precision drawings. This is where the Graph Collection comes from. With its micro patterns and color contrasts, the Graph collection makes its mark on any room. With the clear aim of arousing amazement and distinct architectural styles, the provocation of the No-Code Collection lies in having combined two different materials: wood and leather. This effort is an unprecedented, audacious and powerful combination. The Patchwork Collection through graphic styles and color combinations, this collection which in small sizes (20x20cm) recalls and reinterprets the tradition in a contemporary key. The Venetian terrazzo was invented in the 16th century by the Italian. Because of its high plasticity, the Venetian terrazzo could be found in different design styles. 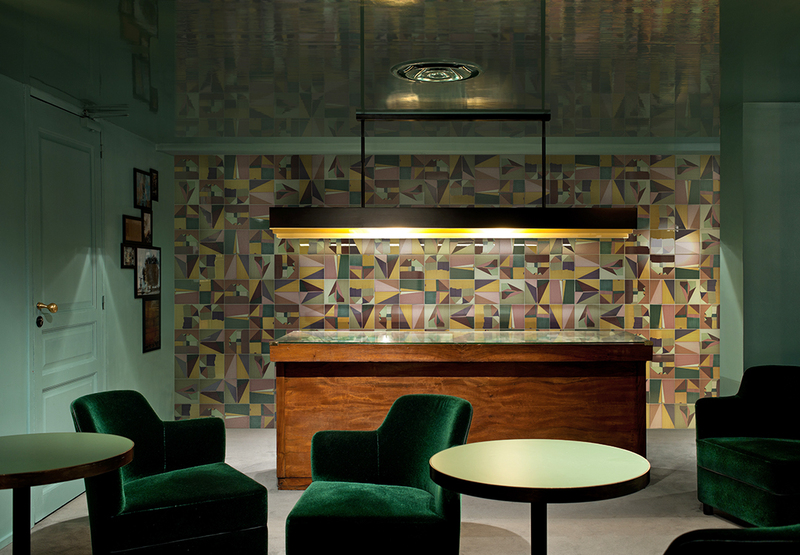 And now this vintage design of terrazzo is transforming from ordinary building materials into a stylish design element. In the past, the color and the design of terrazzo were quite conservative: the fundamental choices were always dark green and blue. 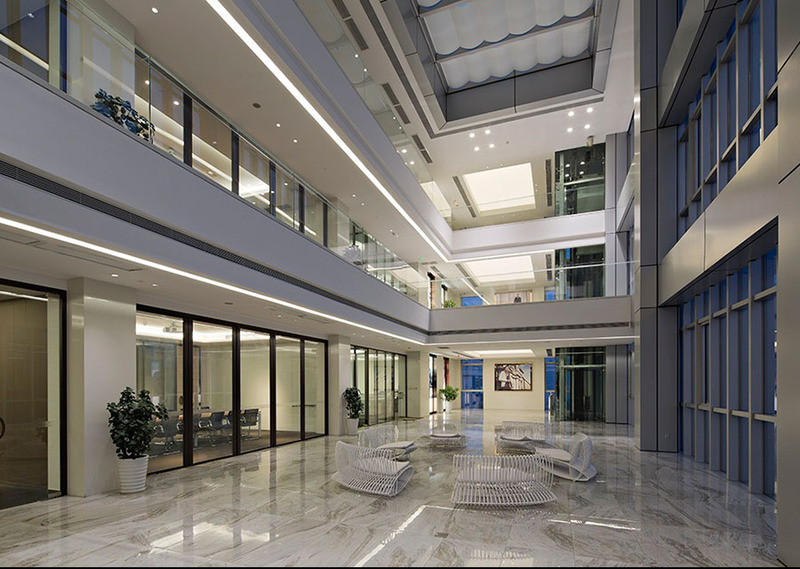 Whereas the new generation of terrazzo is more innovative in its color: simplicity and elegance. The Corrispondenza collection is inspired by a collection of old, folded and yellowed letters that had been preserved like origami artworks from times gone by. At the meantime, as a project that entirely by hand pained, this latest creation is dedicated to a romantic and compelling ritual, the art of “writing”. Woods are the living elements. 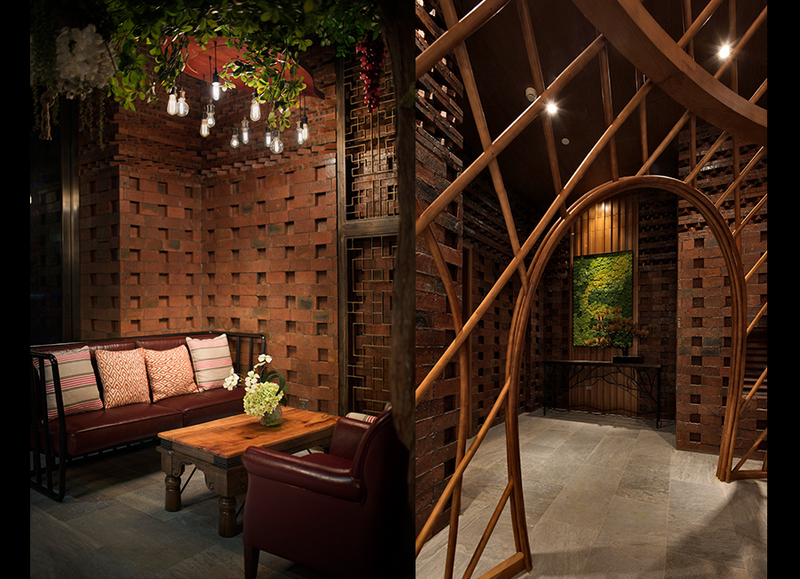 The Barkwood Collection is the art of moving warmth by wood in a room. This collection recalls the fruity essences of wood that makes the internal environment alive and vivid, with its warm chromatic or neutral shades, the smooth motion of the graphics, and the light surface texture. The Seventy Thirty Collection with its soft structures and modern matte colors represents the very last trend, and it gives a taste of modern and classic at the same time. 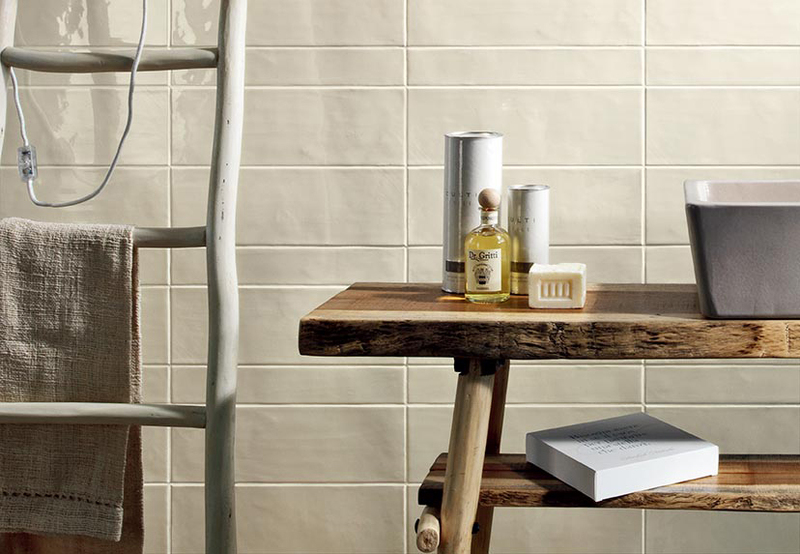 In this wall-tiling collection, the size of 7.5x30 cm presents all its beauty and simplicity. Soft structure with matte colors gives this collection a unique touch without being too extreme. Soap stone is a metamorphic rock that mined in Italy, the United States and Brazil. Depending on where the soap stone is mined from, it has different colors run from grey to green and to black. This kind of stone is extremely hard and extremely, as a result, it is widely used to create cooking implements and kitchen tops at its origin. 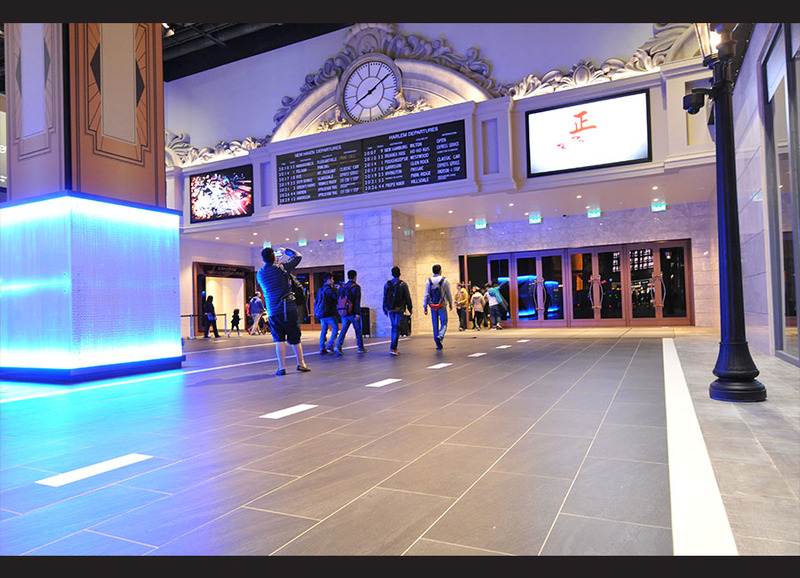 Given a unique pattern and a strong resistance to pressure and corrosion, quartzite is widely used in architecture and interior design. Inspired by this kind of rock, the new Quarzite Collection gives you the quartzite a remarkable natural pattern and texture. 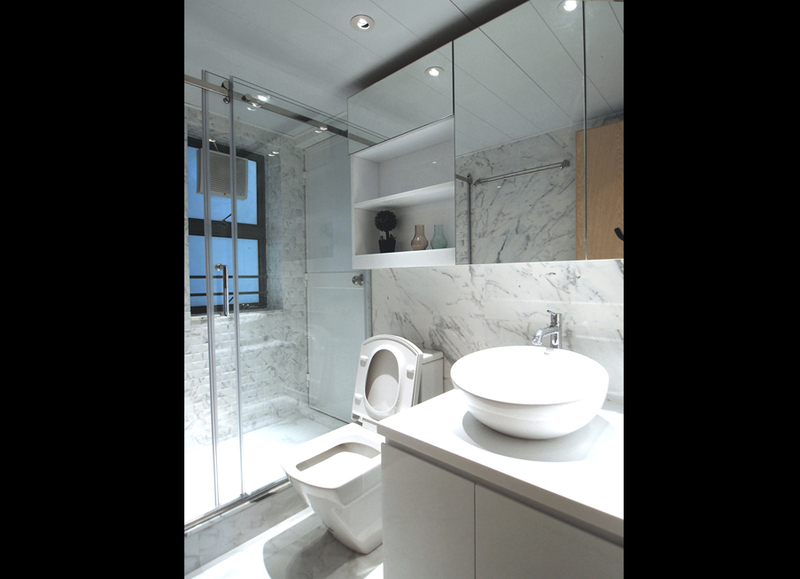 Marble effect is a popular building material because of its natural and unique appearance. 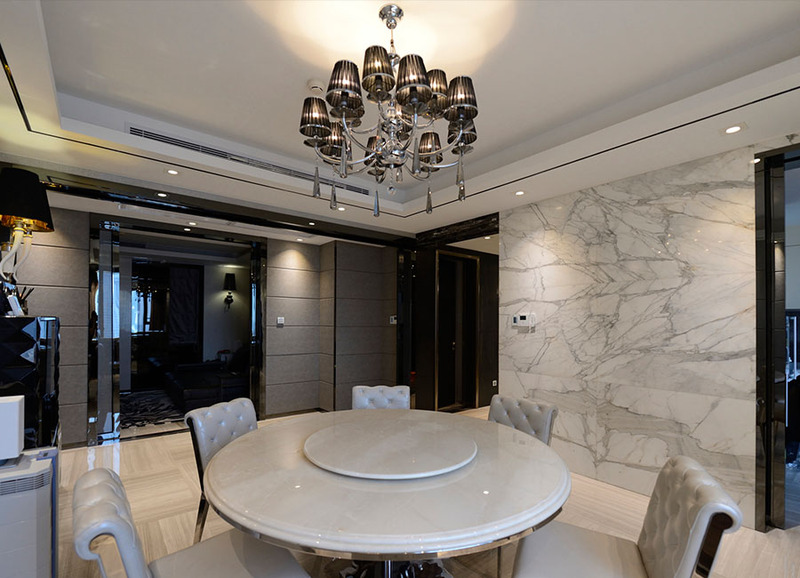 There is no identical pattern between any piece of natural marble while every piece has their own remarkable pattern like fingerprint, allowing creativity in the interior. 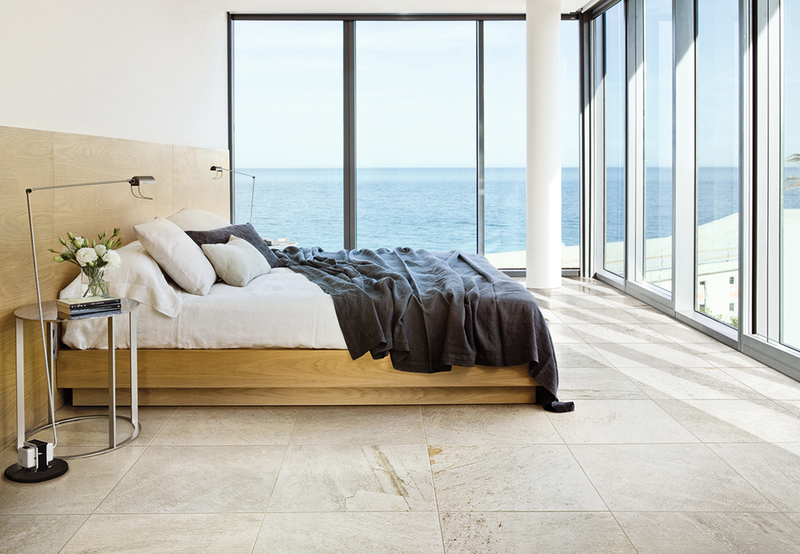 The Highstone Collection is the latest stone effect porcelain collection. This collection draws inspiration from a Nordic limestone, starting from the color range to achieve the natural finish of surface. 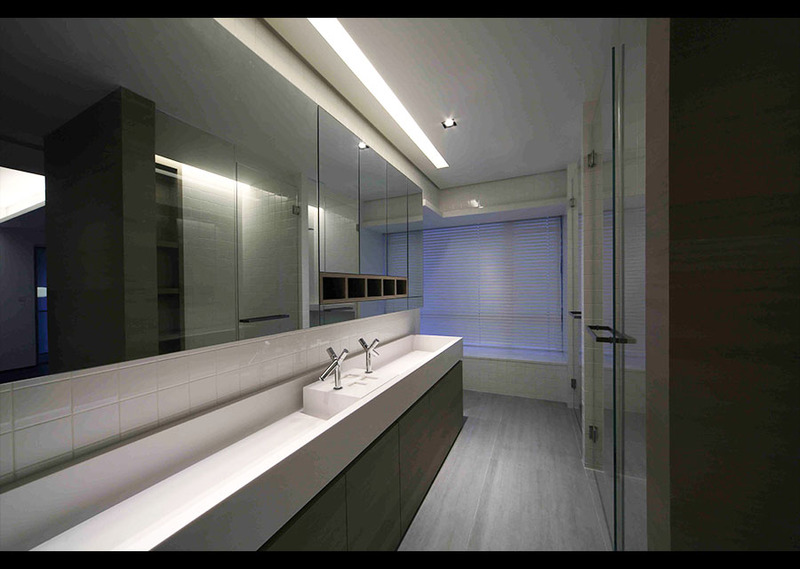 Pure, Natural, Elegant, Flow has been designed to enhance environments valuable and is addressed to those end-users who love interior design. The “tailoring” of Ceramica Sant’Agostino is the pioneering company and leader of this current trend in weaving ceramic surfaces. 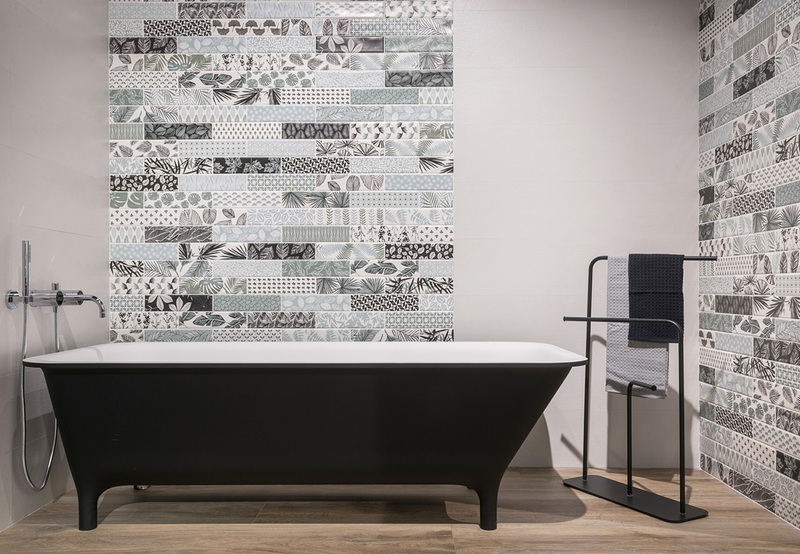 Through the unique and original collection DIGITALART already on the market, Ceramica Sant’Agostino completes with the FINEART Collection, one more innovative fabric porcelain collection which inspired by the art of sensitive weaving fabrics. This collection highly presents the delicate soft tones and the fine texture of fabrics. A reference to modernism, Linea 40 collection is to use chromatic tone as the background and regular geometric shapes that bring styles to the environment. 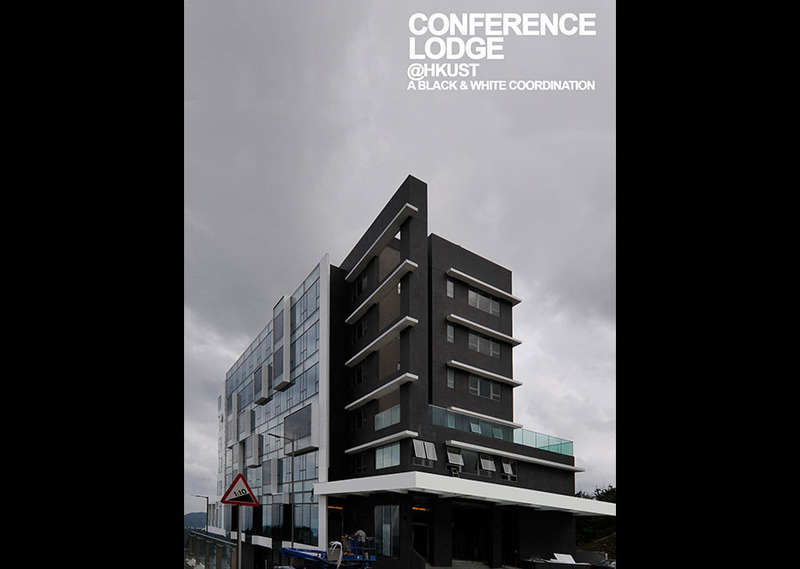 The design stands out in the infinite potential of a highly versatile cladding element of unique character. Available in 2 finishes, warm and deep colors, Linea 40 offers creative inspiration for designing any space with originality. The Decorline Collection, including plain color design and wealthy graphic patterns, tells many fantastic fairy tales on the wall. Rock collection emerges the natural texture and sensation of rocks with the needs for great designs anywhere. 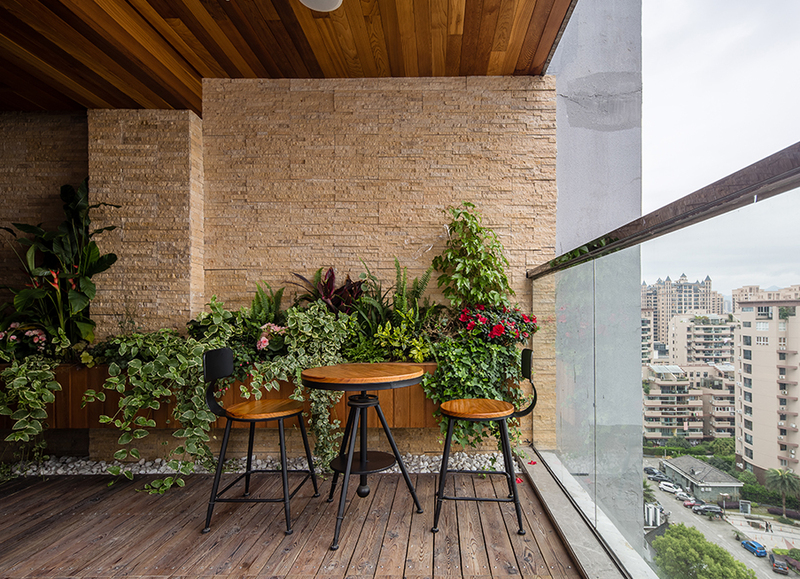 Even though rock is perceived as a hard and tough material which is always used in outdoor area, but Rock collection allows designers and architects to create a natural rock-looked effect for any space. The range of dimensions and colors enable Shadebox to go into different spaces and match with different styles of designs. 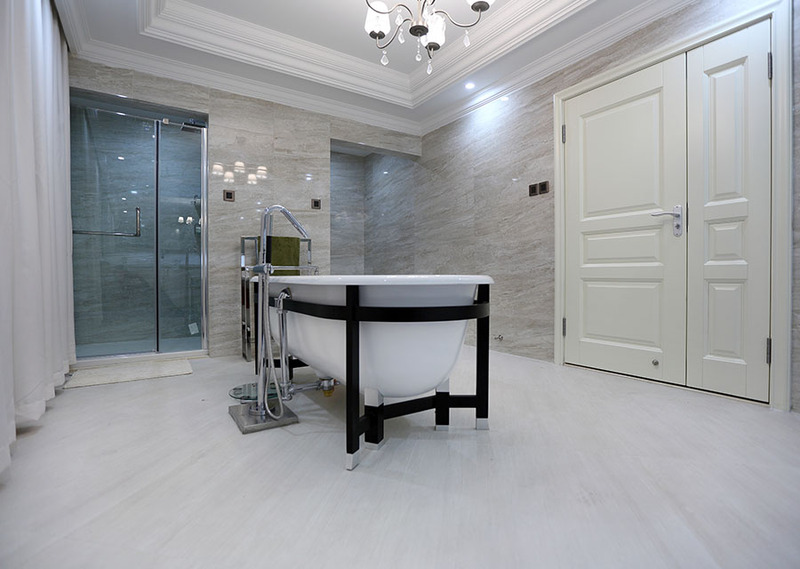 For either project or household designs, it is always one of the best choices for the best layout of walls and floors. Shadestone collection with linear grain surface is one of the most elegant and unique products in the interior design industry. 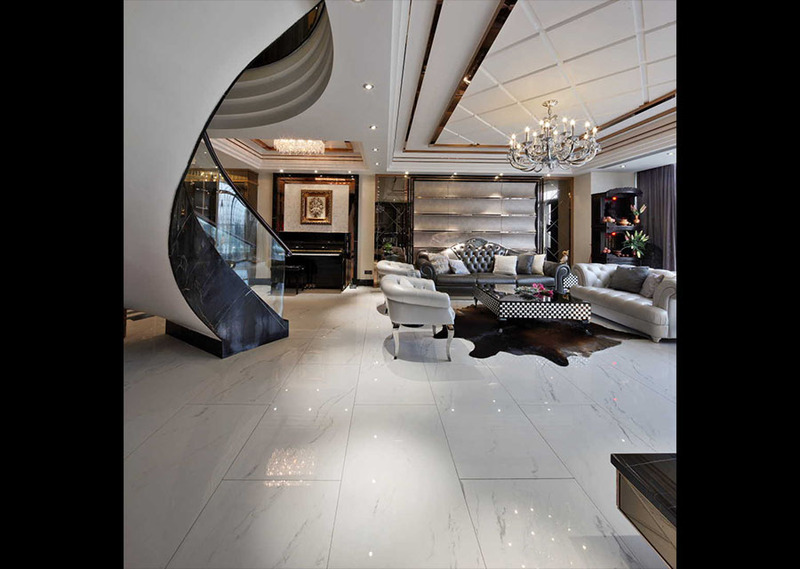 THEMAR is the research of marble perfection through the ceramic surface. The name of the collection is self-explanatory: “The Mar-ble”: Four sources of inspiration: the expressive power of the Statuario Venato; the delicate shades of Lasa marble - also known as “white gold” -; the universal warmth of Crema Marfil and colour depth of Grigio Savoia. The visual characteristics of the original stone are reproduced with so much material wealth and perfection in the details, so as to give unique beautiful and natural features to these slabs. The essential synthesis of aesthetics and quality of materials, TIPOS is the latest evolution in the ceramic travertines, chosen among some of the rarest and most noble in nature along with other invented, with a profound aesthetic design, and an emblem of the artistic and artisan value by Ceramica Sant’Agostino. The collection finds its full expression in the slabs of Travertino Rigato presented in the 60x120 cm - 24”x48” version and designed to achieve a perfect tiling “in the continuous vein”, which enhances the richness of the most precious travertine. Lacca collection makes use of the natural beauty to reflect the texture of the stage, and the dedication to arts by artists and dancers. 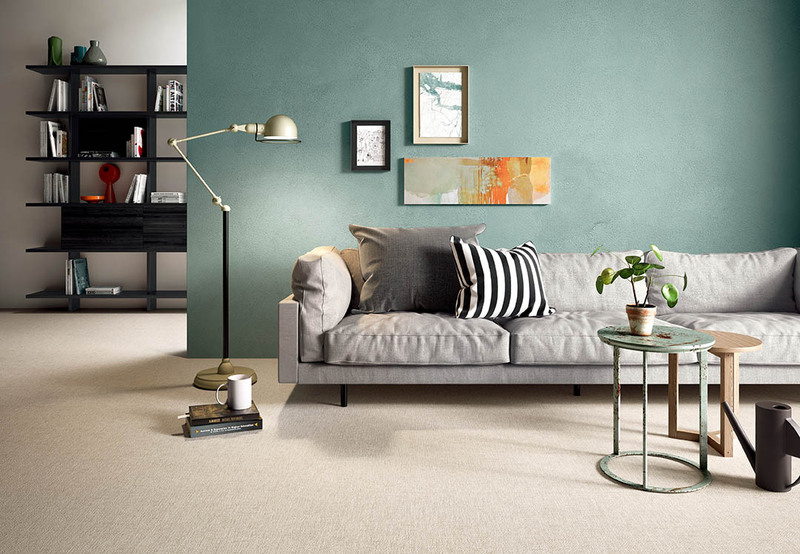 By combining the modern colors and marks of stages, Lacca collection considerately creates an imperfection, and hence gives a familiar yet warm sensation for different spaces. 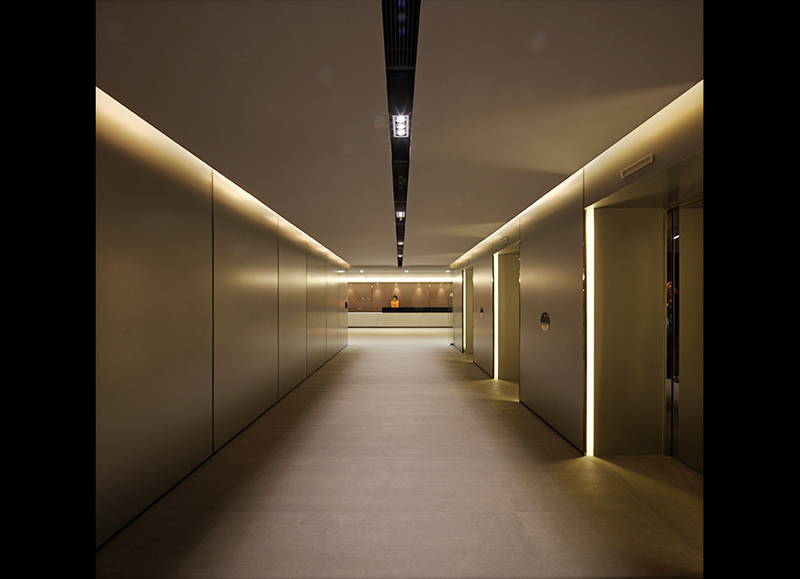 The natural arrangement of the surface allows Lacca to match with different design styles to create a natural and relaxing interior environment. Chalet collection emerge the advantages between woods and tiles. 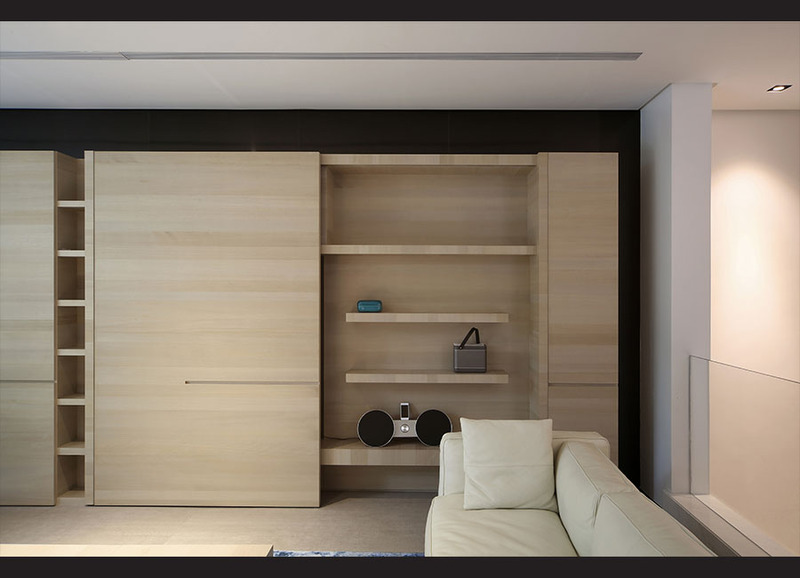 The genuine wood patterns are achieved with the ceramic bodies. It preserves the natural sensation and beauty of woods, and even enhances the durability of the surface. 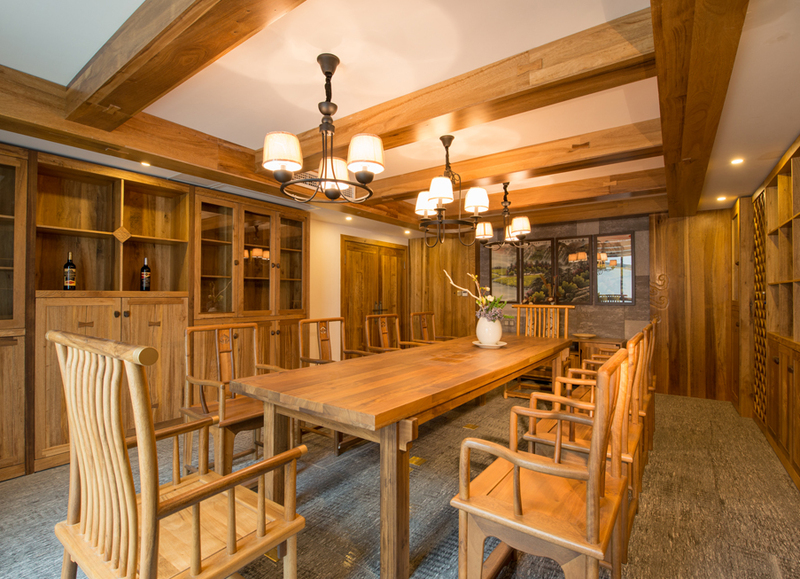 Generally, Chalet collection brings the beauty and charm of Alps into different spaces. This collection is generally clean and suitable for the creation of different spaces. 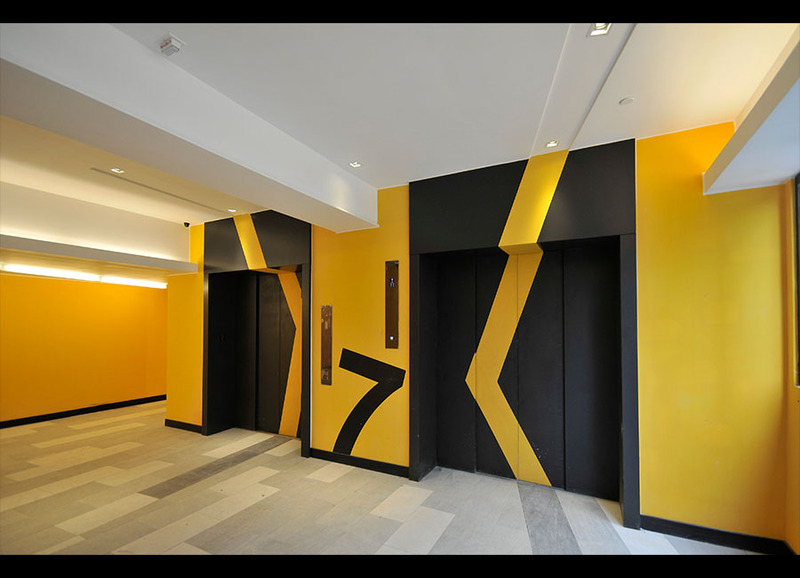 The availability of a wide range of colors and non-patterned design provide boundless creativity, from the residential to public area, from the wall to floor. The production process makes use of internationally certified green element and, recycle and energy facilities; the system is even granted with LEED certification. Along with different finishing and sizes in all available sizes, it is able to satisfy the needs of different projects. The raw and natural pattern reflects the actual travertine, while the naturally disordered pattern creates a special visual effect. 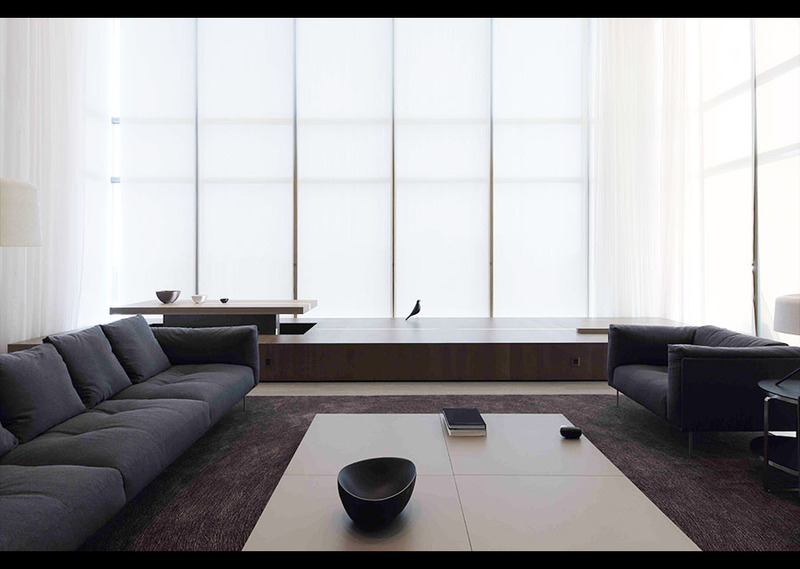 The minimal colors of black, white and silver illustrate the perfect combination of creativity and elegance. There are three main elements of Balsamic Vinegar which have been immersed into TASTE – the oak barrel, the wax and the white fine gauze. Just like the traditional Balsamic Vinegar, the pattern and tone of Taste collection are expressing the historical story and unique mellow feeling. Wood Mood is the interpretation of wood in porcelain stoneware inspired by the elegant and strongly contrasting colours of antique floors made from original woods, reclaimed and given new life: the wood shades blend randomly to create sophisticated settings with a strong personality. With a considerably dimensional cutting, arrow collection is able to create different layouts and hence different designs. 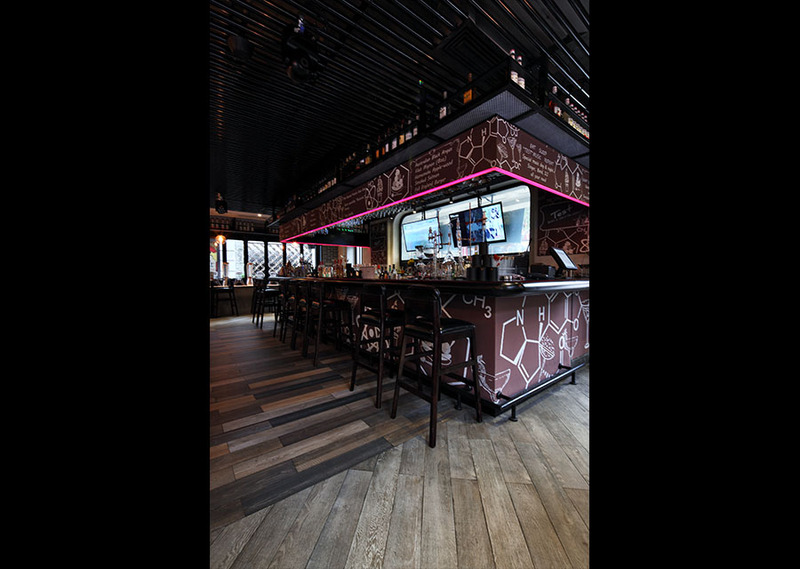 Terre Nuove integrates advanced digital-printing technology and modern colors to illustrate the natural variation of rustic tiles in appearance and authenticity of styles, creating unlimited inspirations for outstanding three dimensional designs. By combining the characteristics of painted wood and tiles, Blendart is suitable for the contemporary architectural needs and designs. This collection recreates the charming veining of wood in a new version. The unfading aesthetics Inspired by the essence of nature wood, Charmwood collection brings the unfading and aesthetic appeal of the antique wood. Marmocrea Collection takes the most unique and special colors and patterns of the natural marble to form a shiny surface and a matte surface, turning the environment into a 6-star club and creating a 6-star elegance. 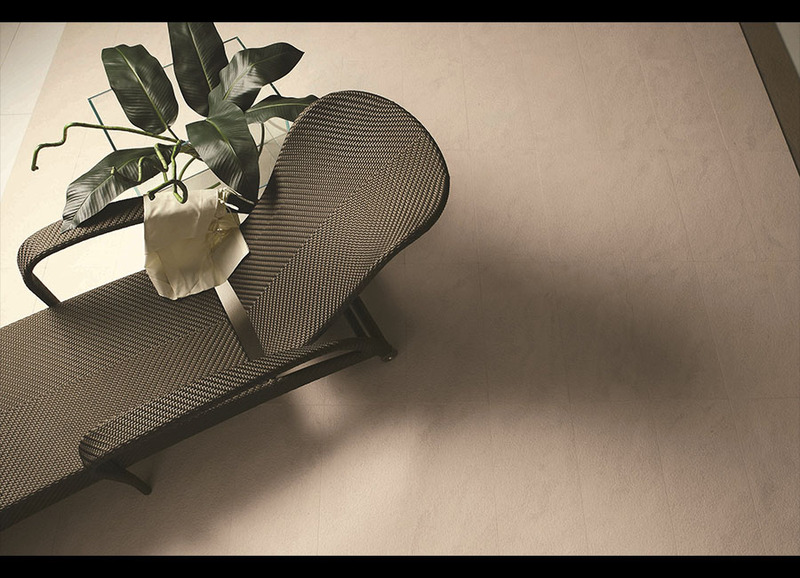 Arabesque Collection is inspired by the ballet swings and moves, bringing the elegance in curve into the environment. Satin Collection is inspired by the true feeling and texture of sand. Shade is the collection which showcases all these features in a single product, allowing designers and architects to decorate environments in an aesthetically balanced way, without compromising resistance, durability and the anti-grip features. 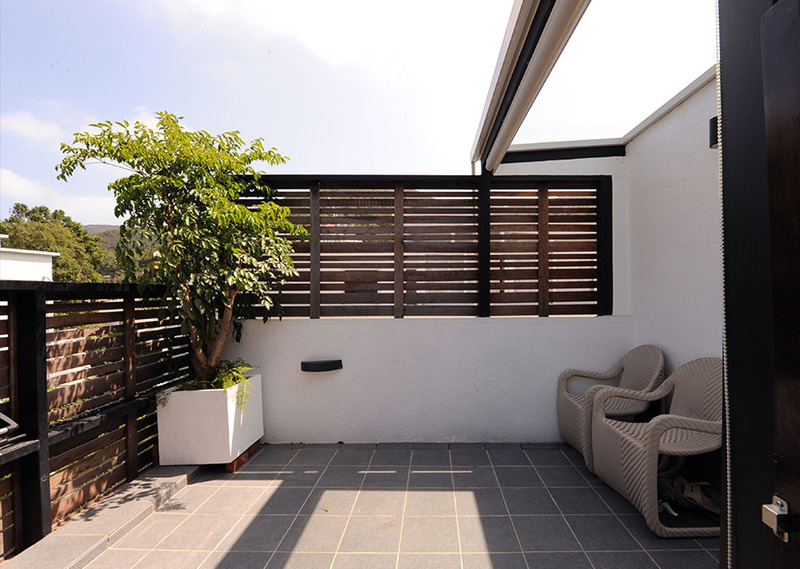 Shade provides an all-round solution for any environment. 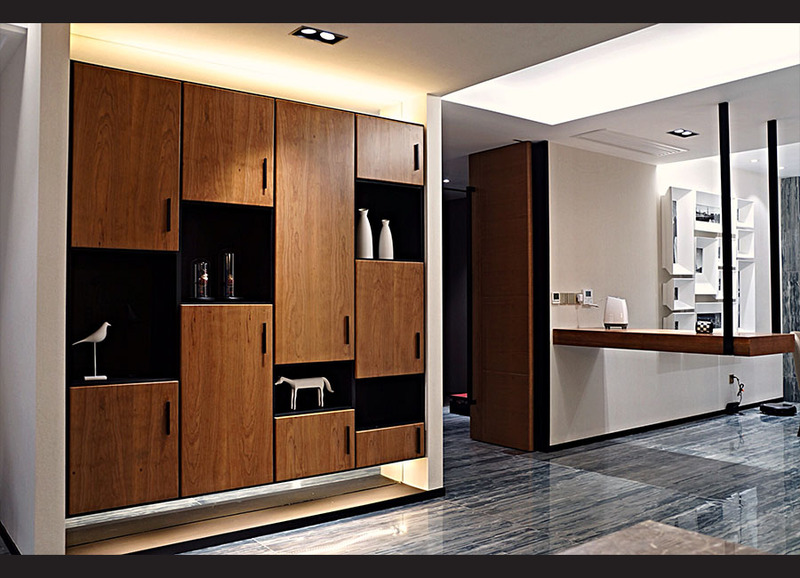 Linea 40 collection is able to fit into any space, from bathroom to kitchen, from corridor to feature wall. With the transformation from the raw into the soft, 99 volte grants a new life with an artistic characteristics to cement. The historical, the contemporary Native collection is featured with an extraordinary effect of “natural wear” for both indoor and outdoor, bringing the tactile softness inside out of the timeless surface. It transmits a sense of “eternal beauty”. Statale 9 brings civil and industrial elements into the slabs, making it outshine the ordinary wooden tiles in the world of modern design. Cement is a necessary architectural material. 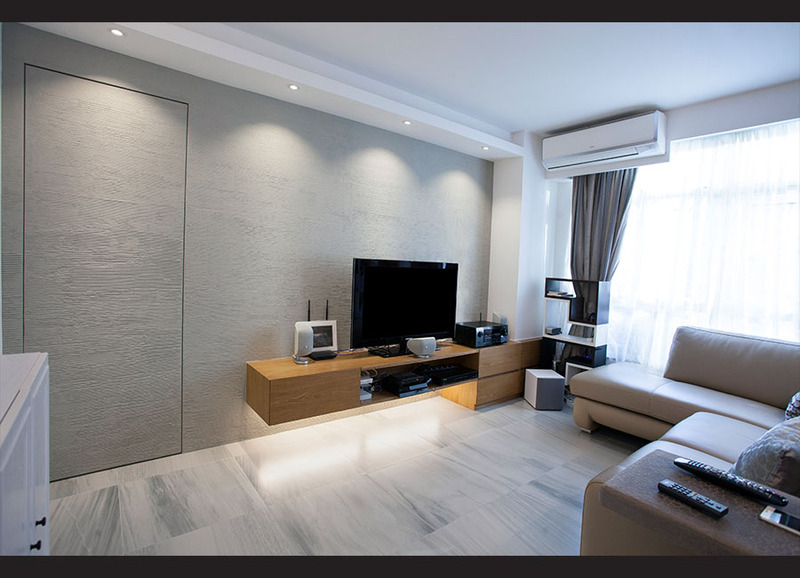 Given a unique texture and appearance, cement is able to transform and bring special characteristics into the interior design, giving a sensation of rough and muscularity. The colors used in this collection all are the vivid ones that bring the whole collection to life. The History and The Future The Urban Wood collection has a shabby design, bringing histories and telling stories for space, enriching its charm and driving it forward. The simple but special design makes Ferro Collection suitable for different indoor and outdoor environments. Along with the Minimalist and Modernity, the special surface of Ferro Collection brings the out beauty of details toward people. Concrete collection is able to create a sensation of being wild and original out of the contemporary design, enriching the content and imagination of the space. Cottage wood inherits the classical wooden pattern and transforms it with a dusty shade, making it more historical and so legendary. Modern architecture finds a new ally in Reside collection, the latest generation series featuring originality and elegance to create new design possibilities. Strong graphics and delicate nuances are the distinguishing marks of Reside, gracing any room with modern elegance, conferring each its own style. 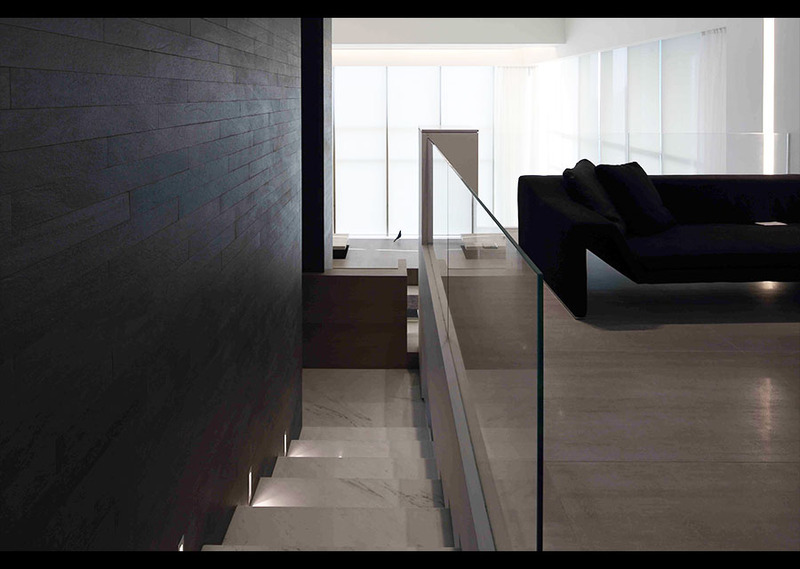 Pietra di Basalto is the synthesis of technological research and nature, faithful to the original material, a slightly off-tone stone which combines the technological performance of porcelain stoneware with the emotion of the stone’s surface. 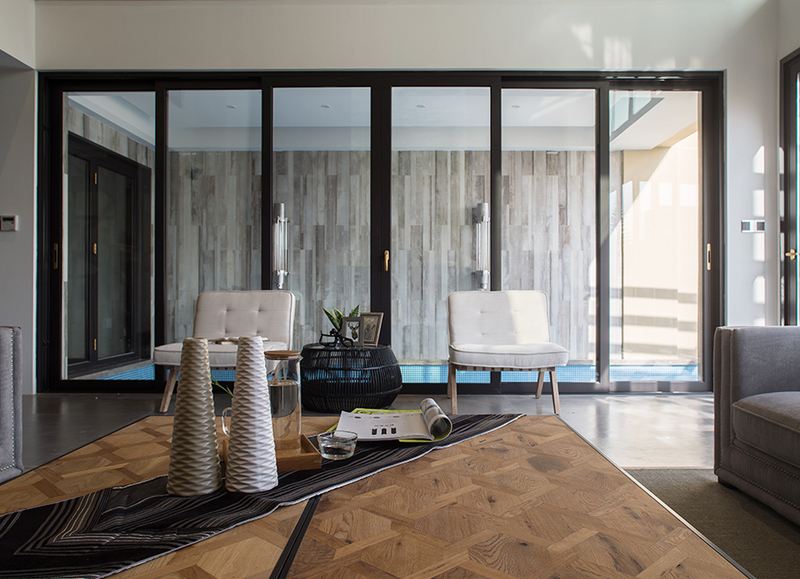 A taste of the natural fusion Reverse collection recreates the structural mass of concrete while merging with the impressed timber formwork to create a fusion taste of nature and texture. The interpretation of nature Geotech combines the markings on the fossil Madeira Woods and the texture of the fossil Madeira Rocks, with unique colors. When style is a natural attitude With the KRYSTAL Technology, a glossy and glazing surface has been created, making Jungle Lux as bright as crystals. 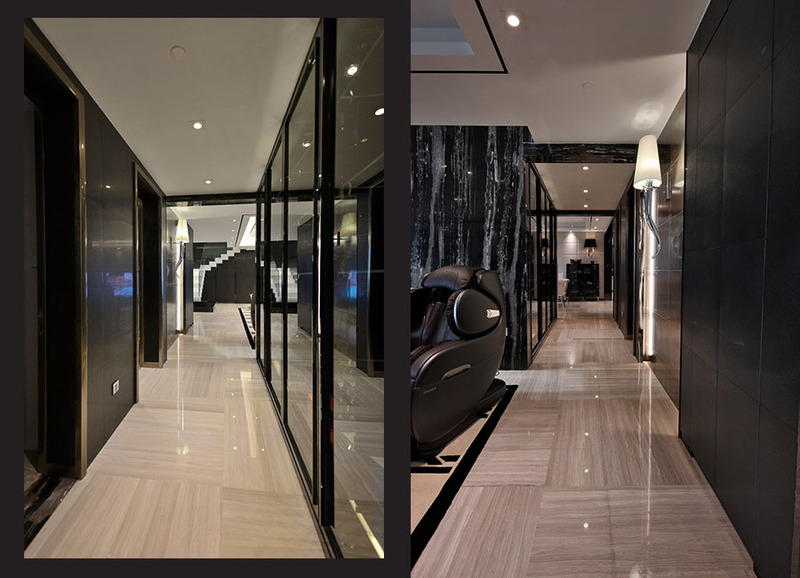 Identical Inspiration．Different Feeling Walks/1.0 provides an abstract yet precise interpretation of the aesthetic properties of quartzite in a perfect synthesis of nature and technology. Simple . Practical . Eco E-wood is an eco-friendly collection. It conforms to the specifications for modern eco-sustainable buildings and is made of solid porcelain stoneware. Kreo is a modular surfaces system with a series of modular decorations, to enhance floorings and wall tiles for residential and public areas. The Pure, the Natural Jungle collection brings to the stage the evolution of ceramic wood effect. The Muse collection evokes the sophisticated lifestyle of the past, an elegance that lies in unique characteristics, sought-after materials and details. The transformation of traditions Featured with elegant graphics and patterns, Victoria architectural style traditionally stands for elegance and nobility. The contemporary tradition Maiolica, contemporary tradition. Ceramic reinvents itself by creating a new living style in which tradition becomes a source of inspiration for a contemporary look. Enhanced with refined decorative elements, Bellagio Collection interprets the classic taste in a chic and sophisticated style. Sensory Art The collection of MA.DE shows a combination of matters and design aesthetics, creating a comfortable and peaceful atmosphere, and a sense of art with different styles in design. Concept is a collection inspired by hand-applied resin floors which nowadays are heavily in demand both in architecture and in interior design. Treasure that lasts Accademia Collection is inspired by the Historical Artistic Floor "VENETIAN TERRAZZO". Simple．Modern Quarziti features a wealth of elements that are always different yet complementary, ideal for the creation of timeless design schemes. The royals of modernity Melt collection is inspired by the eternity of marble and its veins created by the passing of time, enriching the surfaces with sumptuous decorations in liberty style that create a pattern on the coating. Tradition becomes modern design Terre collection is able to give a fresh, extraordinarily natural twist to traditional floor and wall coverings. The modernity of the marble Marble Arch, the preciousness of marble. Refined and elegant shades take centre stage, thanks to unique and precious details that make the rooms full of character and personality. Soul is a collection of wall tile that captures all the intensity and the emotional power of colors. Revolutionary sensation Tamita is a modern classicism, which underlines the sensuality of ceramic coverings by rendering them strongly tactile. Nature 2.0 is inspired by most fascinating side of the ocean. The slabs have a background shade from blue to green in colour, recalling the sea-bed and water tints. Nature 2.0 not only creates a sense of pure nature in designs, but also an ocean of light and shade. Maxfine gives free reign to the creativity of architects and interior designers, providing the environments with a high technical quality and a new aesthetic pleasantness. 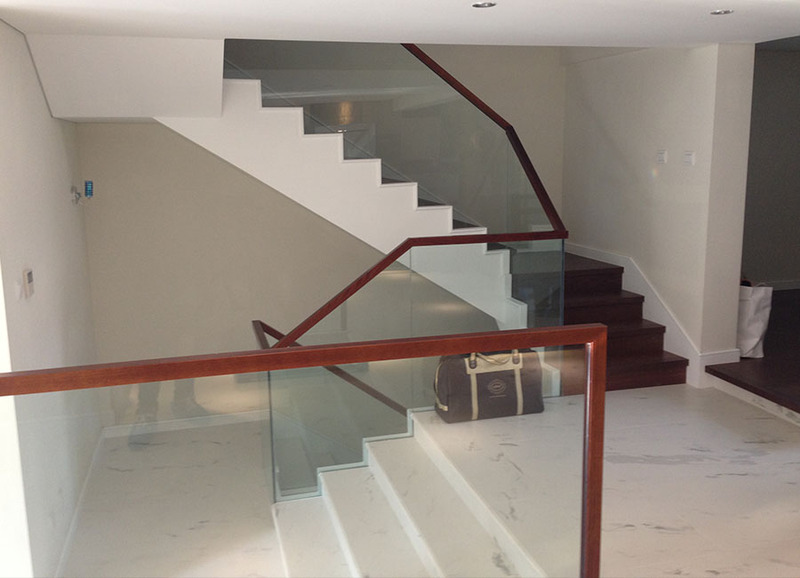 The natural marble has a wide range of natural colors and patterns. 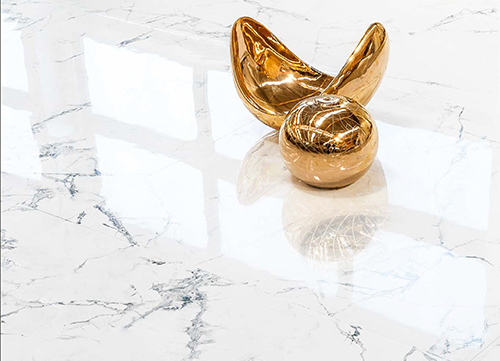 FMG Marmi Classici captures the elegance and beauty of the valuable marbles. FMG Graniti comes with a wide range of natural colors and the natural texture of natural Granites, making it suitable for any design and architecture. Chromocode 3D is based on the concept of a brand that identifies color and texture, lending variety, strength, and depth to any architectual work, including interiors. Sensation of wildness Wild collection reinterprets the genuine naturalness of natural rocks and stones. Noble．Natural An amazingly shiny and glossy surface makes Viktoria outshine any other ceramic tiles in the modern design industry. Romantic collection represents the aesthetics of linearity, combined with the traditional beauty of designs, to create a masterly fashion for spaces. The classical collection S.Wood is one of the most demanding collections. The Contemporary Alabaster The name “Luxor” evokes the charm of ancient times and the preciousness of those materials that history brought us. 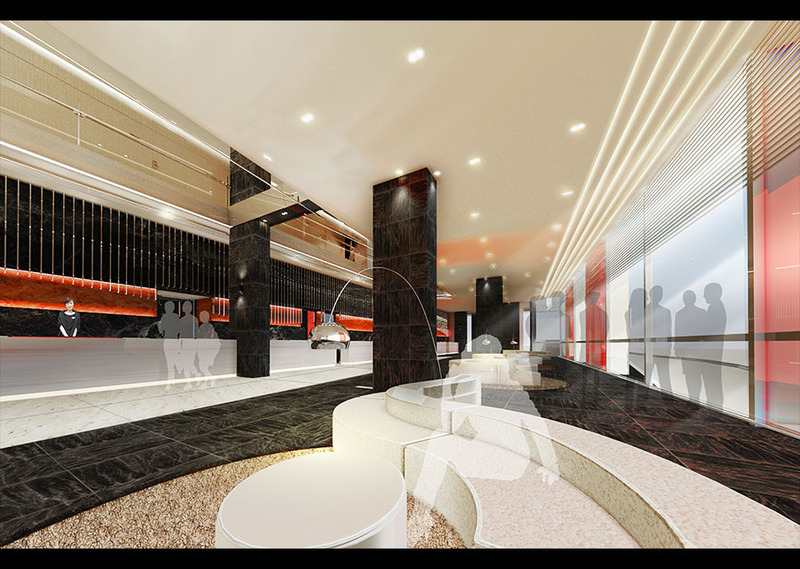 Luxor preserves and transforms in the contemporary way that takes the environment into the next level. The collection of Travertini Imperiali represents nobility and elegance. The diamond in rooms The extremely sophisticated finishing, which is shiny and smooth, enables this collection to characterize the modern design for different spaces. Rays collection stands out from classic interpretations to visions of intensely modern projects in which design presents a pictorial grace of craftsmanship. Porcelainwood Active collection is inspired by the look and colors of fossil wood, illustrating the beauty of the combination of nature and modern designs, bringing an evolutional aesthetics into the space. Inspired by the monumental architecture of Tuscan square, Piazze Toscane collection combines the historical craftsmanship and the pattern of natural marbles to create an elegant sensation for the modern design. 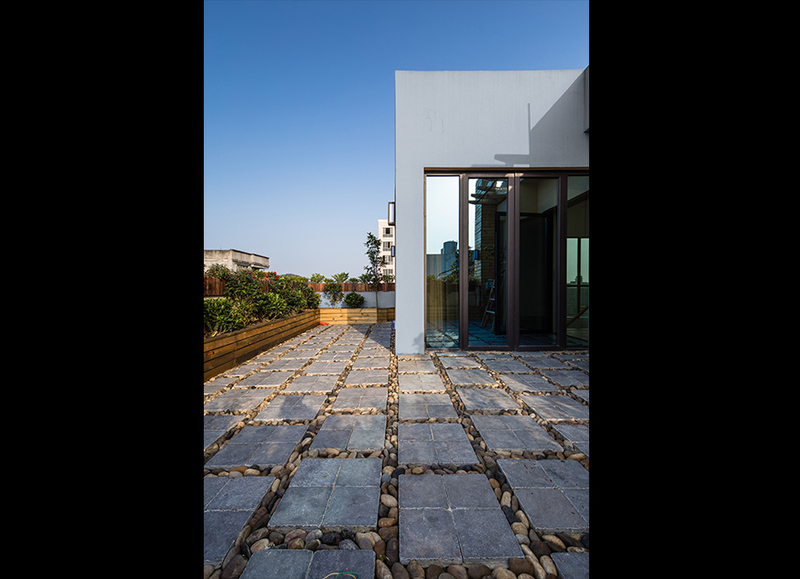 Paving Collection extends the wild style of rocks and the modernity of contemporary design into the exterior, providing harmony and practicality throughout spaces. Once Ocean collection is put in the space, the overall feeling and style of the space are harmonized with a well-being atmosphere. Neobarocco collection is fused with the sophisticated, elegant aesthetic hallmarks of classicism with the latest trends in furniture and interior design, exalting the dynamism of the collection’s forms and decorative elements. Inspired by the natural beauty of marbles, Elegance collection refines the aesthetic of modern designs. By merging the aesthetic appeal of natural marbles and geometry graphics, a new definition of spatial elegance is born. My Wall collection is a choice of eight modern and refined colors for tailoring walls to one’s personal taste in mono-chrome or any new combination of colors. 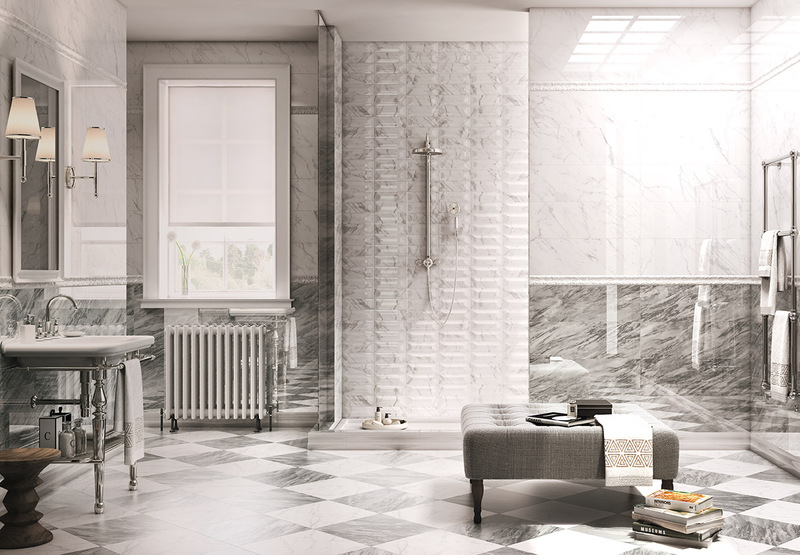 Marmi Imperiali collection integrates the traditional marble working and the latest ceramic tile technologies to create a contemporary yet traditionally elegant products. Landscape collection merges the texture of clay with the natural pattern of rocks, giving a strong country feel to the space. 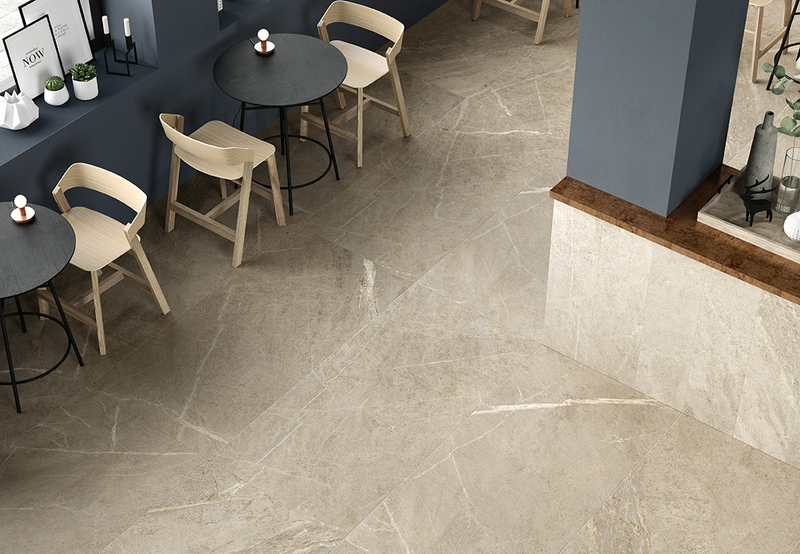 Thanks to a great attention to details and different stone looks, I Marmi Italiani is perfectly reproduced to give charm and naturalness to these ceramic slabs designed for unique spaces and atmospheres. Flows is a collection of flooring with soft and modern aesthetics that is characterized with a natural movement of graphics that vary from piece to piece. Active Life Collection is designed for both indoor and outdoor environments. Given the patterns and textures of natural woods, this collection is able to create contemporary designs with style and providing a green and safe environment for the world. 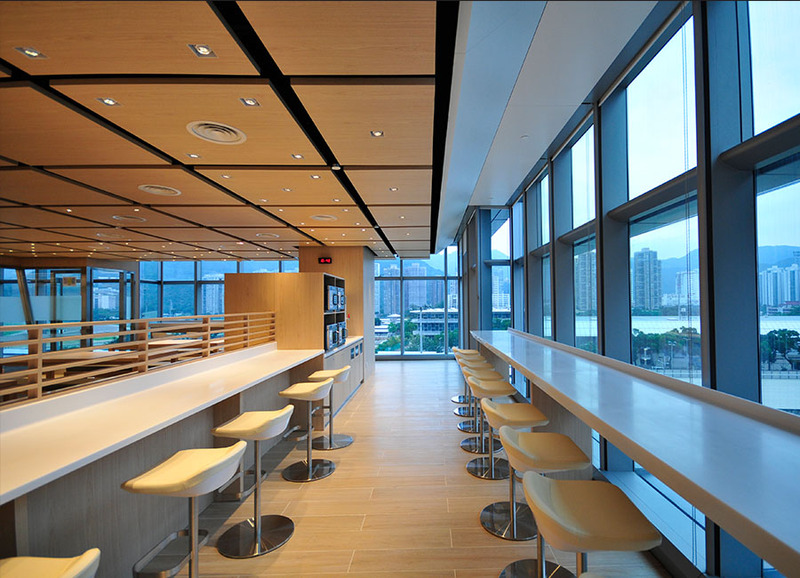 The products of Active Stone are designed for both indoor and outdoor environments. Featuring with the solid texture of natural rocks, Active Stone creates a style of modernity and simplicity. Roads Collection allows styles to travel throughout spaces, extending the beauty and design of the modern simplicity style. 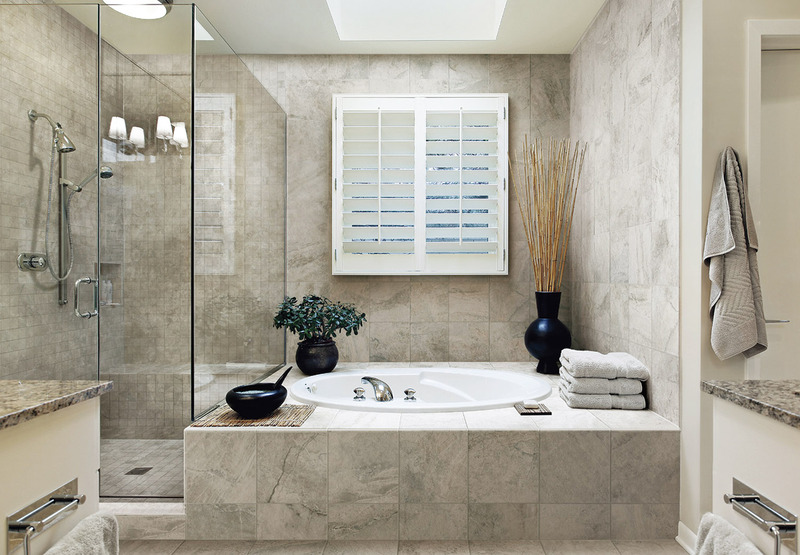 Travertini inherits the fibrous and concentric appearance of the natural travertine. The surface of Metal Line collection shines with its environs. Brightness and heat are absorbed and returned in the form of energy and movement. 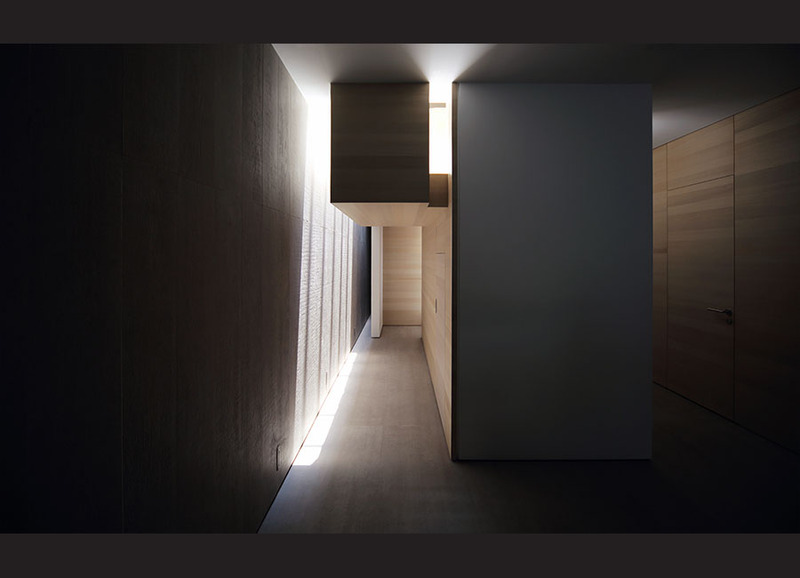 The environment is now animated and the interior mood is warmed by the play with light and reflection. Pure is inspired by the world of design, featuring the RAL colors and offering modern designs a chromatic adaptability that only a material created by the nature and man can offer. Pietre collection is aimed at creating a vivid style of simplicity and modernity. 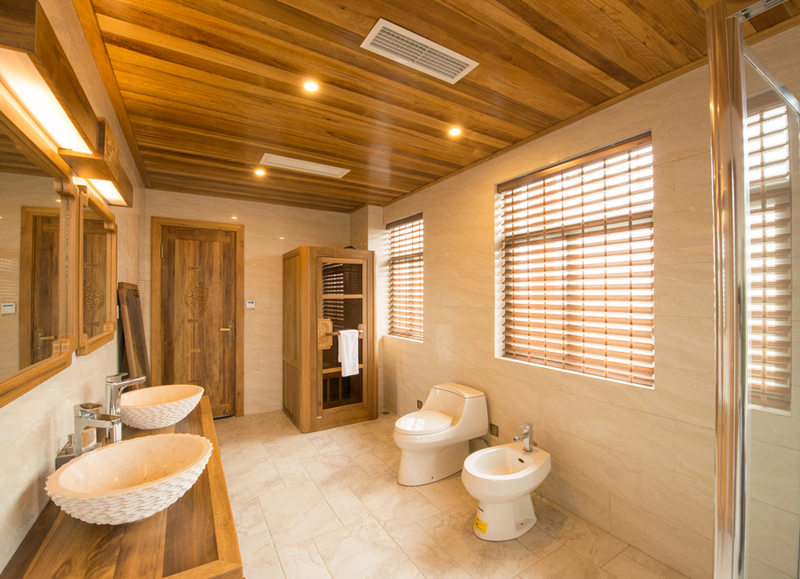 It is featured with a wide range of colors and textures of different kinds of natural stones which allows people to experience the natural in a contemporary way. Abita is able to grant emotional experience out of the ordinary, by changing the space into an intimate place to live in peace and harmony. The environment becomes an emotional space, fondling the sense of beauty in a unique way. Wood is an absolutely unique and beautiful product of nature and is never manufactured to consistent specifications. Its natural imperfections are part of its appeal and character. Every piece of wood can be slightly or noticeably different in color, texture and grain from every other piece, even pieces from the same tree. Gazzotti is the sole supplier of wooden parquet for Italian Royal Family. Gazzotti has more than 100 years of history of producing parquet. 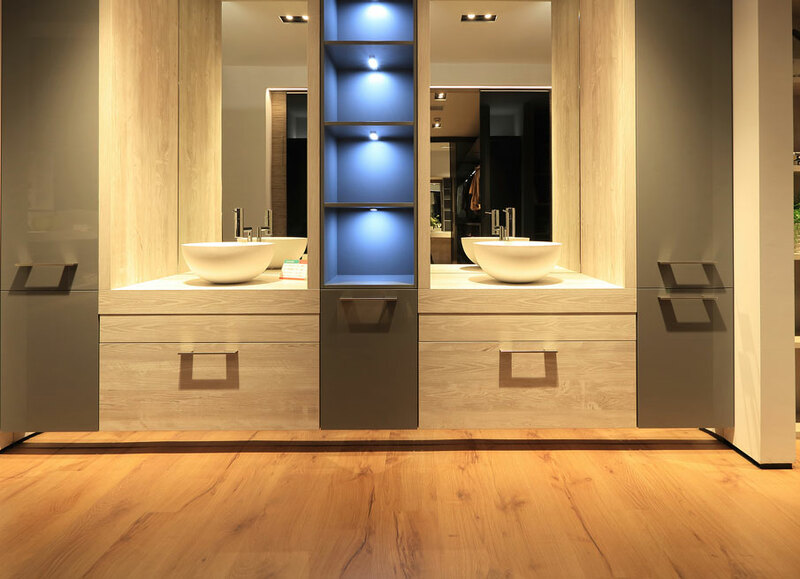 Gerko Flooring Industries is a Belgian Boutique manufacturer of high end French oak flooring. 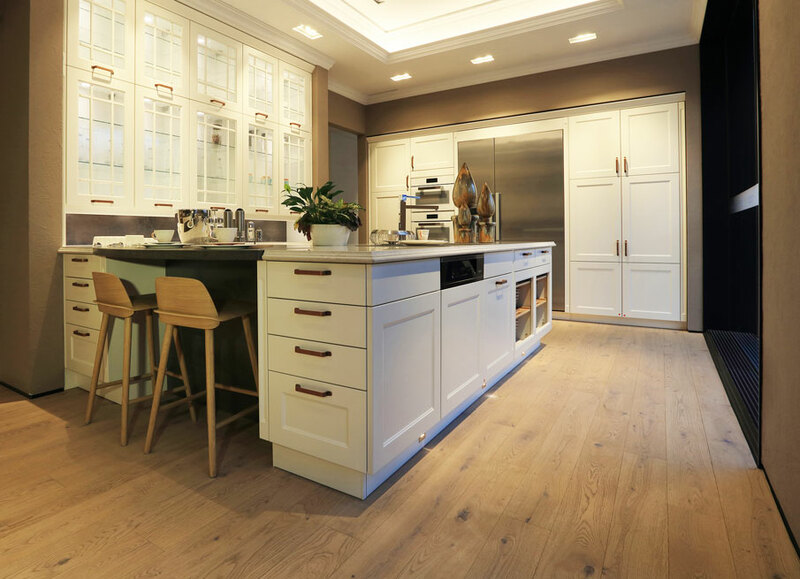 They have been specialized in producing, structuring and coloring the oak floor since 1993, to make them look like real reclaimed wood with most modern machinery. 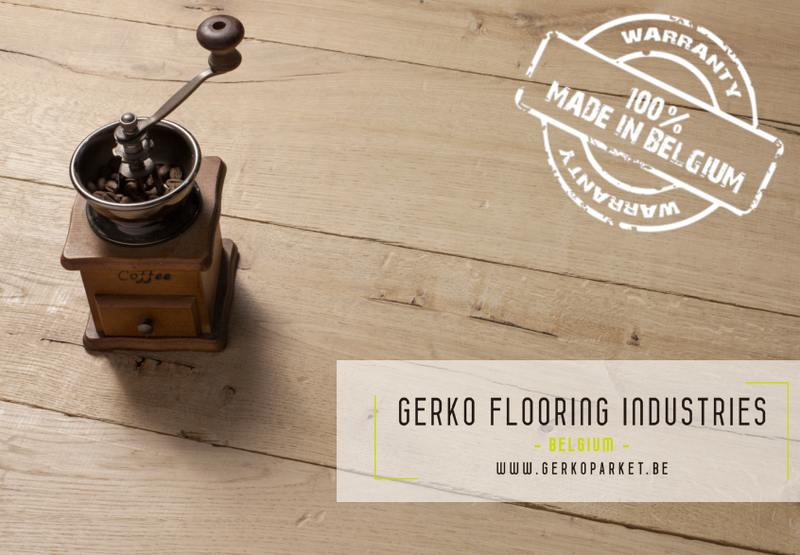 Gerko guarantees their own 100 % Belgian manufacturing, which reflects the very high quality standards. 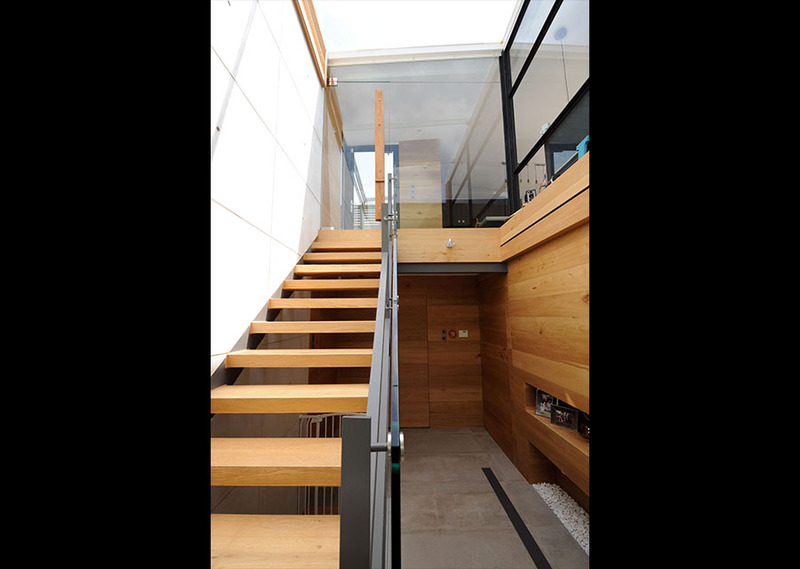 When building wooden house, ancient wood materials is one kind of precious elements in western countries. Gerko discovered a great source to produce flooring from reclaimed oak beams and planks that come from old Belgian and French barns. This is the Barn Collection, retaining the unique cracks and wood eyes that are created by the years. Inspired by the wood that you find along the beach in French, the Driftwood Collection can be recognized by their weathered, uneven surfaces and looks. 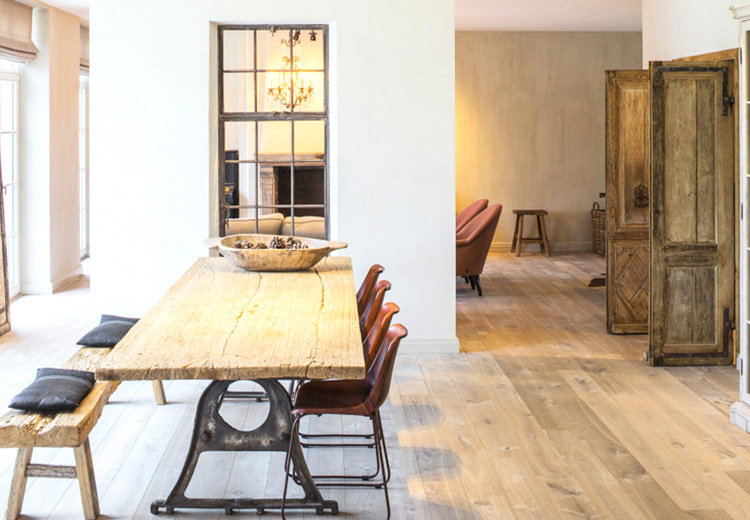 The Antique Collection is a unique collection of distressed old looking floors. The distressed edge and surface in this collection have been especially developed to create the look of a 100-years old looking floor. 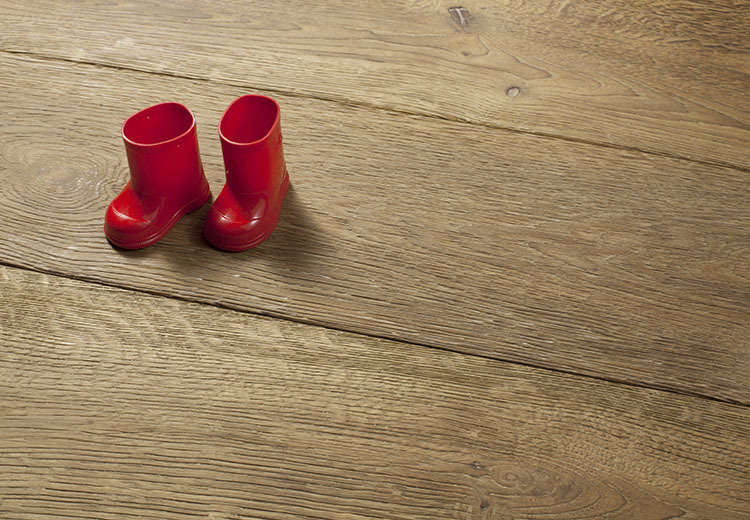 The Design Collection is a French, white oak floorboards collection. Oiled, smoked, brushed, micro-beveled edges … This collection fits perfectly in a more modern interior. 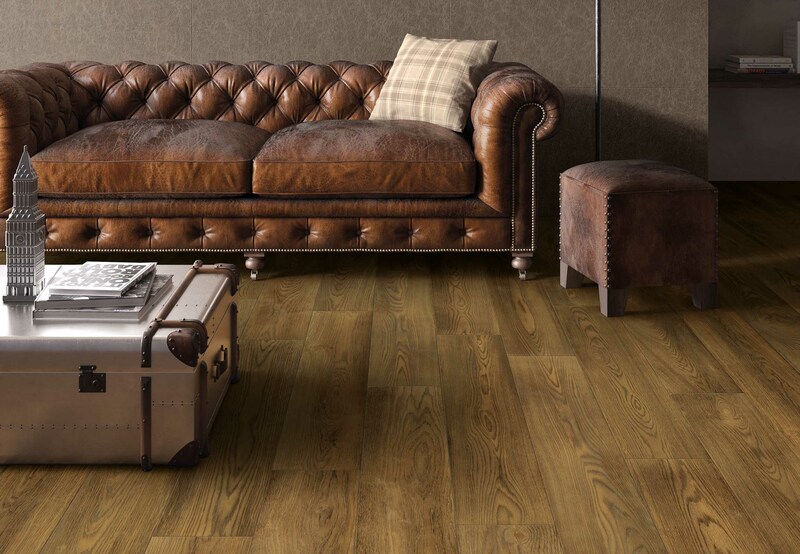 Vintage is the wood floor that has revolutionized the definition of Home. 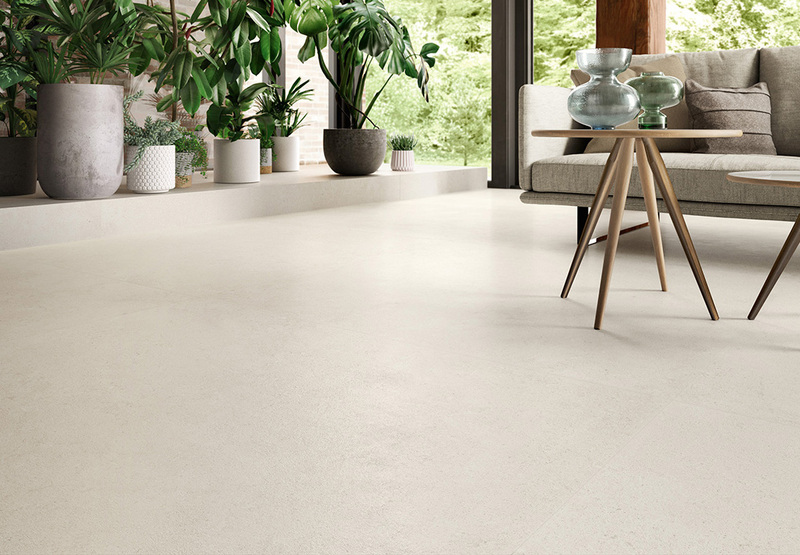 Life collection especially designed for those searching for a prestigious floor, in a high concern of the details with an extremely natural appearance. Inkiostro Bianco (I.B.) 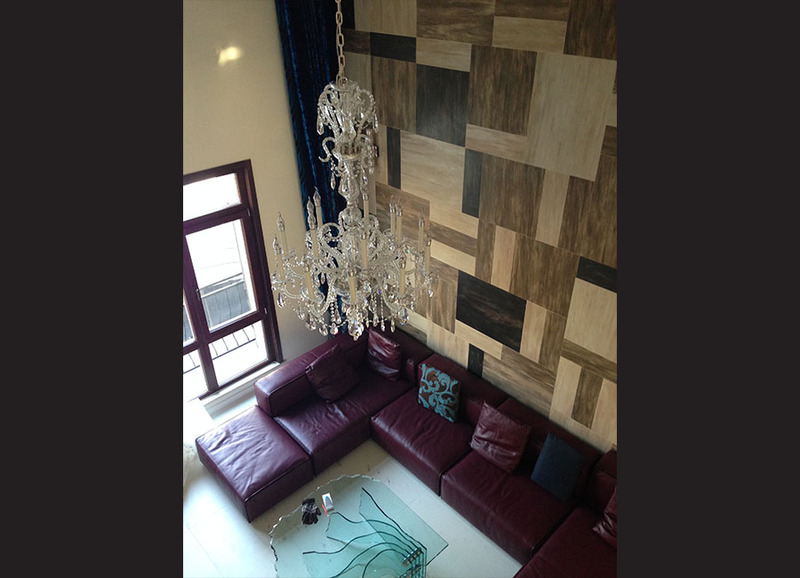 is a company specialized in the production of continuous and decorative artistic and customizable thin coverings. 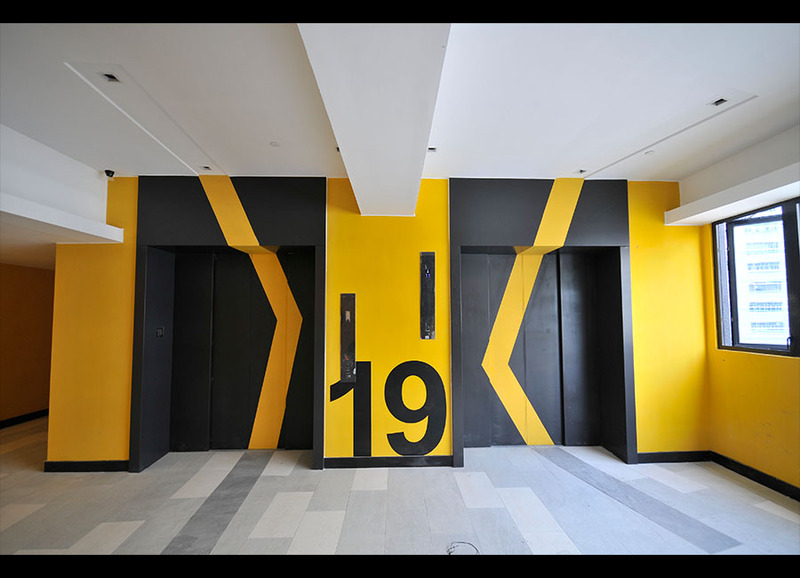 It is a brand, an ambitious project and a workshop of ideas applied to the design and production of decorative graphics, whose goal is to reinterpret the interior wall coverings for all surfaces. Pictorial art and digital graphics converge in the Inkiostro Bianco range to form original creations with a strong personality. This results in exciting canvases that transform surfaces into avant-design accessories. Inkiostro Bianco (I.B.) is a company specialized in the production of continuous and decorative artistic and customizable thin coverings. An attitude in line with the traditional critical role of most of collage and décollage as an artistic technique of denunciation, to Andrisano, it is a complex investigation of identity, identification and gap between generations. Smooth and intersected grain for a wood that can be carved with the ease with which it fills the room. Fascinating, alluring, sought-after: the stylistic and linguistic choice tends towards classiness with a strong personality. author has been able to develop a path which , rereading syntactic and visual elements of mass communication , active approach creative artistic representation in the direction of a "New Italian Pop Art " . The change is expressed through an ease uninhibited that dares the combination of baroque and eighteenth-century re-enactments, country scenes and ladies figure. Stylized floral weaves spotted emerging from a background as wall tattoos. Collection: Burnt Ichiama a simple story, that of the earth, the origins of the family. The paper shows the signs of the ancient Japanese art, without revealing the complex and fragile form from which it was released. Designer: Barbara Varini From 1996 to 2011 he worked first as a creative graphic, then as an art director in two advertising agencies, experiences that give way to confront commercial areas, very different needs and communication tools. The unbreakable bond with the beauty the door to an interest in furniture, art, photography and to keep alive the wonder of all that brings itself an aesthetic value. 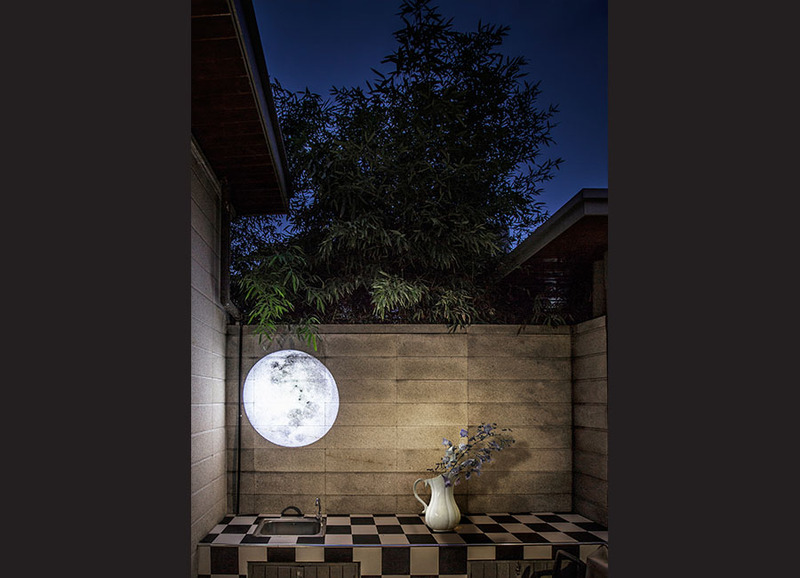 Collection: Backyard A beating of wings transforms the environment. Pinned on the fabric, woven in floral pattern, butterflies are drawn on the fabric with perfection. Fragile and happy, light as a petal, like a thin anddiscreet decoration. Collection: Brera The heart of the city, enclosed in your room.Neighborhoods, streets, buildings: a map of the path of everyday existence that redesigns the environment and perhaps even the lives of those who walk. Collection: My dam A damask decoration material stealing the colors of nature, in shades of sand, the clay, through the plant and the intense blue green. Combined with a wooden bottom follows the natural grain for a draped effect. 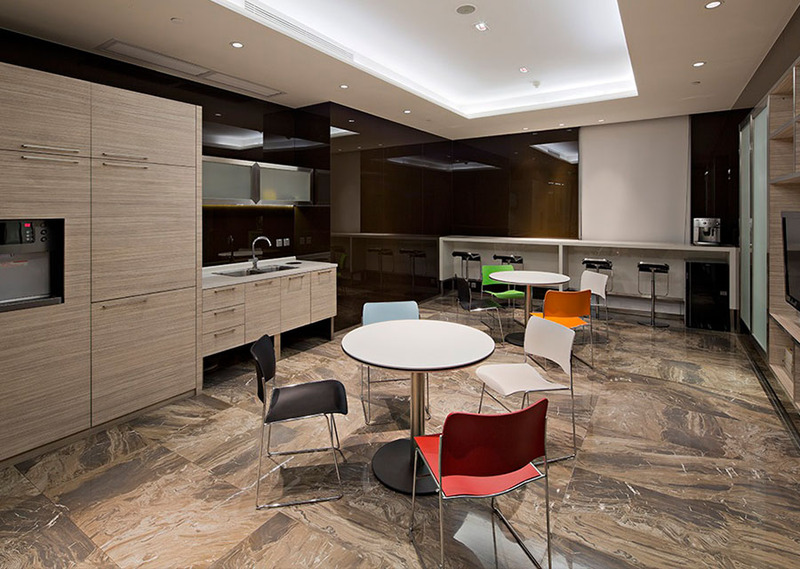 The effect is a soft tissue in seven shades for modern -classic environments. L’Opificio Collection Fabric and paper amalgamate, creating contrasts between materials, blending lively and profound shades and bringing to life unprecedented captivating atmospheres. Fabric decoration and weave find a new space for expression and environments take on a warmer and more sophisticated dimension. All graphics have been inspired by fabrics of Turin-based manufacturers of furnishing fabrics and velvets. Collection: Palace The Seletti objects, the recognized brand and proven throughout the world for a series of collections that have launched design classics, come on saved thanks to the collaboration with Inkostro White. Creativity and artistic ideas come together to overcome the limits imposed by the object and embark on a new journey of design and beauty. Collection: Eggs of Columbus The Seletti objects, the recognized brand and proven throughout the world for a series of collections that have launched design classics, come on saved thanks to the collaboration with Inkostro White. Creativity and artistic ideas come together to overcome the limits imposed by the object and embark on a new journey of design and beauty. Designer by well-known designers across the globe. Designer collection is aimed at providing the most stylish and charming art to dress up and improve the environment. Designer: Dany Vescovi Dany Vescovi was born in 1969 in Milan , the city where he currently lives and works . For several years Bishops pursues and goes on a floral theme that has become a personal standard . The dark colour, the solid consistency and the fine grain. 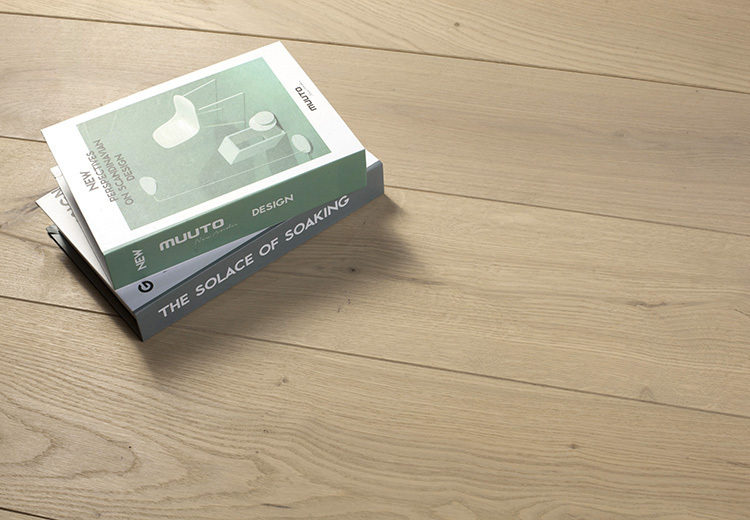 An ideal textured surface for floors or walls, in unexpected associations with other materials. Collection: Cerere Earth, plants and air. The design of nature becomes color, food and design are mixed on the surface with warm tones of a summer camp. Collection: Tin Can The Seletti objects, the recognized brand and proven throughout the world for a series of collections that have launched design classics, come on saved thanks to the collaboration with Inkostro White. Creativity and artistic ideas come together to overcome the limits imposed by the object and embark on a new journey of design and beauty. Matter, in its most natural form, meets décor. 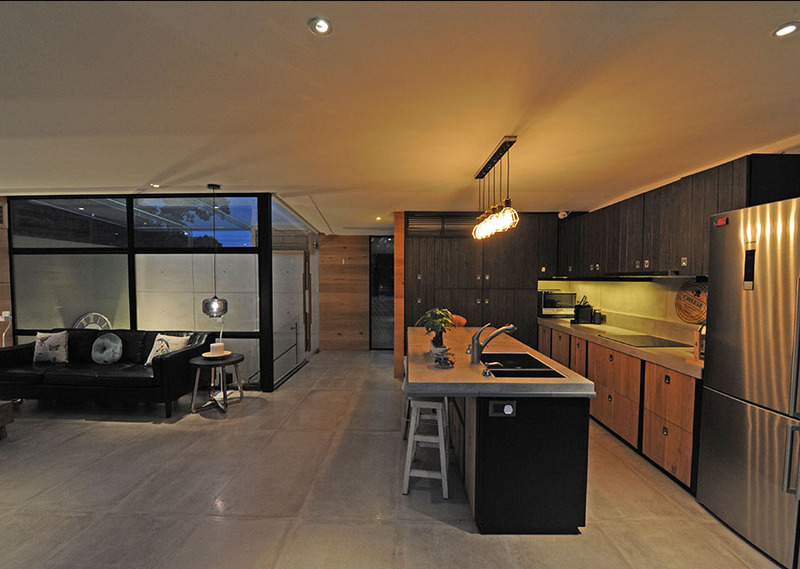 The wood, marble and concrete reveal intrinsic elegance in the details of their grain. Designer: Piero Cane In 1994 she opened her first personal and significant in Casale Monferrato , followed by solo and group exhibitions . Intense colors , neon , colorful paints and contrasts for a decoration from unexpected symmetries , with references to nature and objects of the past lingering charm . 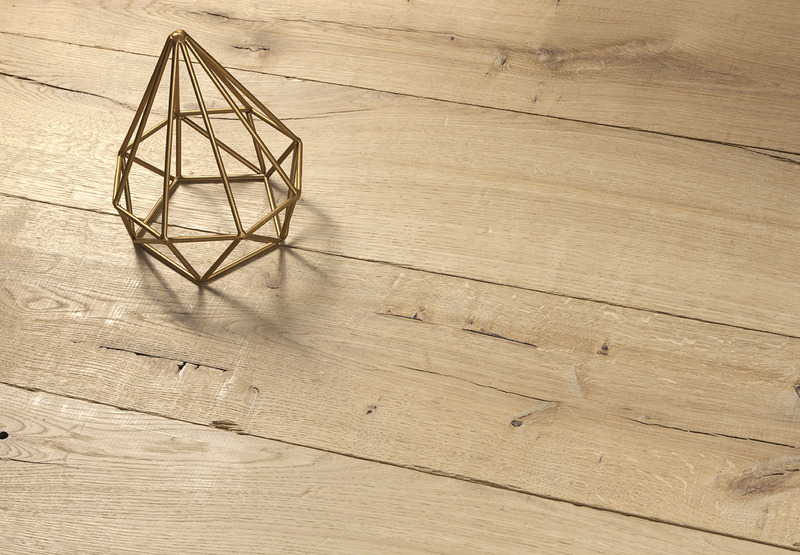 Quality wood, in its various tones and textures, takes on a new dimension in a hypnotic game of shapes that gives the surface an elaborate three-dimensional effect. The decor meets the stone for a contemporary reinterpretation of the ancient earthenware. Collection: Chateaux Glitzy and opulent. On graph paper the project is meticulous. The fineness of detail suggests the luxury inherent in the realization. Collection: Avenue Canestro The Opificio by Inkiostro White: all the graphics in the collection start from the tissues of the Opificio, Turin manufacturer of fabrics and velvet furniture, reworked graphically in collaboration with Inkiostro White for digital printing on vinyl or EQ -Decor. Seletti collection Objects by Seletti, a successful brand well-known throughout the world for a series of collections that launched design classics, have now become décor thanks to the company’s collaboration with Inkiostro Bianco. Creativity and artistic inspiration come together to surpass the limits of the object and embark on a new journey in the pursuit of design and beauty. 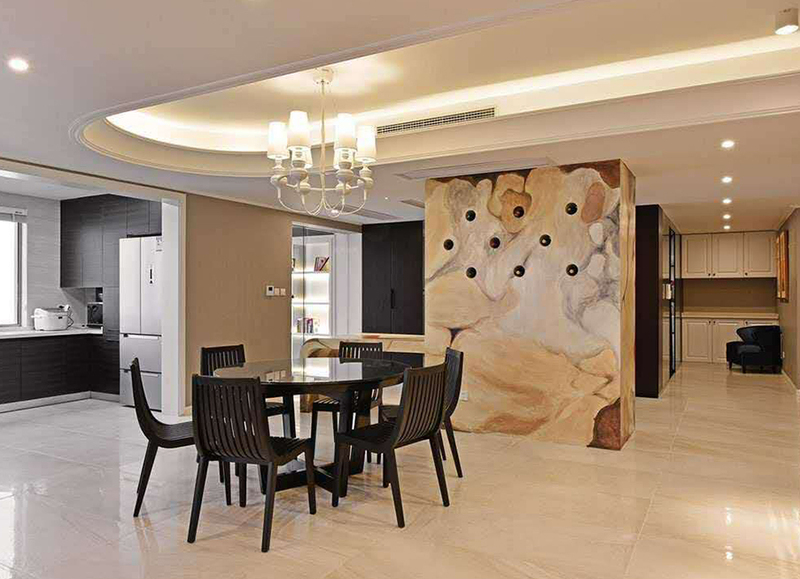 Innovative graphics completely cover the room, enhancing its charm. Freed from all constraints, the images jump out from the surfaces, their size and impact expanding, captivating the gaze and magnifying every sensation. Designer: Carlo Cane Miniaturist and goldsmith for several years . These are not just images impressed onto paper, but sensations expressed on surfaces, bringing exclusive value to environments. All the graphics have been designed by Inkiostro Bianco’s creative workshop. Incidentally, broken, color, cut and assembled: so compact, so flexible. Collection: Chysan Almost a quilt.Cushioning effect for the brown skin from unexpected nuances. The temptation is to lean on the soft. Collection: Paralume The Seletti objects, the recognized brand and proven throughout the world for a series of collections that have launched design classics, come on saved thanks to the collaboration with Inkostro White. Creativity and artistic ideas come together to overcome the limits imposed by the object and embark on a new journey of design and beauty. Fabric and paper amalgamate, creating contrasts between materials, blending lively and profound shades and bringing to life unprecedented captivating atmospheres. Nicoletta Ceccoli invites us to slip into the dream of her diaphanous protagonists. Geometric figures playing in symmetry with the scales giving flexibility to austerity inherent in leather and creating dynamic coatings and extremely elegant. Flowers stand out against the rock, bringing a touch of lightness to the solidity of the material. In mass production, the stone surface is shown their true nature. An army of tiny robots vintage flavor engraved on the wall. Designer: Francesco Botti In the field of fine art he has planned and designed the pediatric ward of the hospital in Modena, achieved anatomical illustrations for the school district and produced designs for various publishing projects. Collection: Costura Almost a quilt.Cushioning effect for the brown skin from unexpected nuances. The temptation is to lean on the soft. Objects by Seletti, a successful brand well-known throughout the world for a series of collections that launched design classics, have now become décor thanks to the company’s collaboration with Inkiostro Bianco. It is impossible to miss the connotation, just a microgeometric Greek pattern to give the surface flexibility. Natural like wood, soft as the shades of the sea and sand. recovery and light decorations material for a color contrast marked by a letter enigmatic and symbolic. Designer: Barbara Varini From 1996 to 2011 he worked first as a creative graphic, then as an art director in two advertising agencies, experiences that give way to confront commercial areas, very different needs and communication tools. Collection: Dioniso Intense and ruby as the berry pulp, like the rose that intertwines the lives, like wine, like the lips of which flows, like passion. Designer: Cosimo Andrisano An attitude in line with the traditional critical role of most of collage and décollage as an artistic technique of denunciation, to Andrisano, it is a complex investigation of identity, identification and gap between generations. Designer: Giuseppe Linardi In the present is a polyvalent artist who, in addition to the decoded pictures, creates installations and sculptures with plans in the future to also deal with video , convinced that every idea has necessarily its half. Charmant collection Fascinating, alluring, sought-after: the stylistic and linguistic choice tends towards classiness with a strong personality. The decorations are more three-dimensional and independent than ever before. Paper becomes fabric, leather, paintings, matter and art. Collection: K`op Strong as stone, is designed like a geometric overlap . Who says that is good only for the floor? Fine fabrics with soft and rich decorations that appear to emerge in relief like rugs, real damasks or brocades. Collection: Lapislazzulo Naming precious and vintage flavor for the composition of tiles available in the versions on blue or gray shades. A revival in marble base. Inkiostro Bianco collection Innovative graphics completely cover the room, enhancing its charm. Freed from all constraints, the images jump out from the surfaces, their size and impact expanding, captivating the gaze and magnifying every sensation. Elegance and geometry backdrop to the large still lifes of Noblesse Oblige range on refined brocade appear similar inserts tiles which focus attention on the details of the composition. Collection: Match A stone carved in geometric structure of cardboard effect, ideal for an unusual floor on the gray shades. Designer: Susanna Mandelli Philip Stecconi, graphic since 1995, began his career working with the internationally renowned architect and designer Massimo IosaGhini. Collection: Faba Like a treasure chest that hides a treasure, like a room that borders shared intimacy, as a pod enclosing her legume. It protects it and brings it to maturity. As the most natural of nursing acts. Collection: Saloon Like recycled material, as if the wooden boards had been nailed together to divide the space temporarily. Effect coffered oak in two colors: natural or gray smoke. Collection: Freetime Fragments of memories on the cabinets. Moments of victory and effort, moments of competition and shared joy, a sports metaphor. Designer: Dany Vescovi For several years Bishops pursues and goes on a floral theme that has become a personal standard. Precise lines, tone-on- tone shades, coatings glazed, three-dimensional facets. Collection: Traces The decor is structured to effect the color game is geometrical and the reference material is cooked. no perfect time for a stylish and comfortable floor a classic style. Collection: Karoi Sketches, scribbles and strokes: on the lines of the book the author's hand comes from afar. 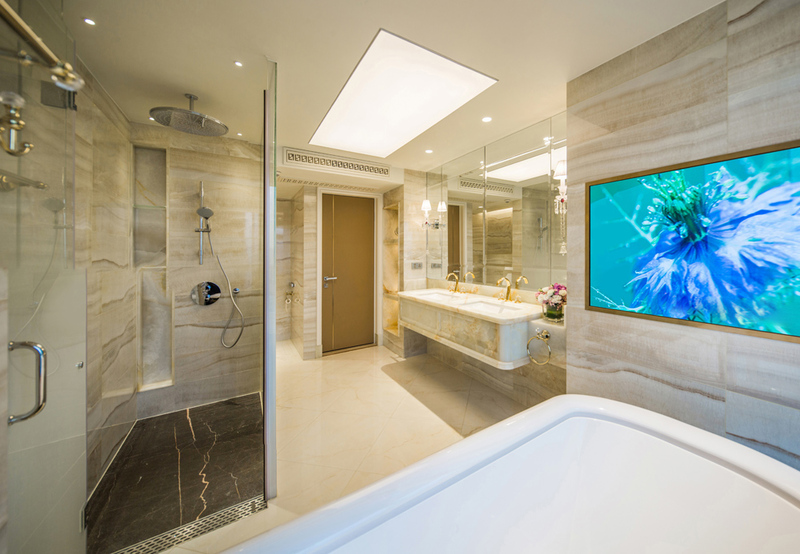 From an East that prefers the soft decoration, where the seabed, marine animals and corals can be glimpsed and overlap furnishing with discretion. Designer: Stefano Fioresi Thanks to its experience in the advertising industry, passing through a particular and innovative reinterpretation of elements of the Pop Art of the Seventies and Eighties. Collection: Ville Lumiere That you admire the banks of the Seine or from the top of the Eiffel Tower, its skyline remains special. Is that unique and magical city that illuminates everything. Even an ironic composition of plaster, electrical wires and illustration. Collection: Koan Creativity and artistic ideas come together to overcome the limits imposed by the object and embark on a new journey of design and beauty. Fabrics with an antique flavour bring to life impressive settings, in which the surfaces acquire a warm and stylish three-dimensional quality. Collection: Floral Waves A wall of bleached axes and work with delicate laser engraving for a natural effect and live panel. Collection: Damasco Mild and delicate, yet imprinted on the stone. Porphyry appears on a damask decor in soft shades, ideal for both walls and floors. Designer: Dany Vescovi The artist combines figurative and abstract geometric painting with photographic precision, in compositions with a strong dynamism . Collection: Strange World A portion of the world in your room. The hemisphere is designed to stretch the fabric enhanced by a minute of geometries game. Designer: Dany Vescovi The artist combines figurative and abstract geometric painting with photographic precision, in compositions with a strong dynamism. Reliefs and ripples to form the impressive graphics frame but never heavy. A strong palette of shades of red and brown living, is coupled to hot and tribal neutral, on a background of abundant shades of gray and beige. Collection:ToraTora A trip, a map, a mountain, a plane.Definitely a project that deserves to be realized. Designer: Carlo Cane In 1994 she opened her first personal and significant in Casale Monferrato, followed by solo and group exhibitions. Collection: White Raw Work in progress: almost finished, almost ready to welcome you. Just like your story. Designer: Stefano Fioresi the author has been able to develop a path which, rereading syntactic and visual elements of mass communication. Collection: Zee Stone, fabric and light blue. The raw material is mixed with color in soft and wavy shapes. A texture that immediately recalls the sea, the primary source of life and inspiration, for a poetic suggestion of the wall. Designer: Nicoletta Ceccoli Nicoletta Ceccoli invites us to slip into the dream of her diaphanous protagonists. Collection: Urban Rose A written, maybe a poem, a rose and on the bottom the city that fades. Perhaps a dedication, perhaps a memory. Artists collection covers the original artistic works of many internally famous artists from Italy. Collection: Box 6 A factory, perhaps a workshop.Abandoned atmosphere, hints of experienced, serial and intensive work. 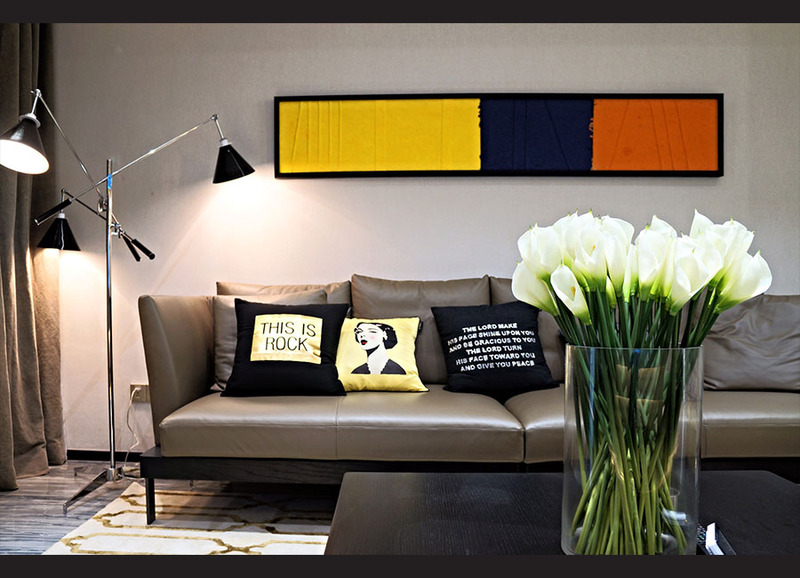 A retro urban perspective that gives new value to the room. Collection: Bye ByeDargonfly A sweet farewell between flowers, dragonflies and cloth.Contrasting styles of illustration as the character of the protagonists of the scene. Designer: Jeanie Leung he wants to touch people's hearts deeply with her drawings and paintings. Collection: Candywall colored tiles ? colorful mosaic ? No, a colored paper and modular can liven up any room with its sweetness . Collection: Dreamland The roots well sunk in the clouds, frames pinned to the sky waiting for a subject and a suspended cabin: is the space of your dreams, fill it. A country of rusty metal watercolors in which to get lost. Collection: Fuzzy Foam Carved like a beehive, a geometric superposition of stone that touches the effect tile. In simplicity, the class that never tires. Collection: Happy Terry In search of the wings : a race between robot , butterflies and cloth . Contrasting styles of illustration as the character of the protagonists of the scene . Designer: Barbara Varini Barbara in 2011, acquired extensive and versatile experience, starts its design studio and began to work even styling of virtual environments and to wallpaper graphics. 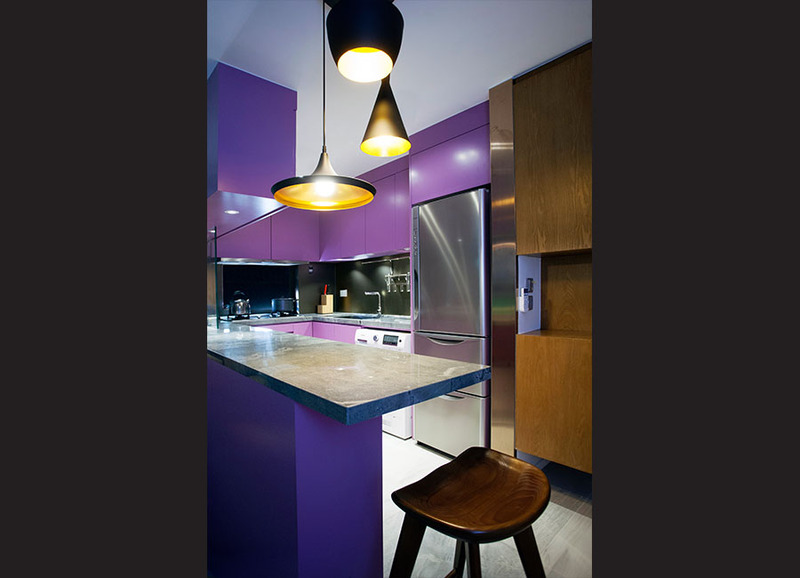 Special attention to the color, harmony and elegance are features common to many of his projects. Collection: Merry Go Throughout childhood enclosed in an image, cheerful and sweet moments like the slow whirlwind of carefree carousel. It's time to have fun. Collection: Pink Metal As a watercolor on metal slides, it widens to compose an indefinite decorum and iridescent. Pink effect on etched glass for a sharp contrast between the soft brushstroke and the coldness of the metal sheet. Designer: Davide Lovatti His work is a relentless pursuit interested in conjunctions, connections, relationships between idea and form, between tracks and decipherment . Collection: Poem Immortalala and let her go. A photo, a written, a page to fix that memory, a wall would not forget it. The profile of a woman, a sailboat, a sentence and a stamp: a glimpse of concrete that leaves room for interpretation . Collection: Postcard Light as the brush that defines it, the hummingbird is a decoration in watercolor on a stone finely engraved. A painting hanging in time and matter. Collection: R Hobby Like a scribble on a vintage saved . Irresistibly out of place and out of time. Collection: Separe Elegant, graceful and soft shapes, light and bright colors, in a single supplement is all the charm of a century by the contrasting styles . 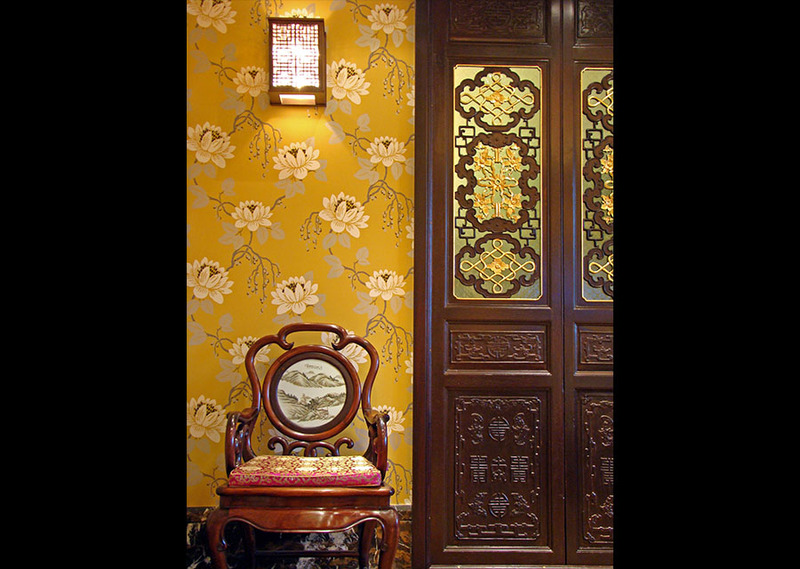 Refined and noble, the screen is the 800 original, with its wooden carvings, decorations on cloth and paintings on paper. Designer: Stefano Fioresi Author has been able to develop a path which, rereading syntactic and visual elements of mass communication, active approach creative artistic representation in the direction of a "New Italian Pop Art ". Collection: Sigh On tiptoe for a sigh. Light as the breath that in an instant the room and free your mind of all that is superfluous. It is a silhouette from the fifties inkling that stands out on the concrete wall intent to remove words, thoughts and objects. Collection: Sizeless The right fit ? What you decide. A notch on the wall for each milestone, a calculation for each objective, a number for each thought. Designer: Aura Zecchini Clear and enveloping lines that reveal a microworld underground made with great attention to detail and great compositional skill. Collection: Skin in bloom The energy of spring , skin refinement, for a wall flower in earthy tones . Collection: Slip out Fleeing from the past, by the immobility of a picture too close. 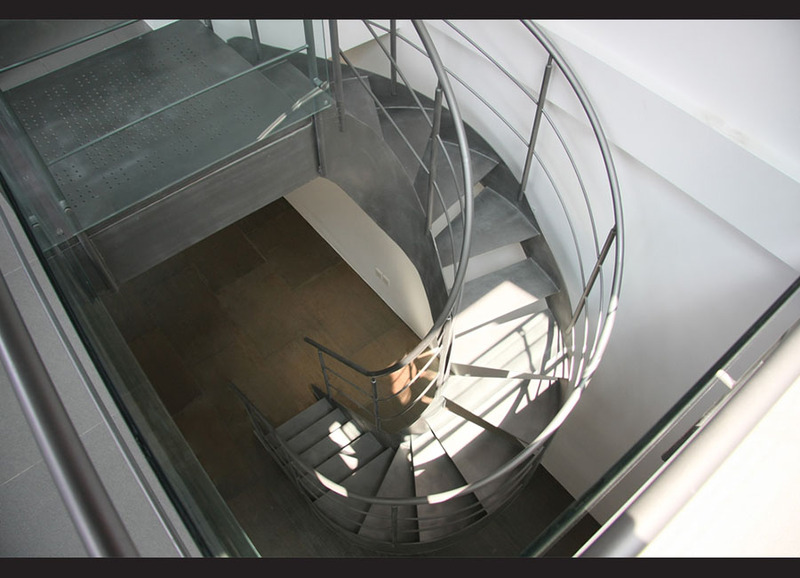 Outside those limits, to freedom, down a staircase designed to stretch rope effect on a soft bottom wool bouclé . Collection: timeless The time has stopped, the hands are still as butterfly wings. Faded color, ripped the fabric, perhaps the remains of an ancient precious box is saved. Collection: Almati Eastern taste and corroded, hypnotic geometry and strong colors that characterize strongly the environment. Collection: Ancient Melody Warm tones and elegant, inspired by the flock. Thin graphic elements taken from antique fabrics and damask from painting for a backdrop suitable for any environment . Designer: Stefano Fioresi Author has been able to develop a path which, rereading syntactic and visual elements of mass communication. 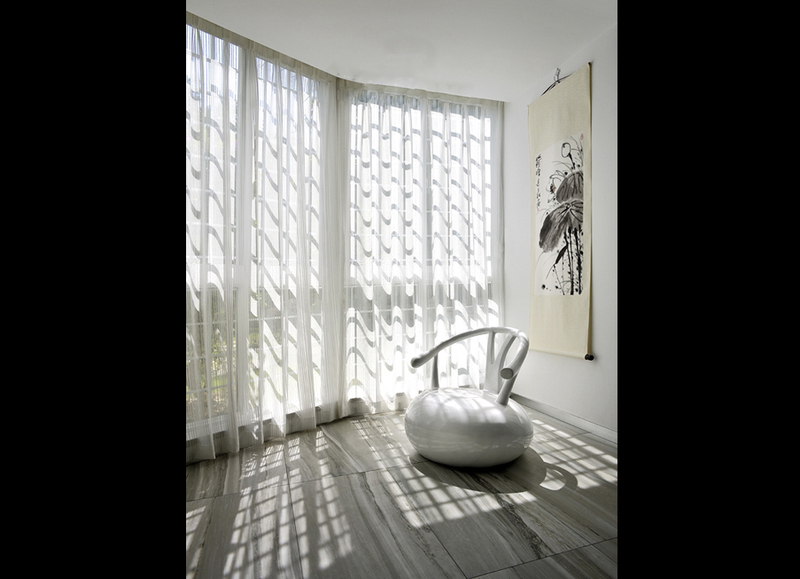 Collection: Breath As light as a breath, soft like a flower, like a breath on a wall in neutral paper shades. Through the artistic graphics and patterns, this collection is able to create an environment which is full of colors and personality. Collection: Caelestis Simply heavenly. Pregnant, intense and delicate. The immortal charm of sculpture for luxury environments where minimal is synonymous with refined and elegant. Designer: Piero Cane In 1994 she opened her first personal and significant in Casale Monferrato, followed by solo and group exhibitions . Collection: ClaCla The strength and the charm of an old bark confer authority and sophistication to the wall and to the environment. Collection: Crazy Flowers Seems to be able to perceive the scent, an eccentric flower alone furnishes the room. Collection: Cuisine Sucree An absolute pattern made from old vintage-inspired dishes and an exclusive seal by the sweetness fifties. Designer: Aura Zecchini The art of Aura Zecchini: ethereal and sinuous as reeds in the wind, fragile as rice paper, furniture and floating like butterfly wings. Collection: Enchanted forest Like a vision in the mist, the trunks are those of an enchanted forest. Collection: Flamingos A strong presence that watches silently and the environment fills with color. Collection: Floral Waves Stylized floral weaves spotted emerging from a background as wall tattoos. Light weight is not always easy. Collection: Free States Around the World on a wall. 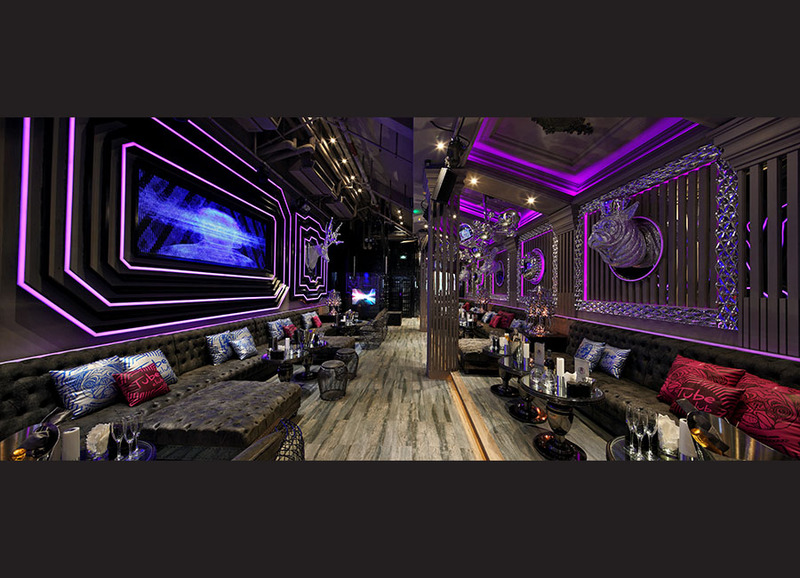 graphic overlays and background scratched for an innovative and vibrant décor that borders on three-dimensionality. Collection: Iceflor So icy so delicate, like a white flower in the snow. Collection: You and Me You and I, on my wall. An indelible statement on memories surface. Collection: Wood cut Sectioned and combined, show the lines of their own lives. Each with its size, each with its own history. Collection: My King Witty and irreverent, ironic illustration in black and white. The protagonist does not need any introduction. Collection: Tartan The symbol of a people on cloth, a defined pattern that is repeated to form a distinctive interweaving of elegance and pride. Collection: Mystic Garden In the balance between the exotic and the vintage, watching the bamboo reeds you dive into a mysterious garden. Collection: Tangle The TajMahal, Humayun's Tomb , the inspiration comes from the most famous Indian monuments. Frames around ports like arabesques in a candidly oriental composition. Collection: Stave Cement and geometry for a composition of decidedly urban slabs. Collection: Slate Solid and refined, a large mosaic slate to be placed in the brightest room. Collection: Silverware For special guests or for the most exclusive rooms. Get out the silverware. Collection: Shabby Chic A small decoration of flowers, paper and bubbles for a wall of great effect that makes even the most minimal chic environment. Collection: Pluma de pavo The most regal animal feather, an indelible touch of elegance and sophistication to any room. Collection: Secret Door An ancient secret passage and into the unknown. The mystery of the ancient wall decorations and charm of carved wood doors for an irresistible vintage appeal. Collection: Rusty Gate The charm of the experience, of the consumed by time and wear. 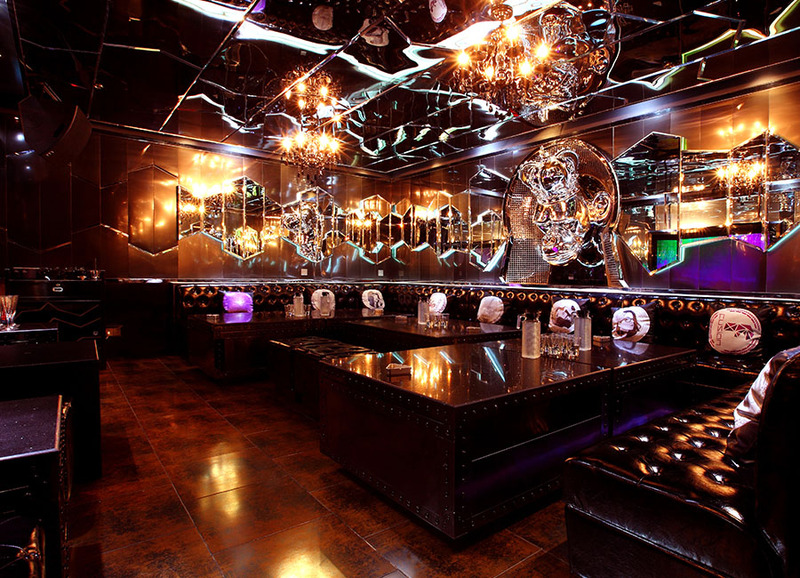 A rusty grate and abandoned, a rough surface that gives the room a strong urban connotation. Collection: Reinassance A sophisticated on marble bas-relief, a frame for the noblest dreams. Despite material, shape, furniture, lighting and many other aspects, the experience of space should be mixed with circumstance and nature. Depend on the food products, all of these could bring customers immersive consuming experience. 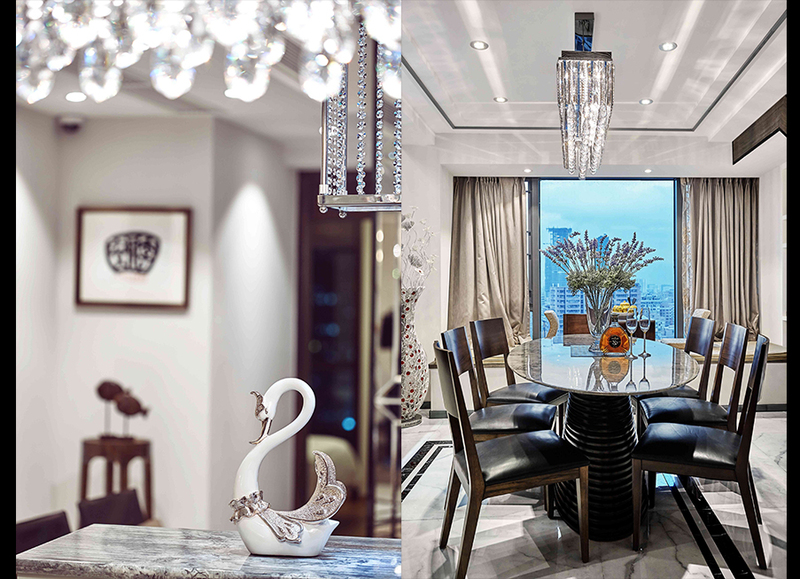 In this case, the host is a city planning designer and the hostess is a jewellery designer. 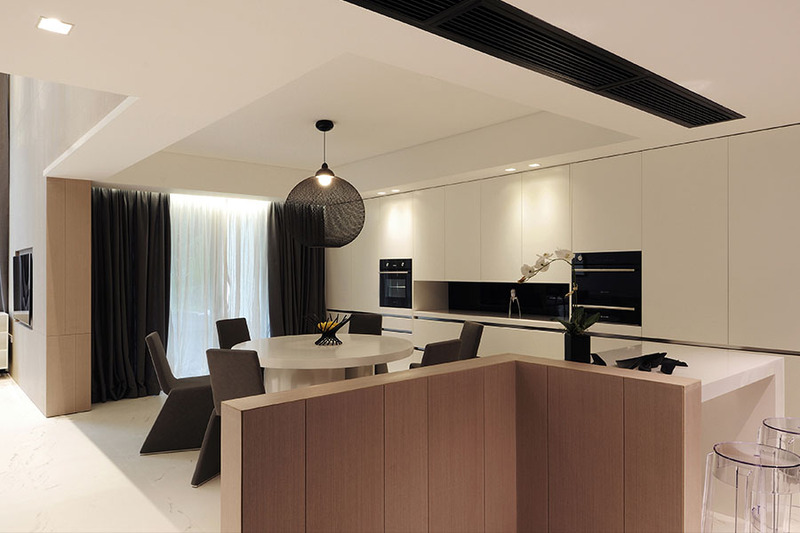 At the very beginning, the internal designer already found that there were a lot of common interests between him and the owners, which made the project went smoothly. 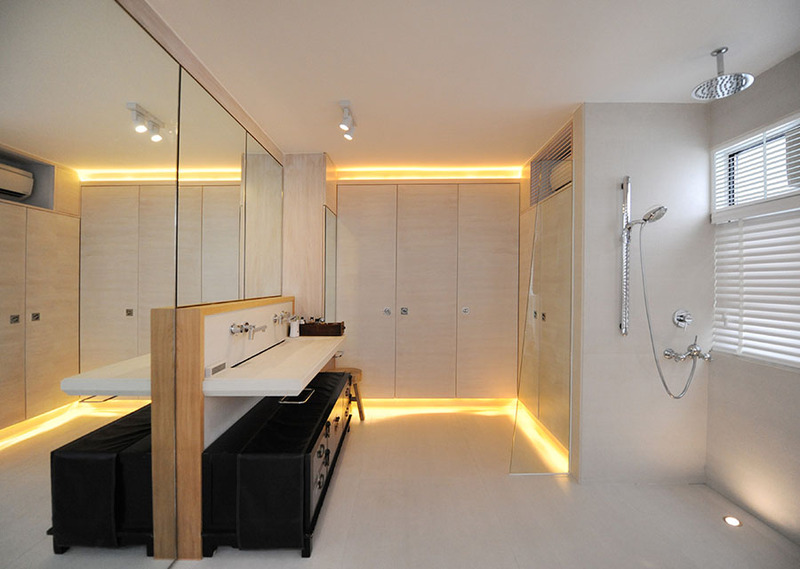 Throughout the project, the owners gave a lot of room to design and good advice. The master bedroom continues the coolness of the living room. The dark space is surrounded by iron plates, shimmering sandstone walls, and a starry sky top. The study room is also a computer room. 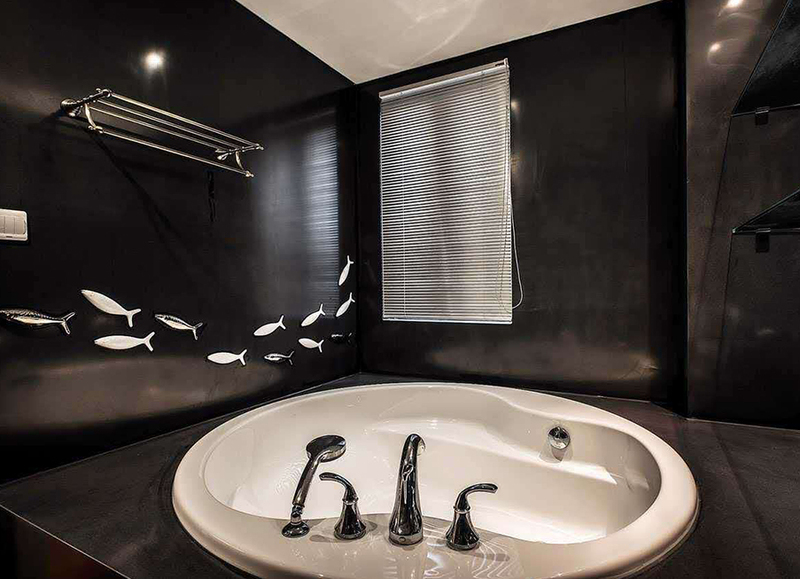 This project takes the modern simplicity as the theme.Black,white,grey and wood are coordinated as overall tone,simple but do not lose warmth.Also because the owner likes the natural thing,especially the animal,so the designer creates a space that is full of natural breath and humanistic flavor for the owner. This is a traditional layout in Huarun City with an entrance garden of 4.5 square meters. 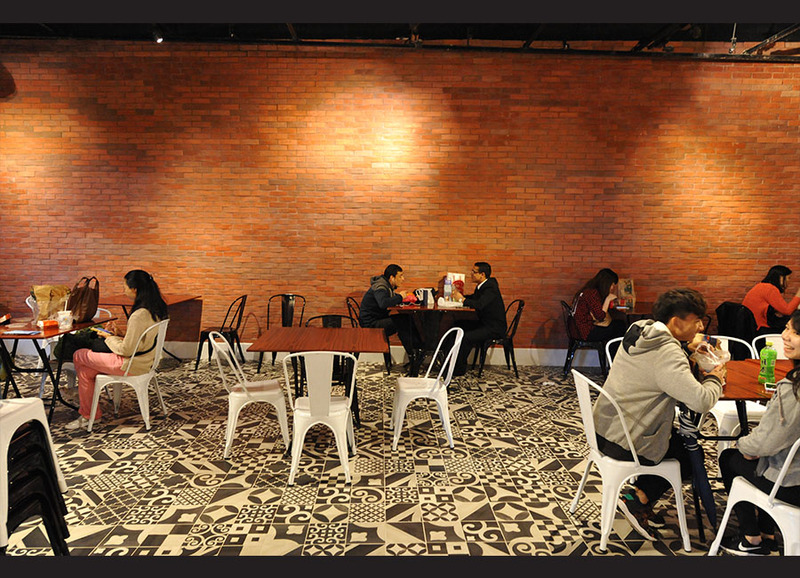 For the Native Collection and these kinds of tiles in vintage style, grout is very important. 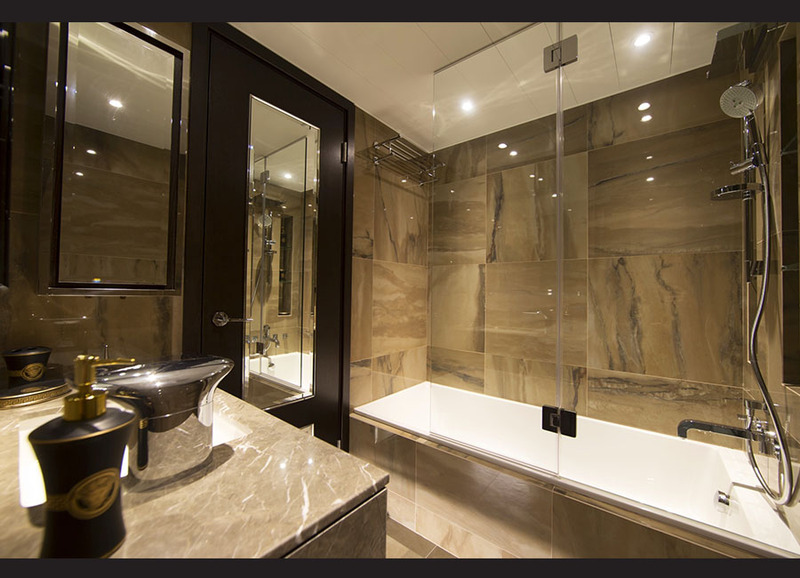 The colour of the grout was selected directly by the owner. 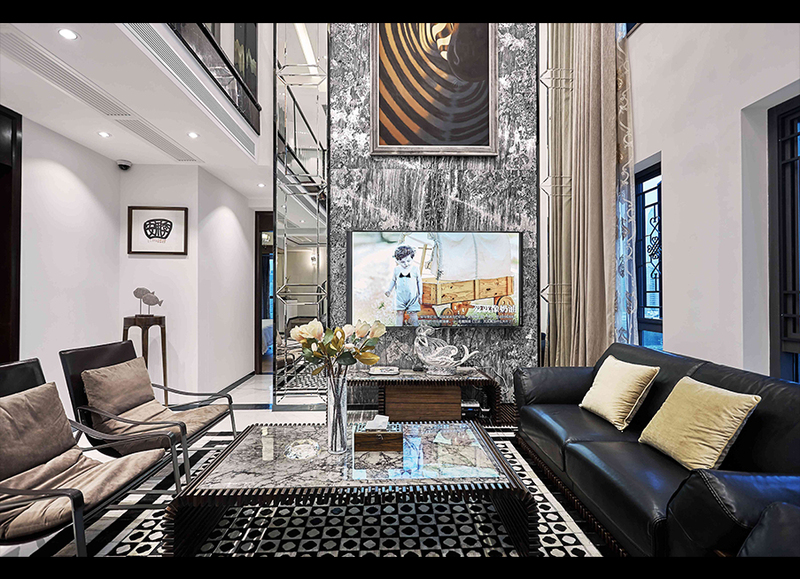 With clean and modern lines and material technology as well as the space partition formed by polished metal shapes, this design uses polished panels, custom brass and geometric pattern for decoration, aiming to make a home that rich in art deco style with a luxurious atmosphere. 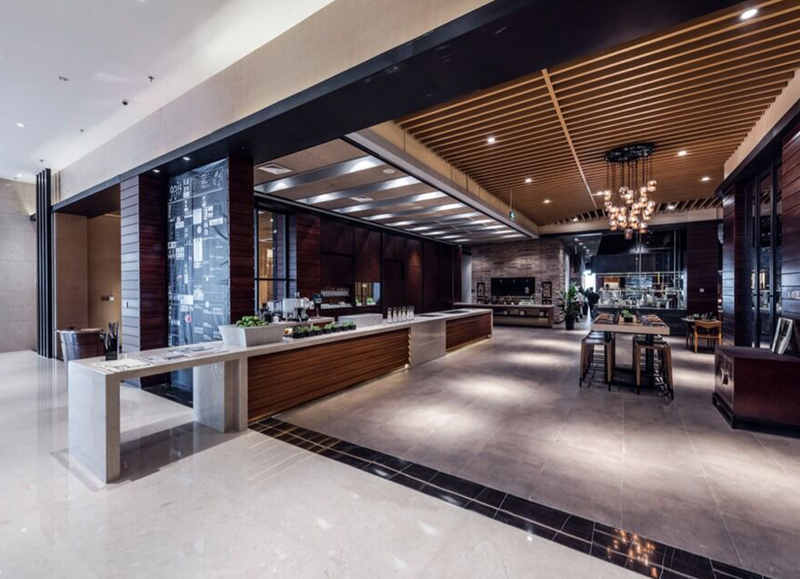 Through the combination of elegant marble texture, elegant and noble metal line, and natural and stable wood veneer, it gives the guests an elegant and quiet indoor atmosphere. 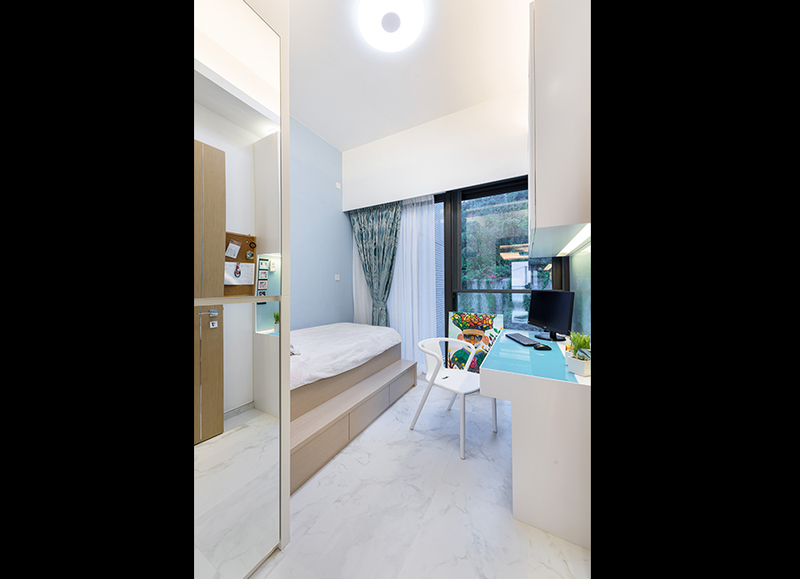 The project is white as the maintone, white wall, embedded lockers, presenting distinguished and extremely beautiful simple style. 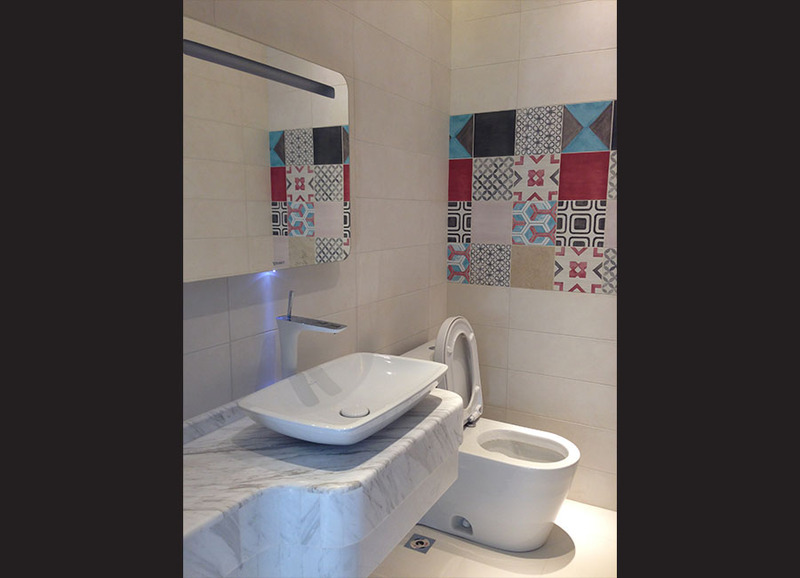 Toilet with light color tileof Pietra di Basalto collection and Digitalart collection, is consistent with the overall tone. But white make people feel cold, in order to increasing warm feeling, designer use wood flooring from Gazzotti Smile collection and Life collection in several ground, which have a highly captivating flooring for elegant spaces. 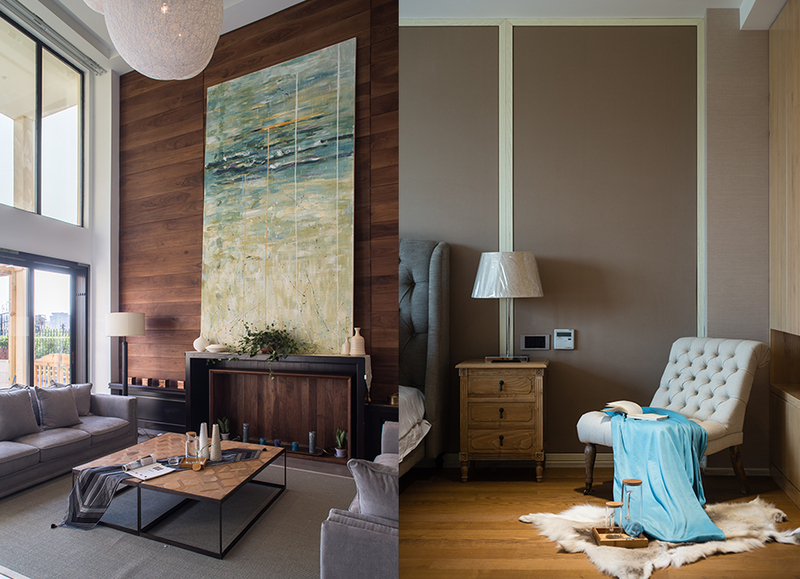 This project is a renovation project for an old penthouse, aimed at satisfying theneeds of the owner by increasing the comfortability and making a better use ofthe space. Designer chooses Viva Statale 9 by G.e.t. Casa to create the inspirational flooring for the living room and kitchen. The natural sensation by Statale 9 merges with the natural landscape and lighting around the house, to intensify the harmony and conformability in the area. 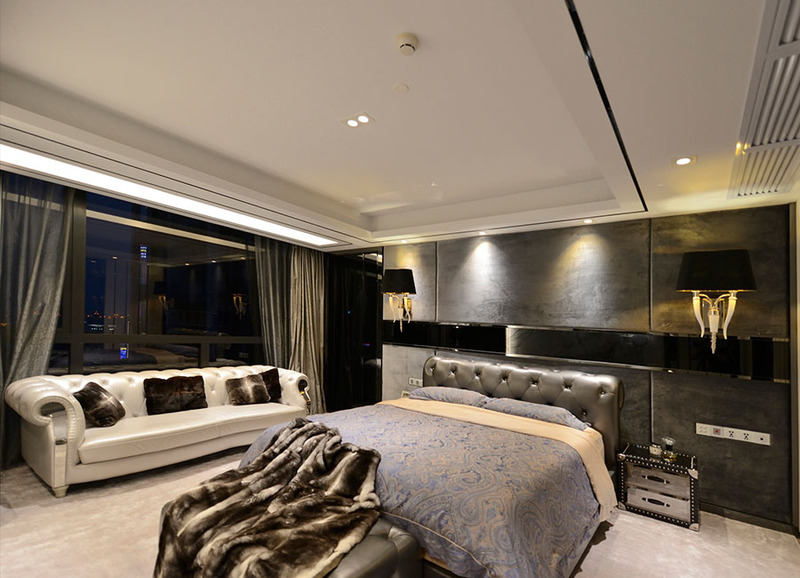 This project is a luxury apartment in North Point, Hong Kong, owned by a young couple. 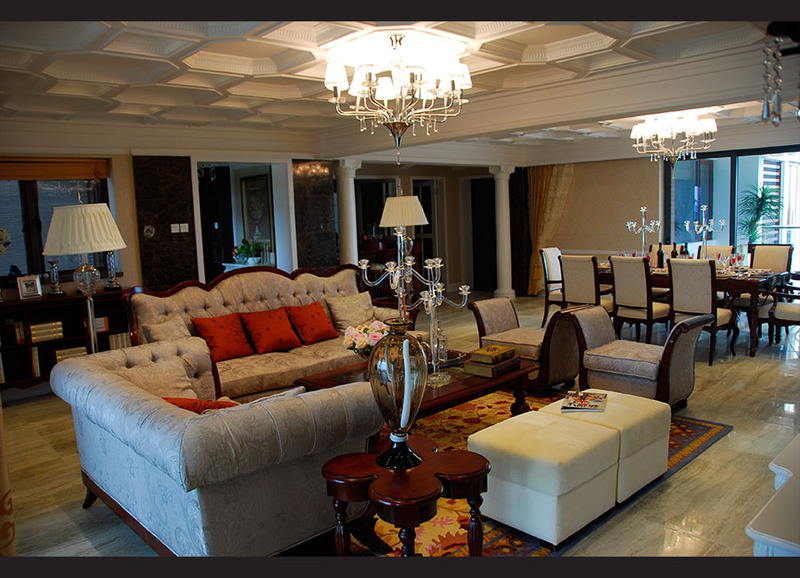 Surrounded by a wonderful lake-view, Liuhua Royal Apartment is the renowned luxury mansion in the town. 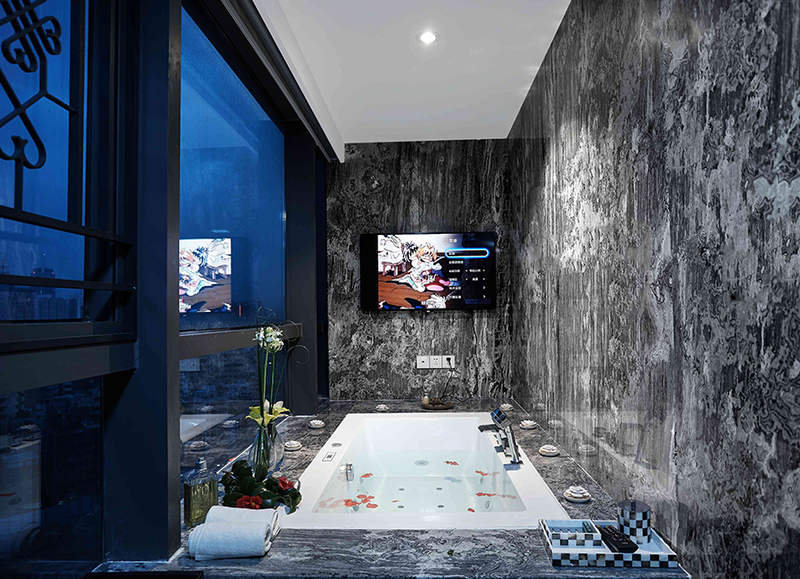 Imagine you are sitting on the spacious sofa at the sitting room, embracing the Liuhua lake picturesque scenery through the window, and now you can realize the perfect fusion of indoor and outdoor, artificial and natural, modern and classic, fashion and luxury, that will never fade. At the right side of a large reception hall, is a whole-wall bookshelf neatly stored the rich professional knowledge; on the left is a French window welcoming the sunlight from outside. 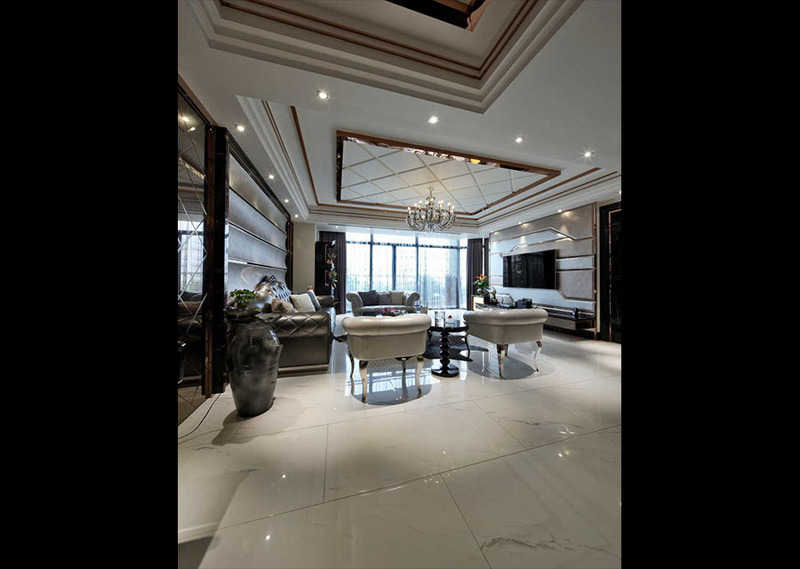 This project is a luxurious penthouse project in Taizhou, China. 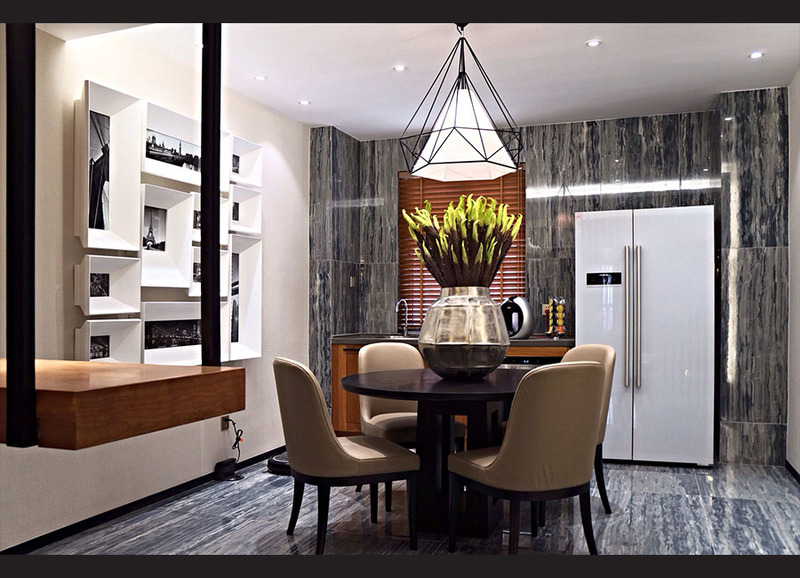 The main theme of simplicity is throughout the whole space, along with the ambience of elegance. In wardrobe showroom, G.e.t. Casa Gazzotti`s Life and Vintage series wooden floor are selected, adding a rich natural atmosphere of the hall. 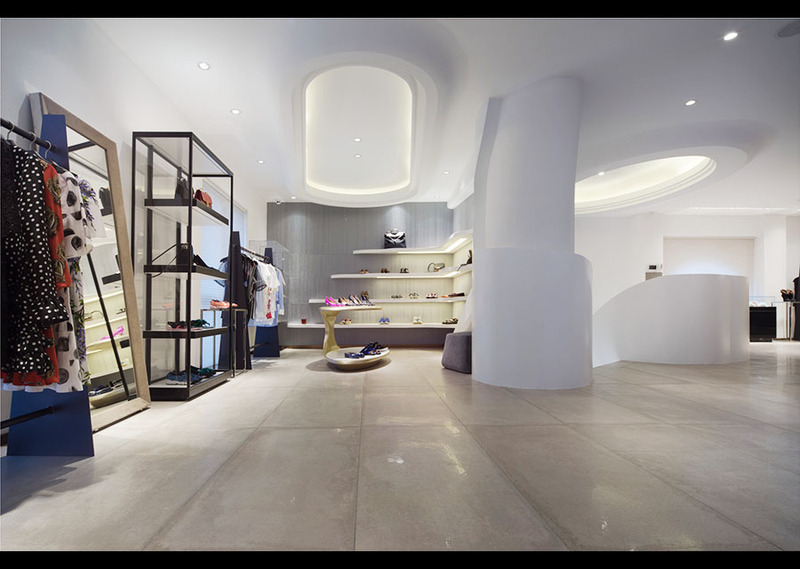 The flooring has used Marmocrea Collection by Sant` Agostino, G.e.t. Casa. 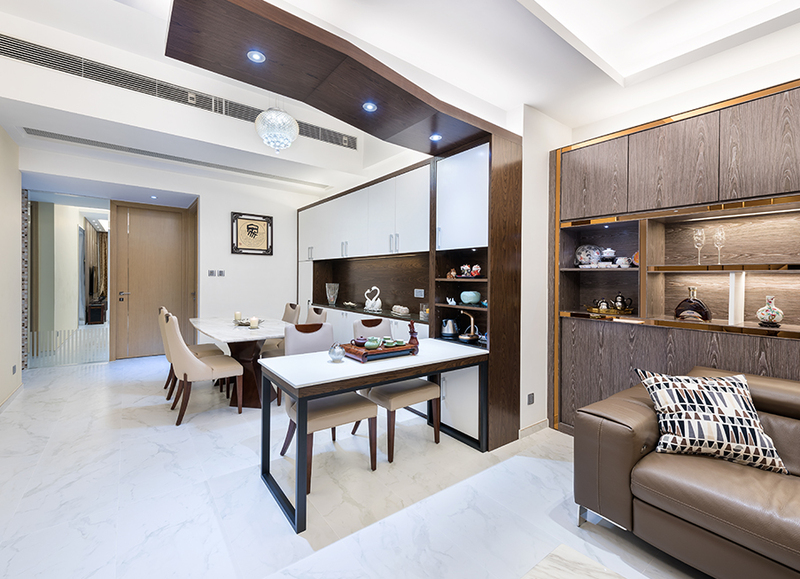 Given the mild and concise color tone, and the crisp marble pattern of the products, the designer has created an elegant base to match with different furniture and accessories to build up a character for the design. A number of Italian quality tiles by G.e.t. Casa have been selected. 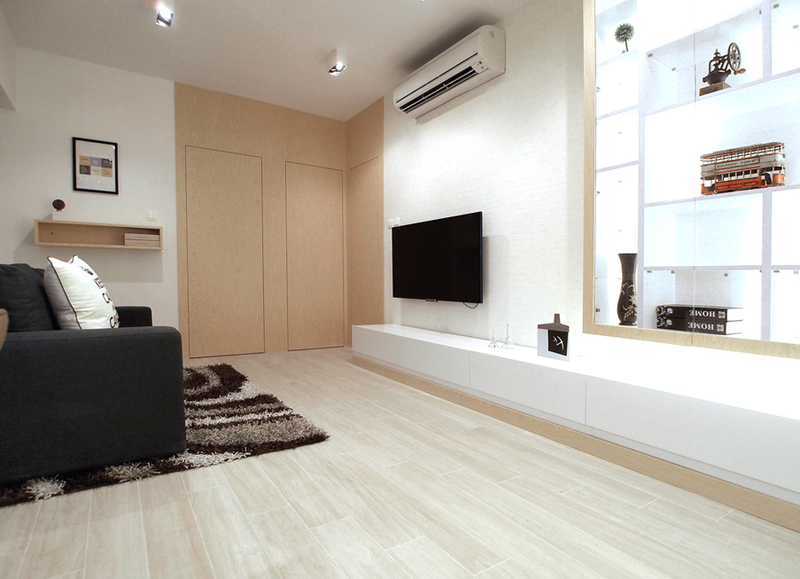 For the flooring of the whole area, Iris E-wood collection in white is used to fit for the main design theme. 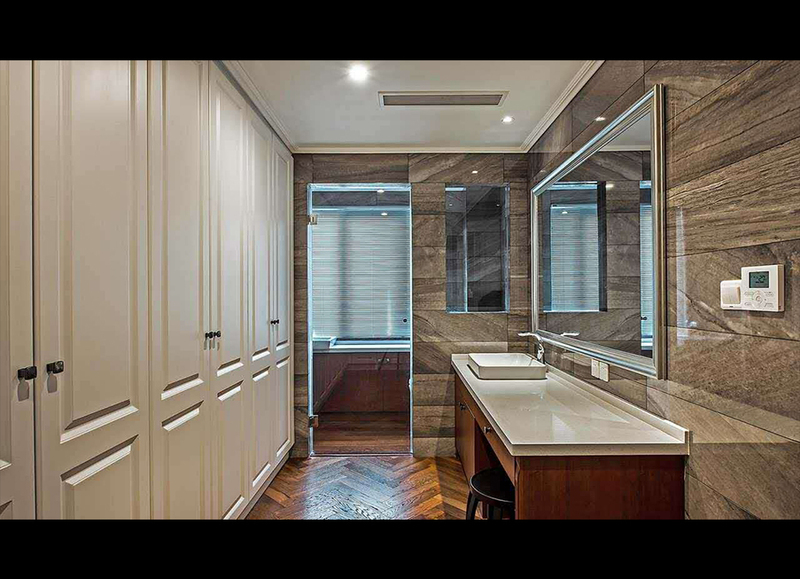 Its natural wood pattern has enhanced the natural and warm sensation for the area. With the integration of objects and details, and the contribution of the designer and client, it is more than just an interior project, but an artpiece. By carrying the power of creativity and ideas, the whole project now has become a HOME for the family. Under the arrangement by the designer, all common areas are connected by Sant` Agostino Concept Tile collection in Grey color, resulting in an enhancement of design tone and ambient. 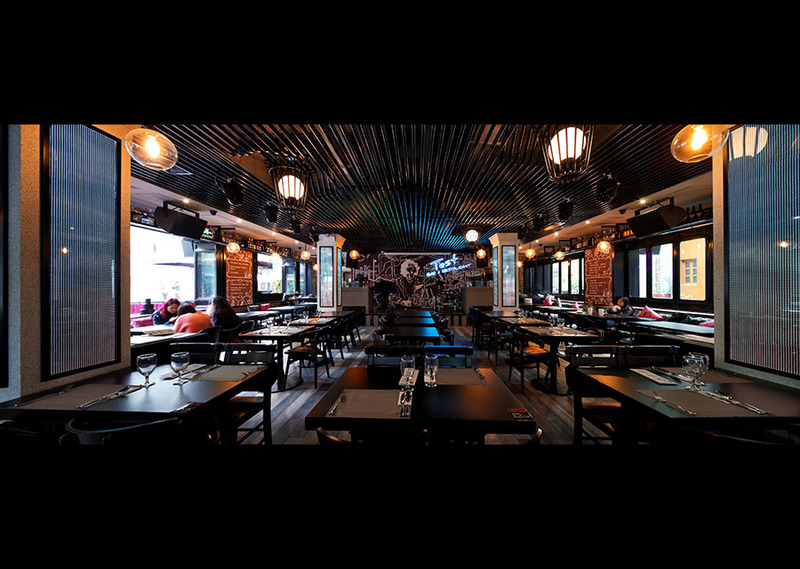 Not only for foods and services, Goji Kitchen & Bar has been chasing for quality interior ambient and decorations. 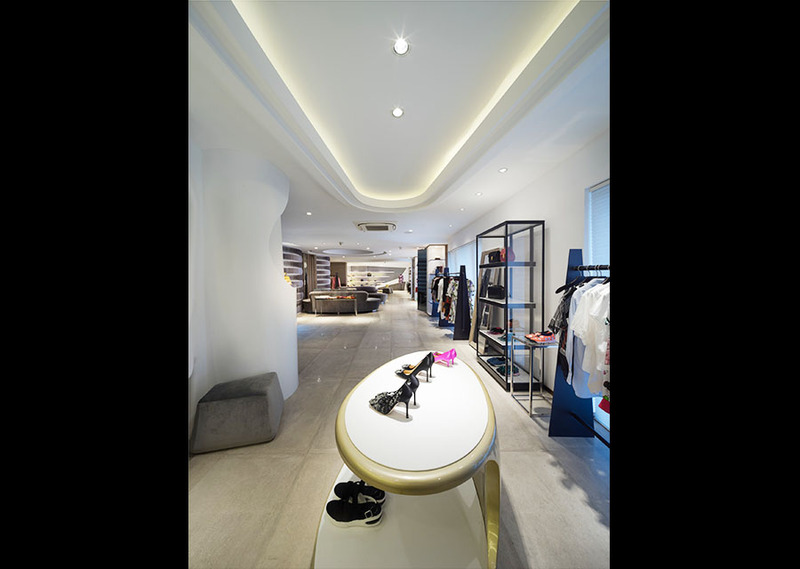 To cope with the ordinary high traffic of customers and in-house logistics, and even the overall ambient and visual sensation, the interior design team has specially selected FMG Roads Collection by G.e.t. Casa. FMG has a high hardness and stylish texture. The designer selects the Floorgres Walks Collection by G.e.t. 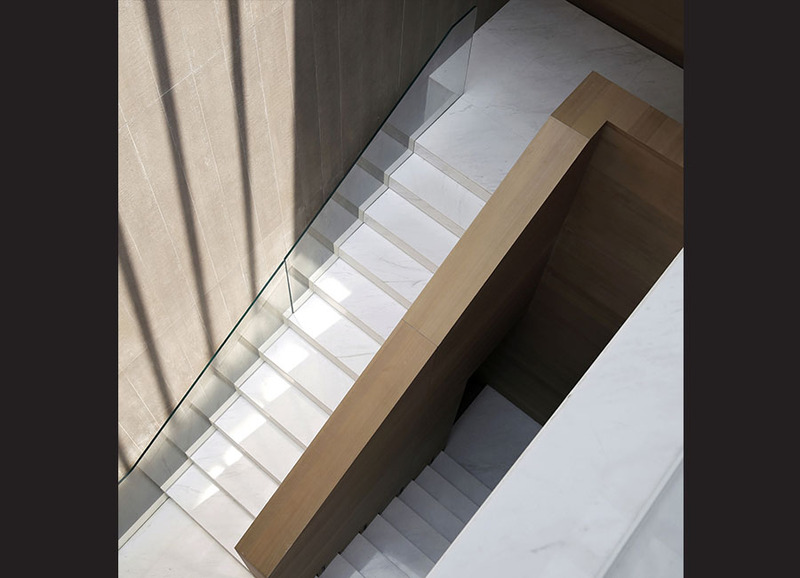 Casa for its quality function of hardness, raw and muscular sensation of the surface, to create a visional and sensational contrast between floor and wall. 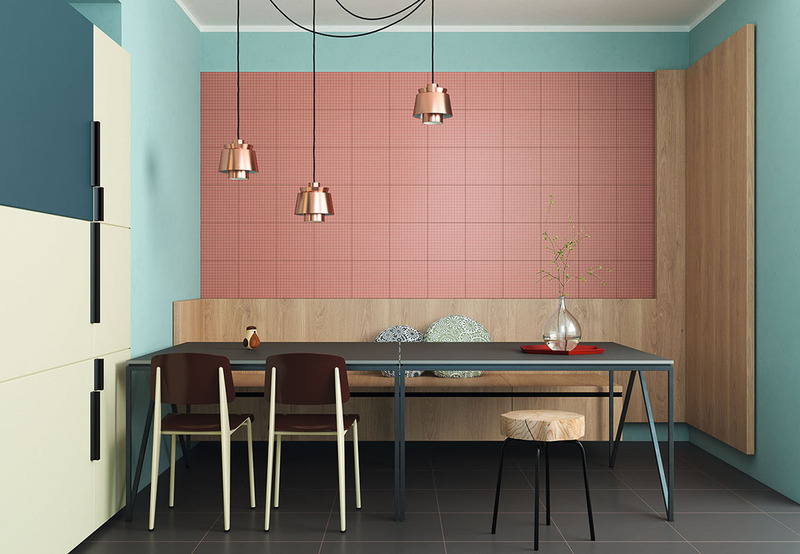 The designer has selected a significant amount of Italian tiles by G.e.t. Casa. Iris Melt Collection has the natural pattern of igneous rocks. With the selection of different colors, this collection is a good fit for both Modern and Classical Style. 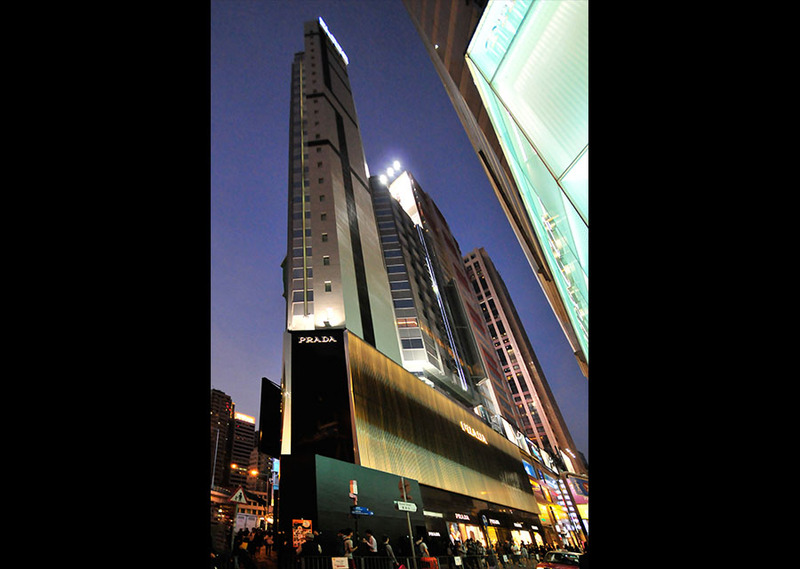 As a typically local and private enterprise in Guangzhou, Times Property takes "The Artist of Life" as its brand concept. They appreciate the personalized way of life instead of being satisfied with mediocre rules and the trend of homogenization; they commit to the life and career, and deliver values through the unremitting concentration and creation. 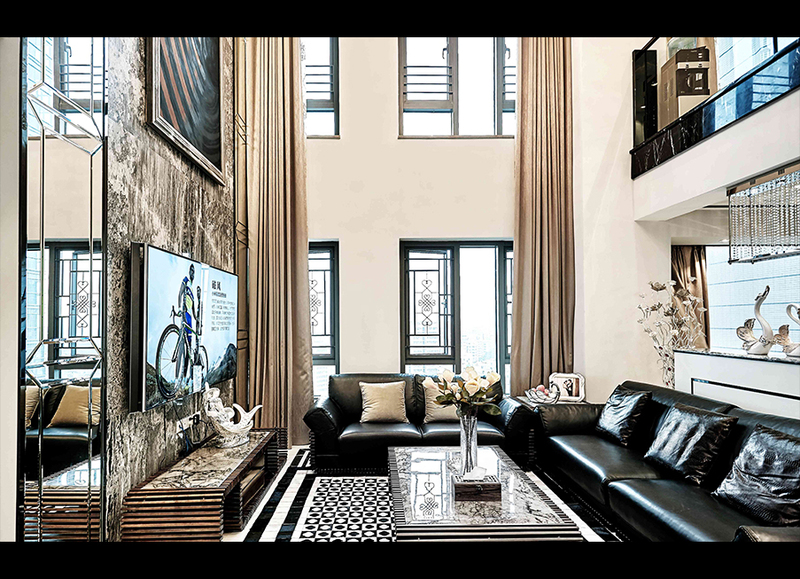 For the living room in black and white tone, the skillfully decorated flooring adds feature to the design. The tile of Sant’ Agostino Flow collection by G.e.t. 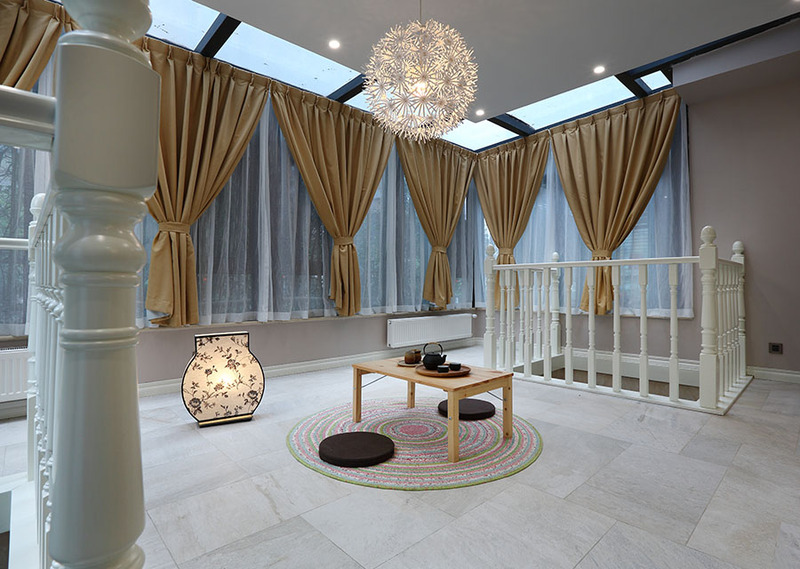 Casa is chosen to decorate the flooring. Designer thoughtfully selects FMG Marmi Classici Collection by G.e.t. Casa on the floor to match with the main design concept, while the white color and the humble yet elegant pattern of marble intensify the elegant sensation without any exaggeration. In contrary to the natural elegant surroundings, the overall design is simple but contemporary; which is the feature and visual sensation that the designer intentionally creates. 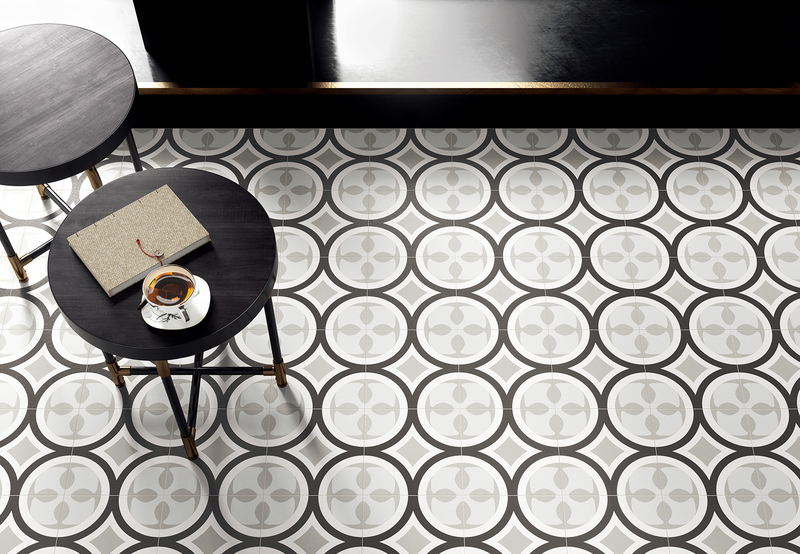 The Floorgres Walks collection by G.e.t. Casa is selected for the flooring. Given the contemporary sensation by the pattern of natural rocks, it reinforces the design`s modernity. 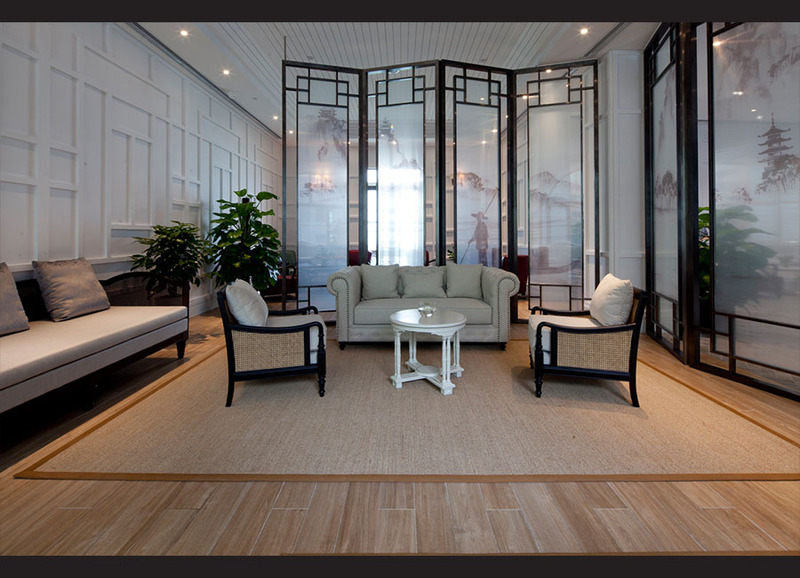 In addition to Walks collection, pieces of genuine parquets with traditional Chinese patterns are added to deepen the Chinese style of the design. Ma.De Tile Collection by G.e.t. Casa is used on the external wall. Ma.De collection has a vivid color tone and a shimmering surface like no others. Along with LED lighting effect, it intensifies the contemporary of the design and the sense of movement and motion in the sky. Sant Agostino Flow and FMG Roads Tile Collections by G.e.t. Casa are used in the entrance lobby. 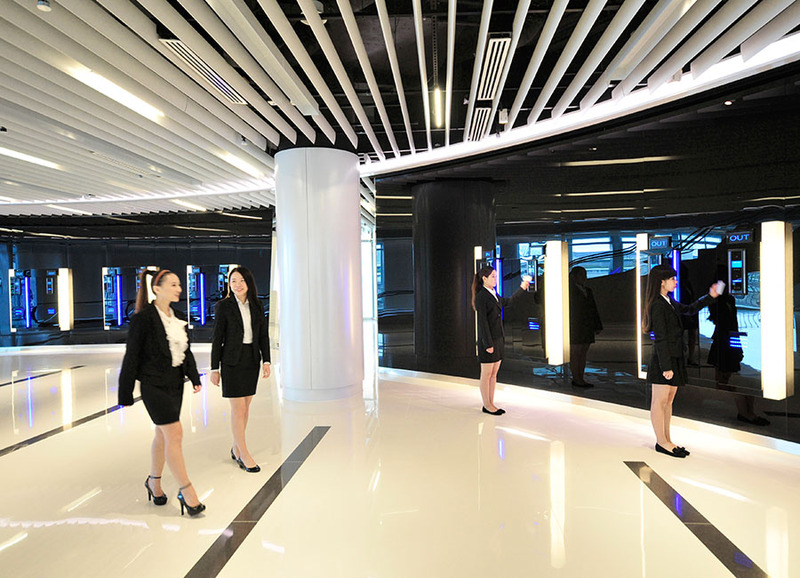 This new tower is an attempt to redefine the New Generation of Hi-Tech Telebet Centre and the Telebet booths for thousands of staffs to serve the ever-increasing demands. 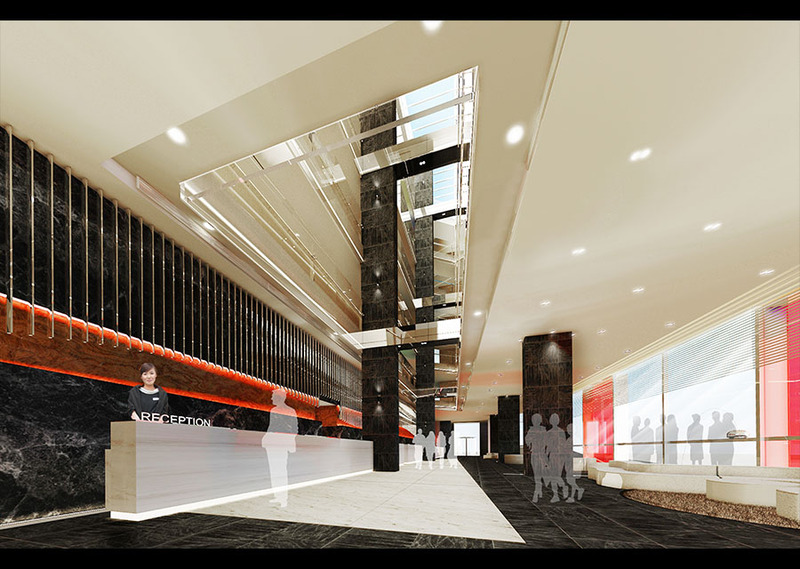 It is comprised of 3 floors, each covering 55,000 sq.ft., including a wide range of function rooms. The FMG Chromocode 3D by G.e.t. Casa is put in bathrooms. 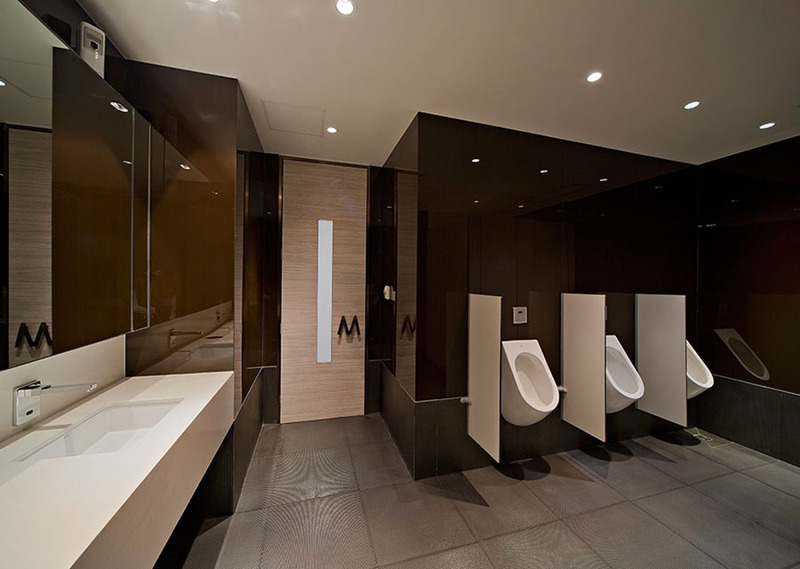 Providing an aesthetic effect for the interior, Chromocode 3D also provides slip-and-shake-resistance and Mohs' scale of hardness of 9, to suit the needs of bathrooms. 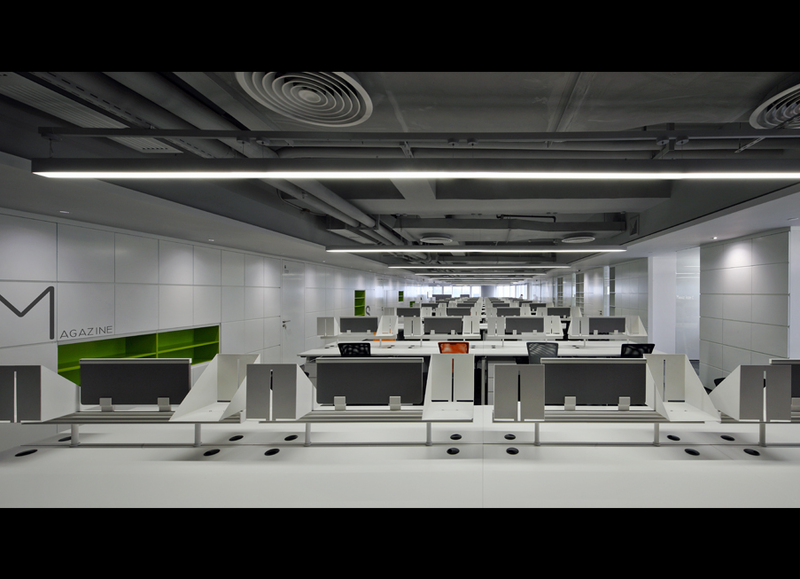 Certificated by LEED, Chromocode 3D creates a world class environment with quality and comfort. 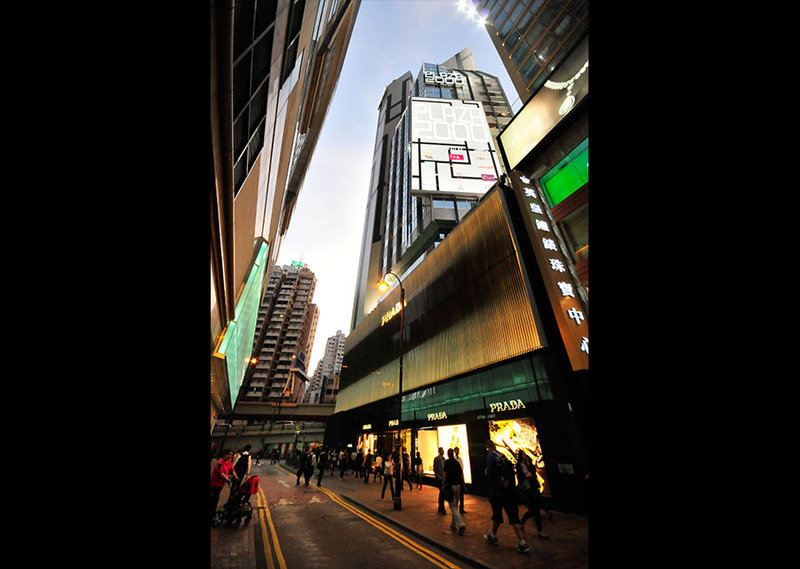 The Re-Modelling of Plaza 2000 is an exploration to transform the existing structure and skin into a more Breath-Taking Iconic Chic which performs as an major Iconic Landmark of the Russell Street in Causeway Bay. Ma.De collection by G.e.t. Casa is used for the external wall. In the area of a Chinese restaurant, tile of Iris Terre by G.e.t. 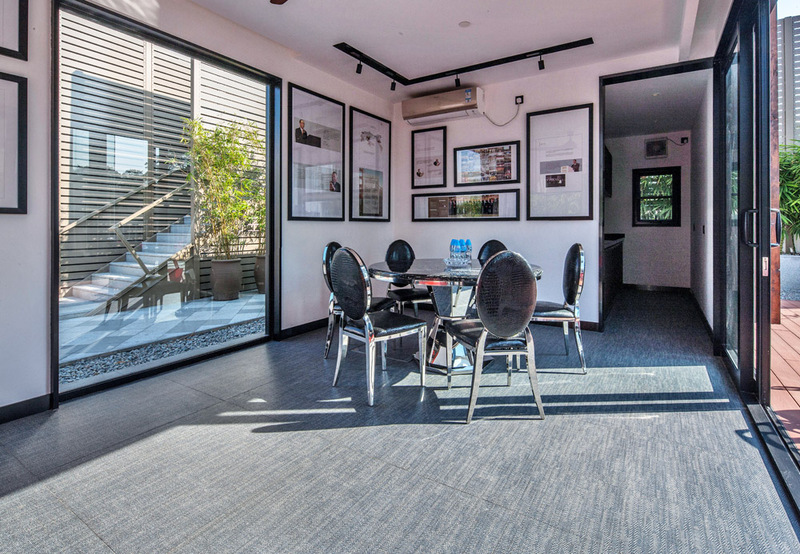 Casa is laid on the floor, which symbolic pattern and colors add a dramatic and filmlike sensation into the area. Iris Pietra Di Basalto of G.e.t. Casa is used for the flooring. Featured with the refined patterns of basalt and its R11 anti-slip function, this collection provides a combination of aesthetics and functions for the area. Floorgres Reverse is used as the flooring, while Iris E-wood is chosen for the flooring on the second and third floors. 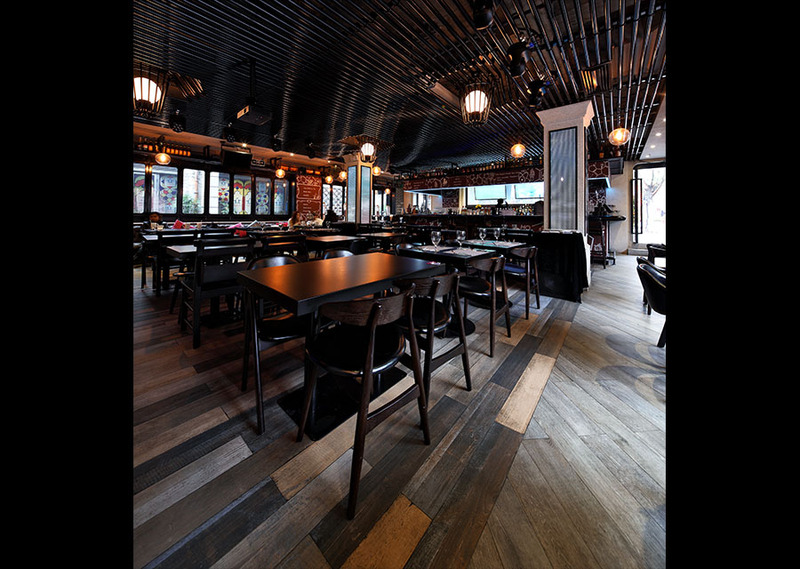 Having different natural tones and patterns of real parquet, Floorgres Reverse and Iris E-wood create different sensation for different areas of the project. FMG Roads Tiles by G.e.t. Casa is selected for the flooring. 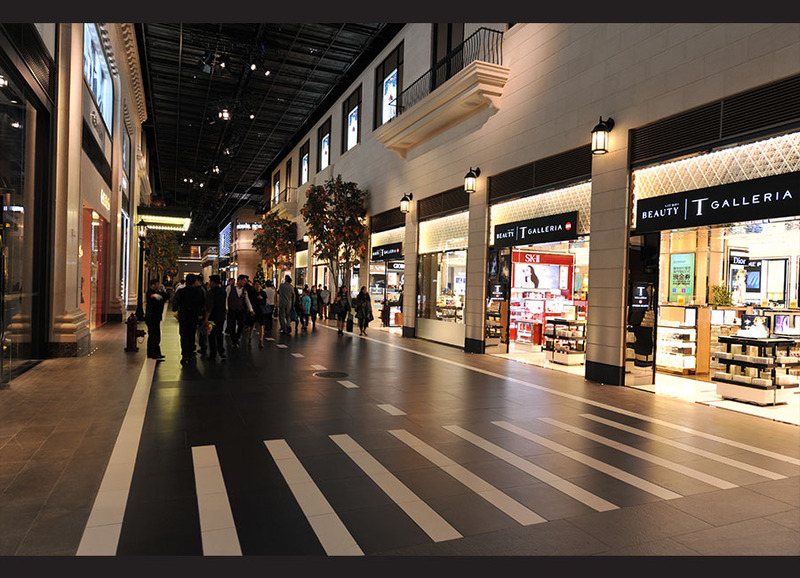 The white purity and matt finishing of the tiles provide a modern yet elegant sensation for the corner to match with the mall`s image, it also provides a high level of durability and non-slip feature, which is essential for high traffic areas. The designer selects Iris Pietre Di Basalto collection as the flooring and wall. 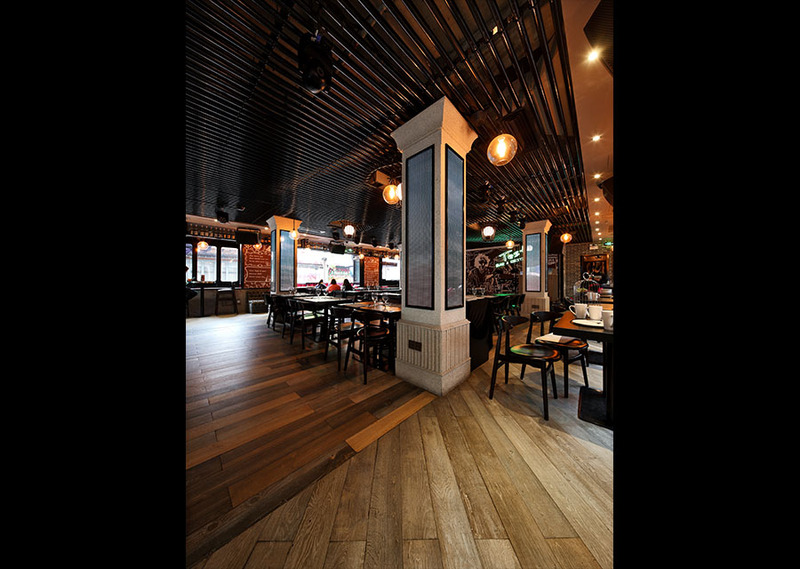 The natural pattern of woods of Iris E-wood collection creates other kind of natural sensation for the project. Tonalite Satin collection is used for its distinctively sandy texture of the surface puts details into the natural feature of the design. Designer selects a luxury tile product from G.e.t. 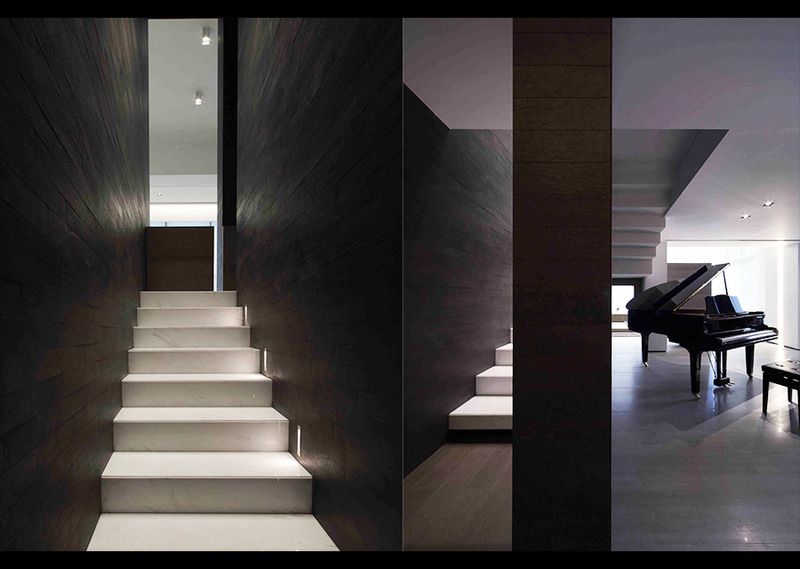 Casa – Sant` Agostino Luxor, for the flooring of living room, bedroom and kitchen. The timeless and elegant surface of Luxor has a rich volume of marble pattern. With the crystal-liked surface, Luxor is able to create a special character for the design. Matching the elegant setting of furniture, the designer successfully creates a modern and elegant style with the precious sensation of Luxor. 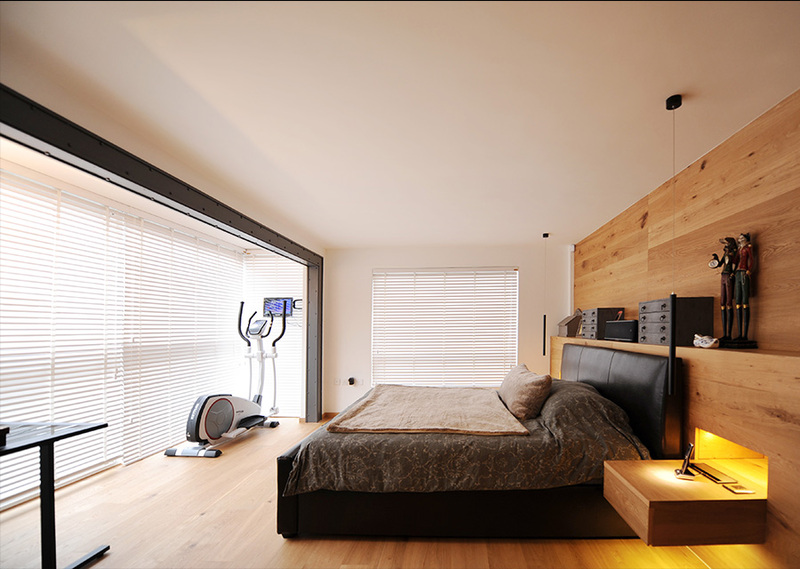 For the bedroom flooring, Iris E-wood by G.e.t. Casa is selected for its wood-liked surface. 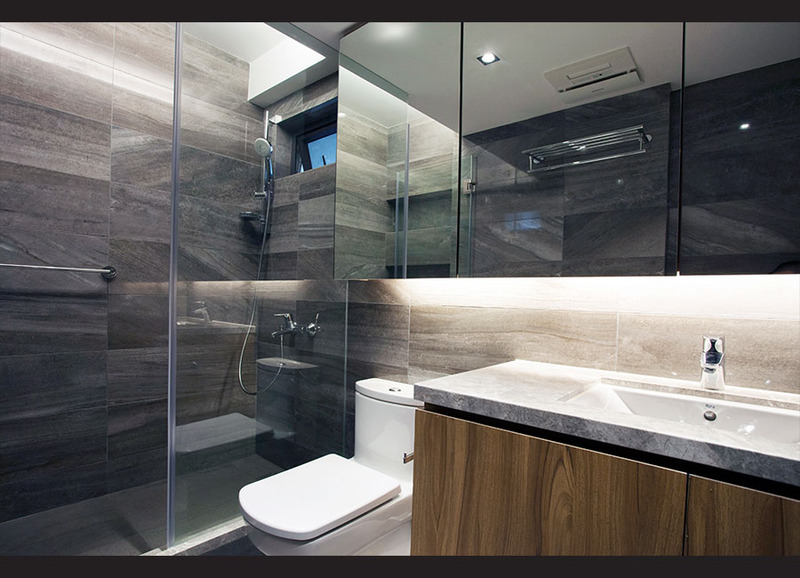 In the bathroom, Iris Melt collection is selected for the wall, and Pietra di Basalto collection for the floor. 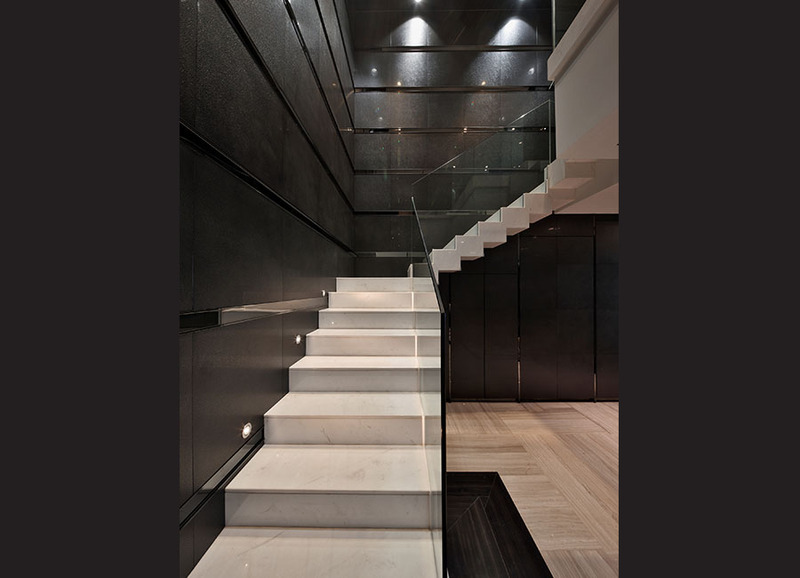 The natural marble and rock surfaces together create special characteristics for the space. Designer chooses Viva Statale 9 by G.e.t. Casa to create the inspirational flooring for the living room and kitchen. The natural sensation by Statale 9 merges with the natural landscape and lighting around the house, to intensify the harmony and conformability in the area. 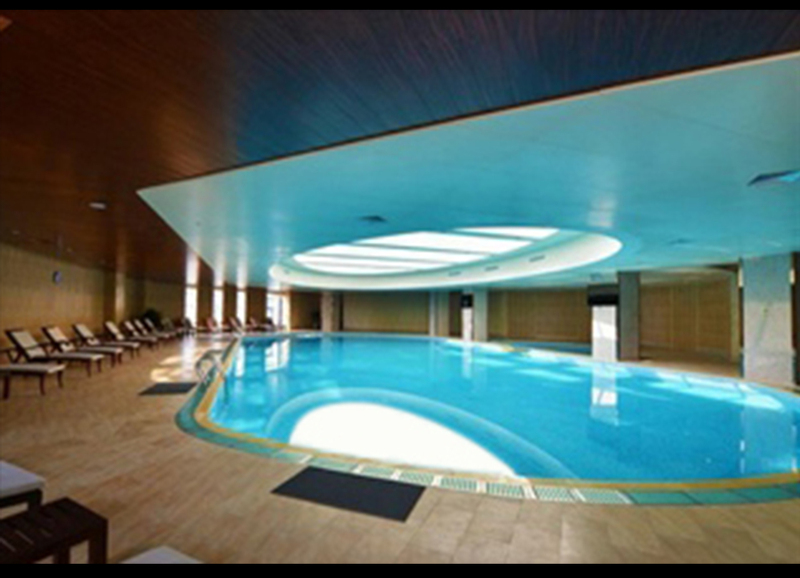 JW Marriott Hotel aims at being the finest hotel in the region. 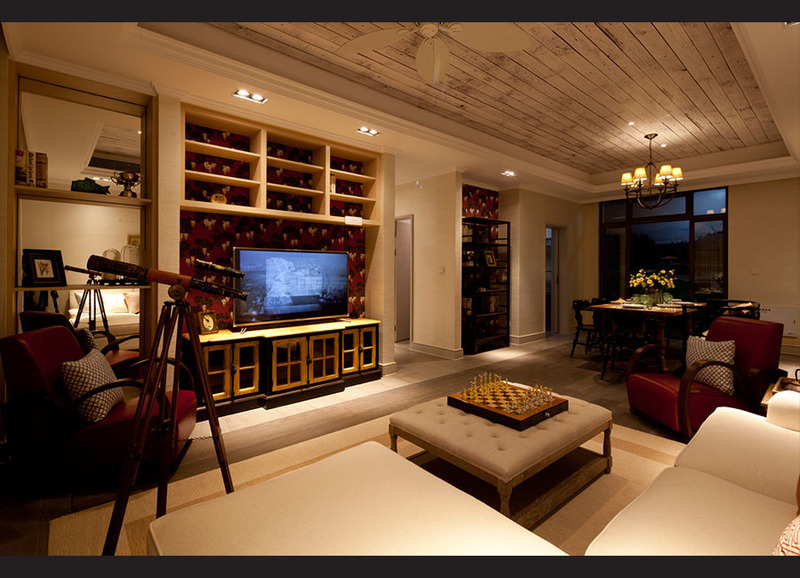 One of the moves is to make their interior design as the most distinctive and impressive one. 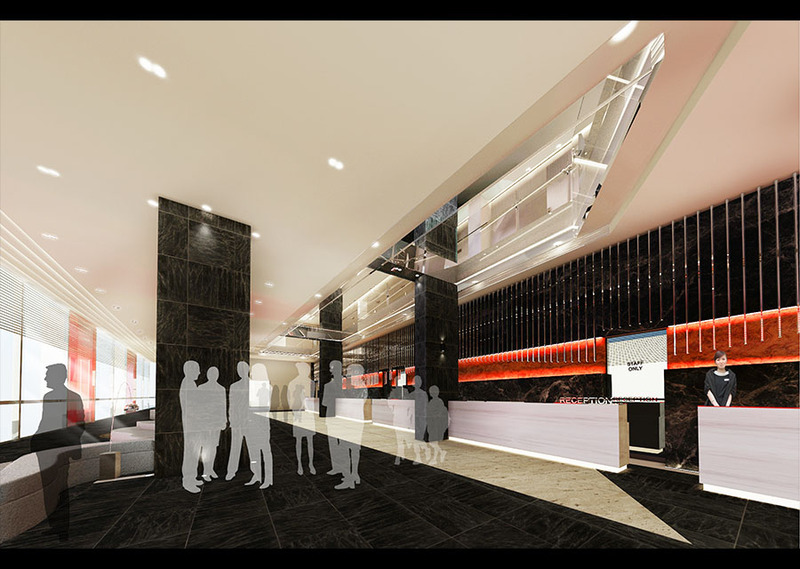 They put a lot of elegant elements into different spaces to boost up the hotel image. 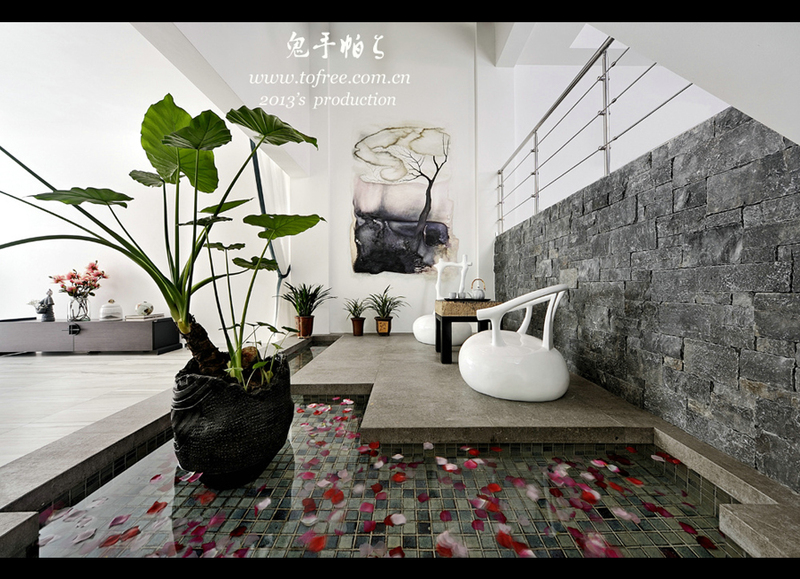 In the president suite, FMG ROADs Tile Collection by G.e.t. Casa are put on the floor to create a breath-taking view, giving a feeling of the precise and nobility. In the two-storey structure, each section is personalized. The whole design uses a number of tile products by G.e.t. Casa, including FMG Roads, Sant Agostino Flow and Sant Agostino Jungle Lux, etc. The vintage wall, 3D cutting structure and those dimensional lines represent the past and future. 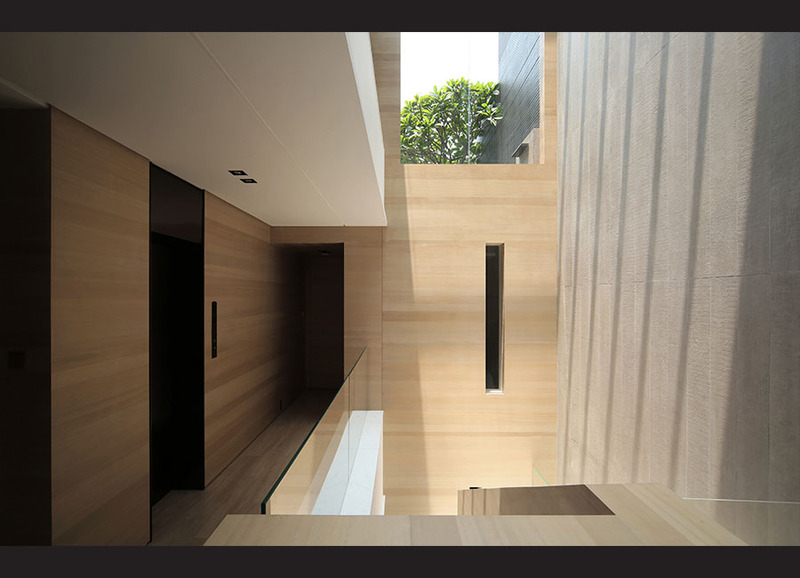 Designer instills the emergence of the past and future throughout the design. 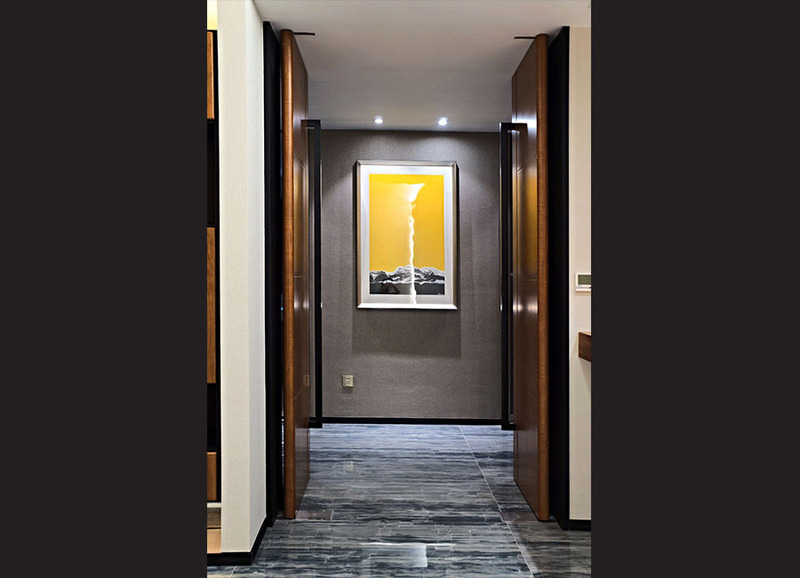 The victoria collection by Sant` Agostino is used in the living room, dining room and corridor areas, the petrified-wood-like surface is precious and the color is profound, together creating a beauty of mysterious and a directional interaction in vision. 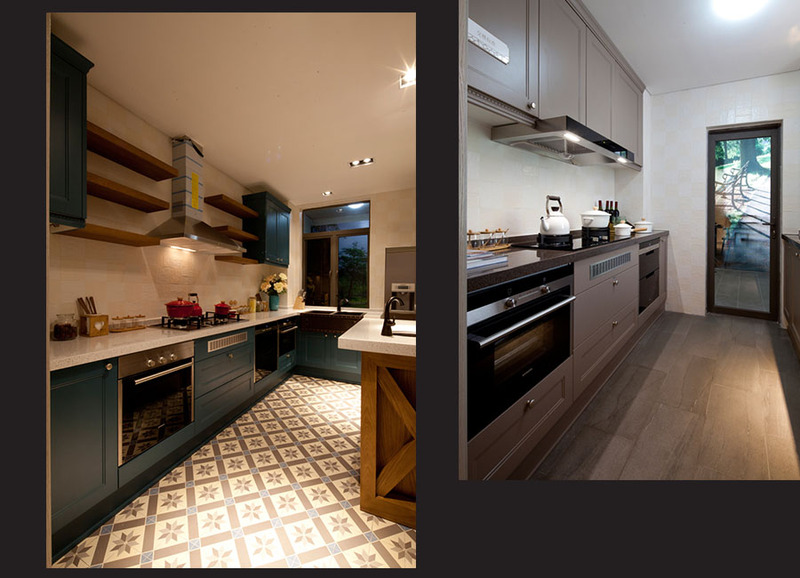 The Reverse collection by Floorgres is used on the floor of kitchen while Terre collection by Iris on the wall. 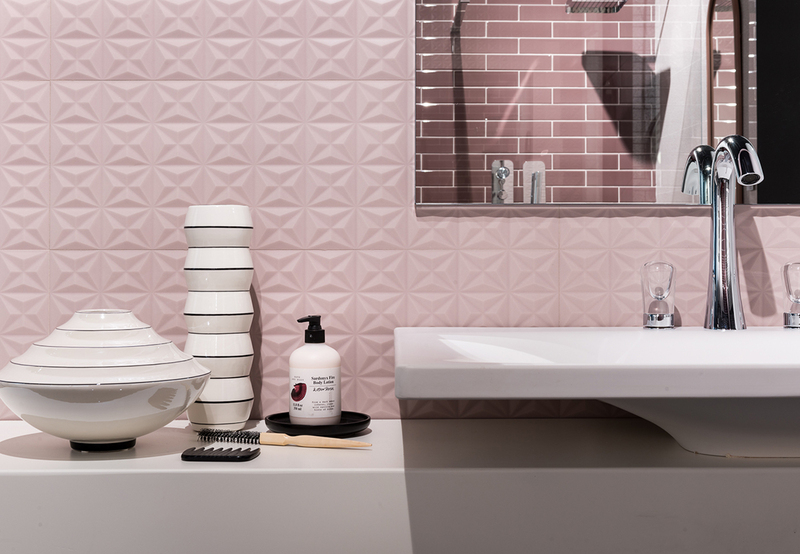 The tile collection – Tamita, by G.e.t. Casa, has a strong modern sensation of classical design. 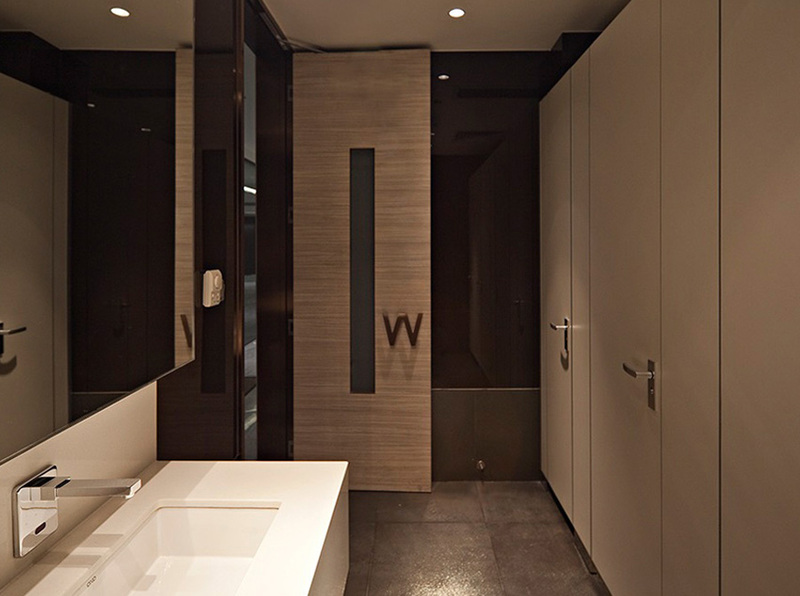 A vigorous texture is reflected by the sensation of tiles. 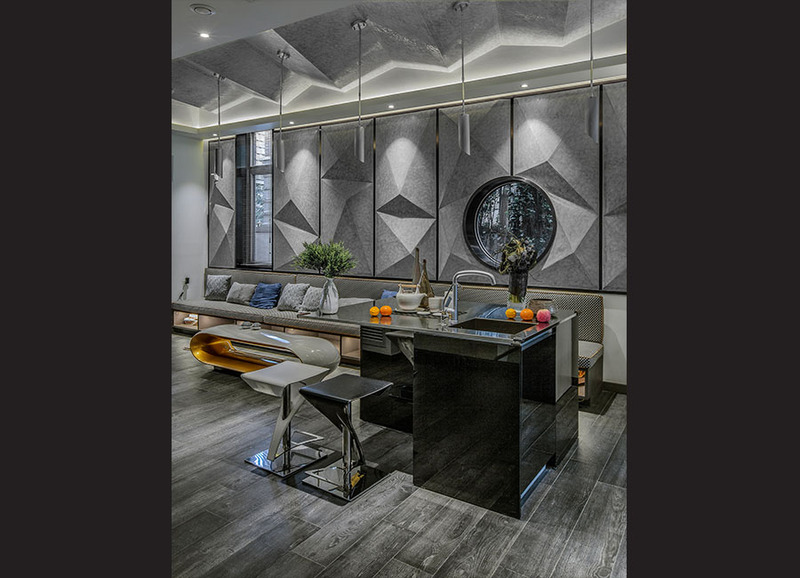 Having unique geometry graphics and colors, the unique texture and the aesthetic surface creates a touchable beauty and harmony for the space. 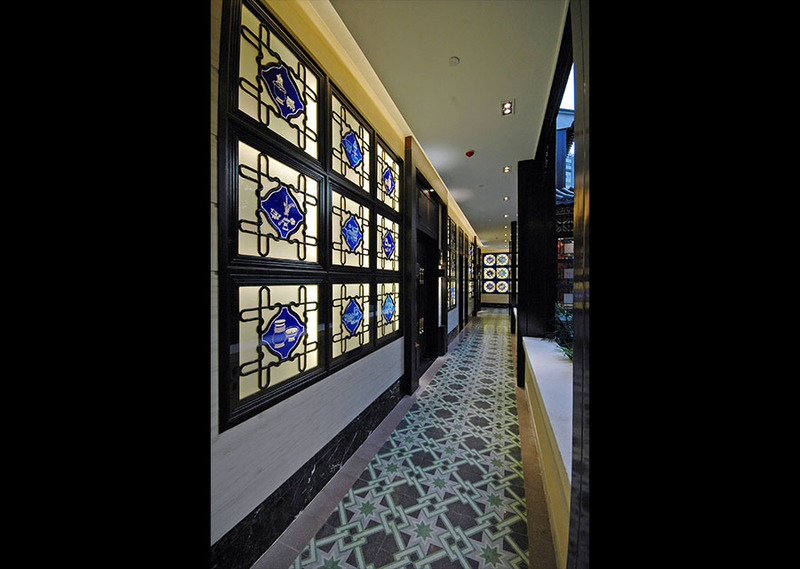 Tiles of Sant` Agostino Luxor collection is used on the floor on the 2nd floor. 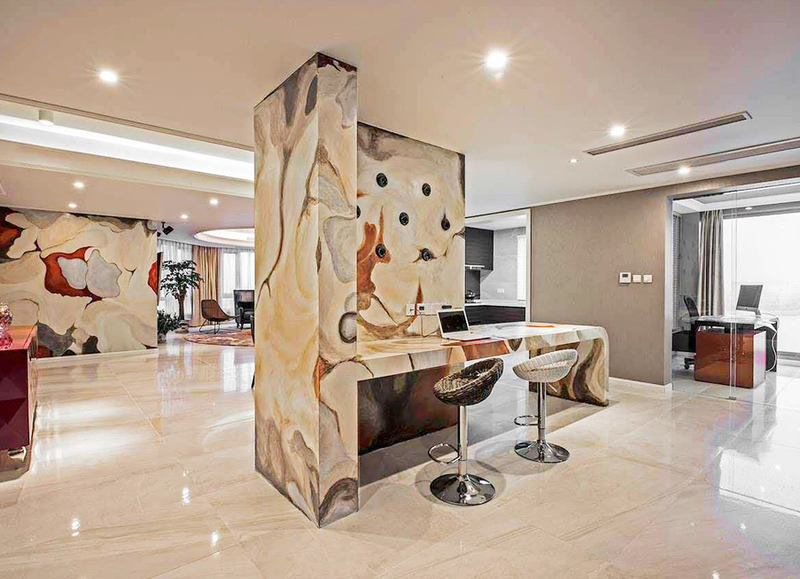 The contemporary elegance of marble surface creates a modern and dynamic emotion for the design. 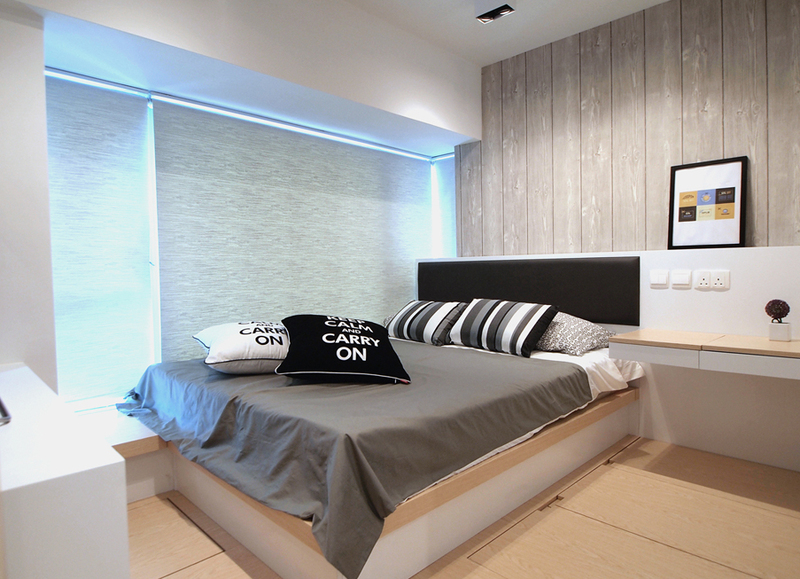 For the bedrooms, the designer selects Viva Nr. 21 collection for the floor. Life is not only about running and striving. Settling and resting sometimes will allow people to discover the special beauty of simplicity and purity. Regardless of pressure and negative emotion, simplicity is definitely the best option. FMG Marmi Classici Collection and Horn Collection by G.e.t. Casa add extraordinary features into the designs. The special “Shine” surface of FMG Marmi Classici Tile Collection and the elegant characteristics of Horn Tiles Collection match with the image of The Phoenix Hill and take the interior design to the next level. 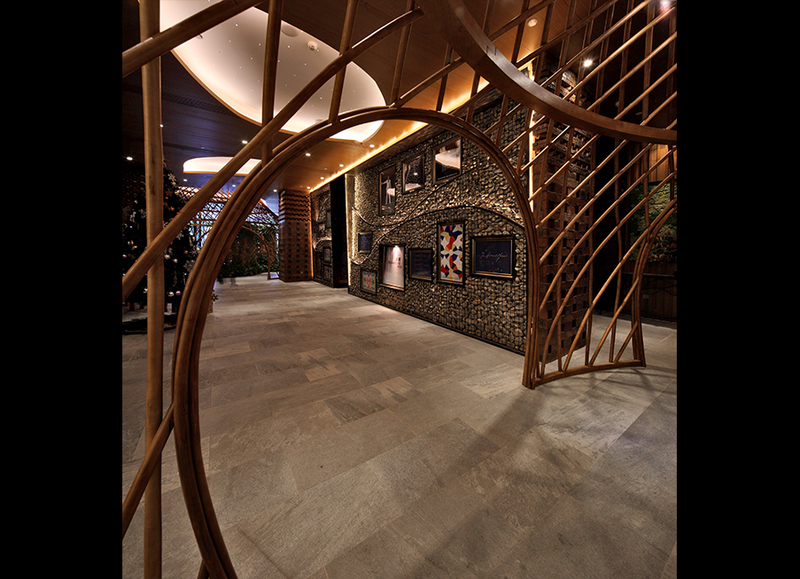 The lobby is the centre of the design, in which the designer creates a unique and astonishingly elegant area with the wavy-shine surface of FMG Nature 2.0 tile collection of G.e.t. Casa. 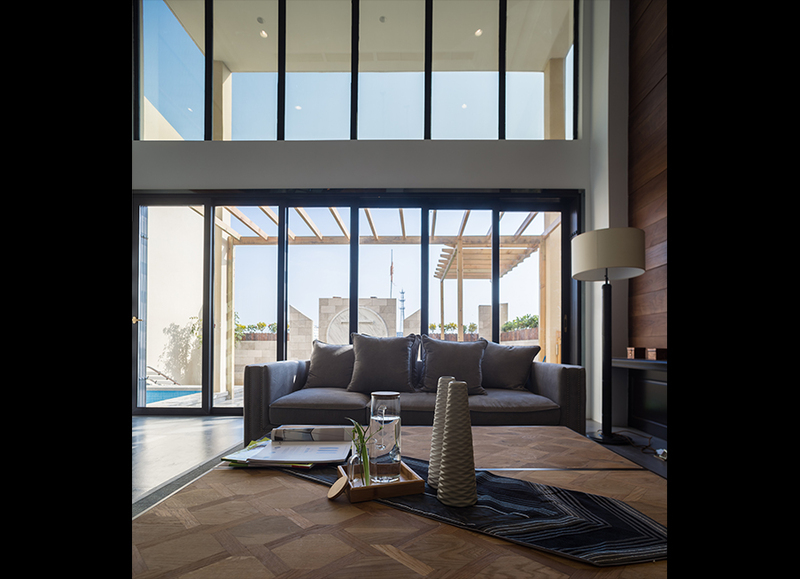 The application of French Windows enables the penetration of light throughout the space, and reduces the tension but enhances the comfort. FMG Marmi Classici by G.e.t. Casa has a white background and is selected to create a sensation of purity for the design. 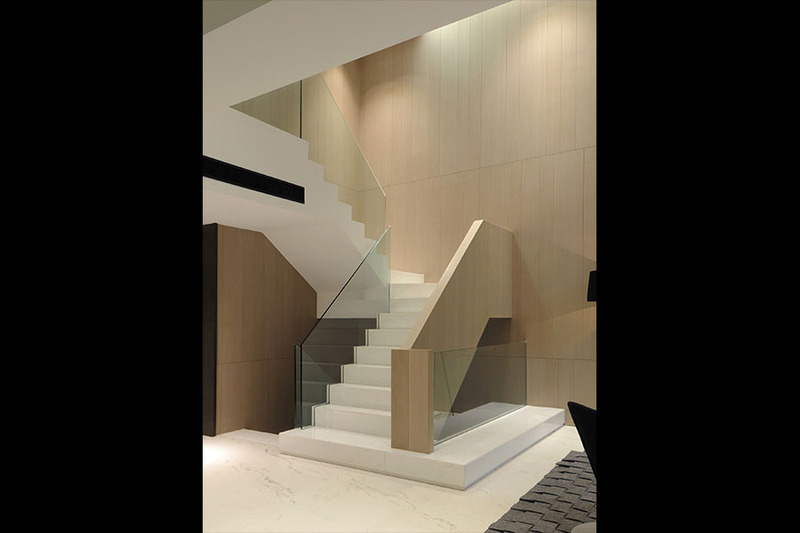 Along with the transparent design of the staircase and the special lighting arrangement, a vivid interaction between different sections is created, which connects and centralizes the beauty of the design. LAXDN is a fashionable appeal brand, originated from Paris, France. 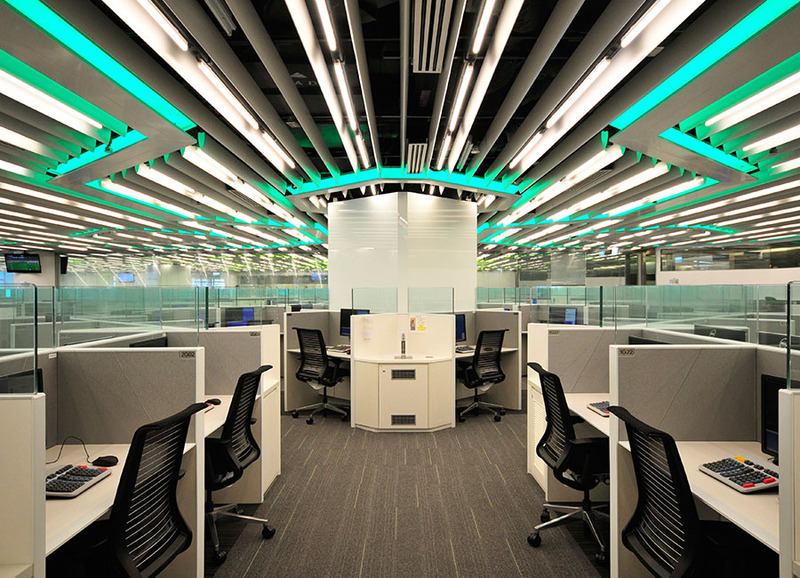 The Interior Design for the head quarter in Guangzhou, China, uses FMG products by G.e.t. Casa. The designer selects a number of Italian made tiles by G.e.t. Casa to create the design, including Viva NR.21, Sant Agostino Paving, Iris Quarziti and E.wood, as well as Floorgres Reverse. 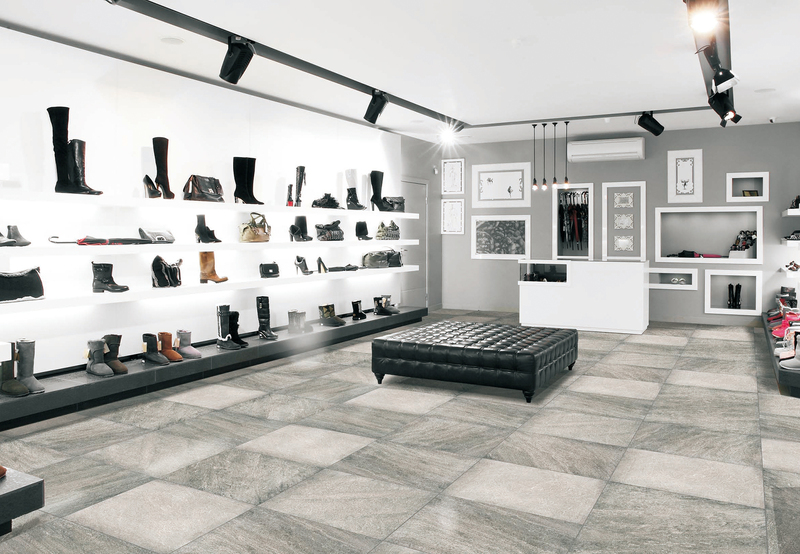 Sant Agostino Ferro Tile Collection and Iris Quarziti Tile Collection by G.e.t. Casa are selected to be the base of the design. Under the special arrangements by the designer, the remarkable colors and patterns of the tile products enrich the visual depth. The space now is granted a new visual order and a perfect atmosphere for the family. 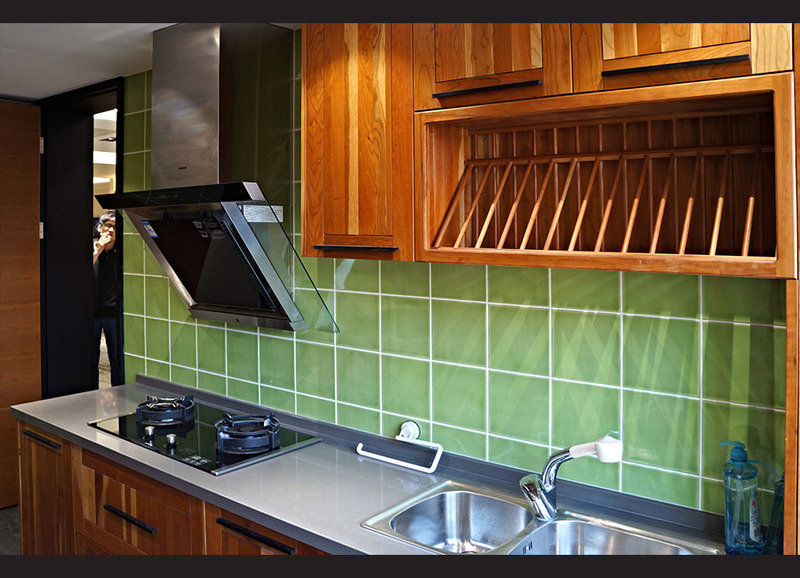 A wood-styled tile of Fioranese Cottage Wood collection by G.e.t. Casa is used for the flooring. 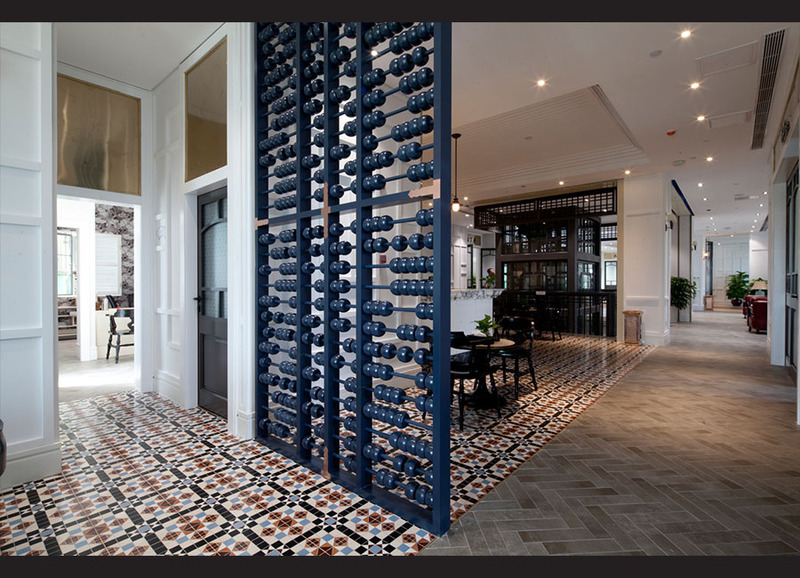 The dusty shade of the tile transforms the historical feeling of the design into a sensation of old fashion, deepening vintage image of the space. 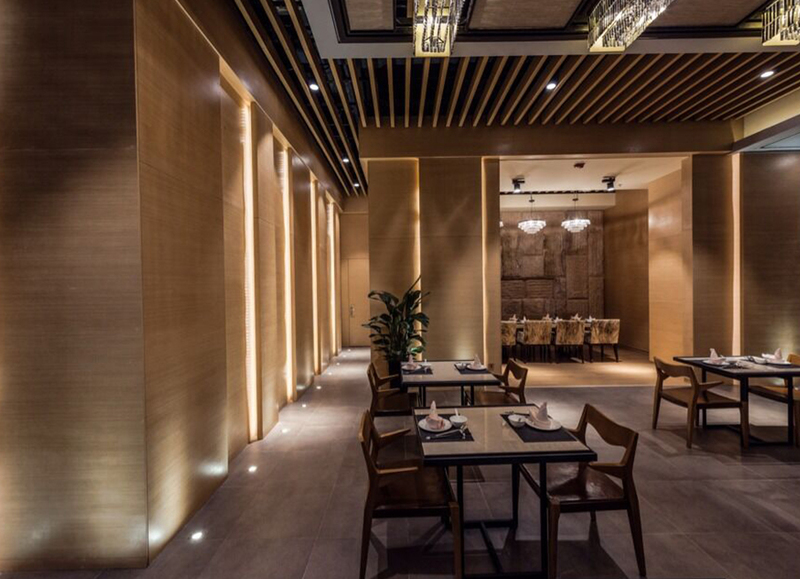 The interior of the North Garden Chinese Restaurant is in a Simplicity Style with Modernity. Having the vivid colors and a series of the preserved furniture with ancient floral patterns, the designer puts a symbolic pattern in the ancient Chinese Style on different ceiling areas. Viva Nr.21 tile collection with cement style by G.e.t. Casa is used on the floor. The detailed color and pattern of the tile offer a detailed sensation into the design, deepening and intensifying the visual experience. 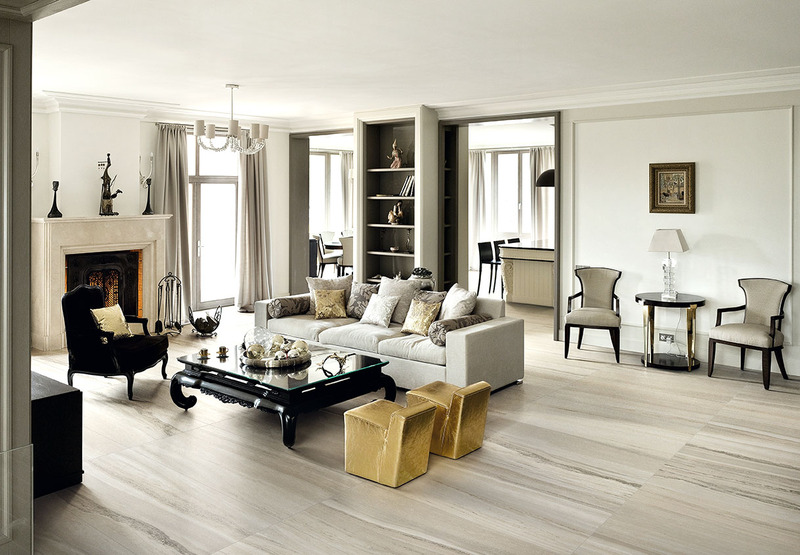 The designer puts FMG Marmi Statuario Venato Extra for the living room’s floor. The exclusive “Shine” finish and the great resistance to dirt and compact create an aesthetic and practical result. 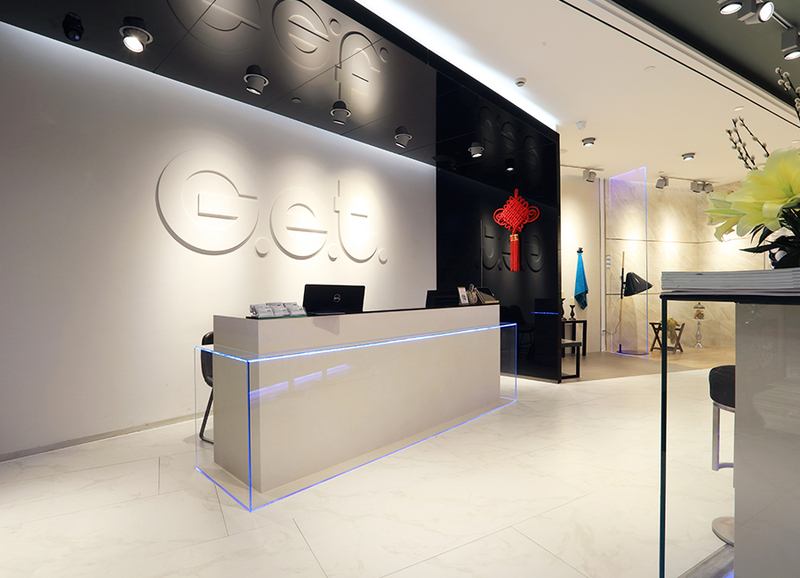 As a part of the renovation project, the “FMG Pietre “ products from G.e.t. Casa are used in the changing rooms and corridors in the swimming pool area. The flamed surface has taken the environment into the next level. 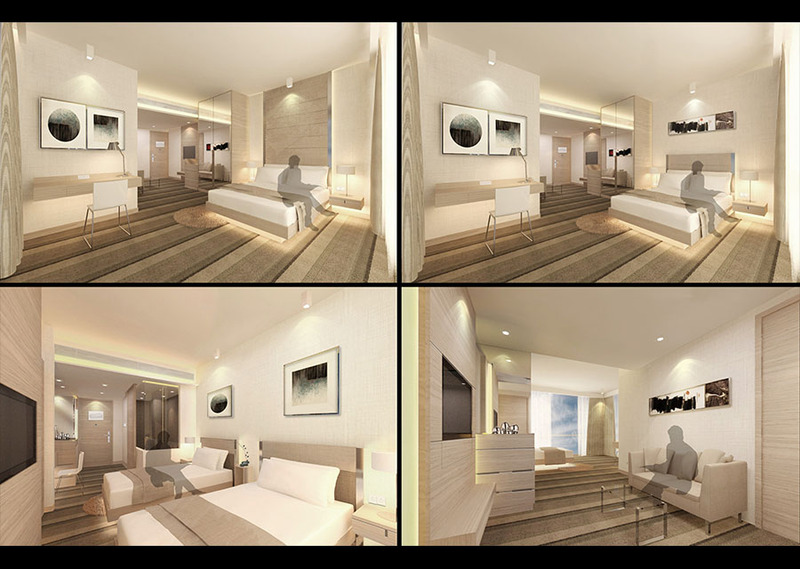 The main idea of the interior is to integrate the style of modernity and classical elegance. 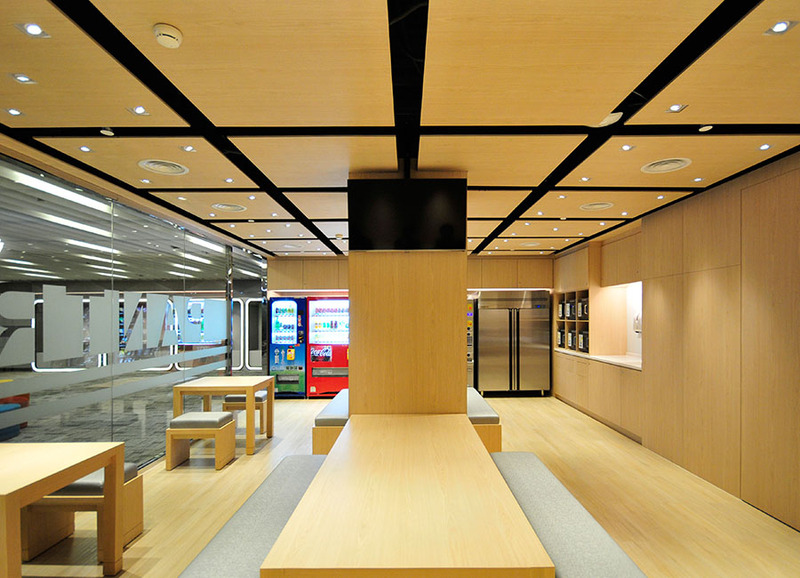 The sense of modernity is illustrated by simple and clear color tone. 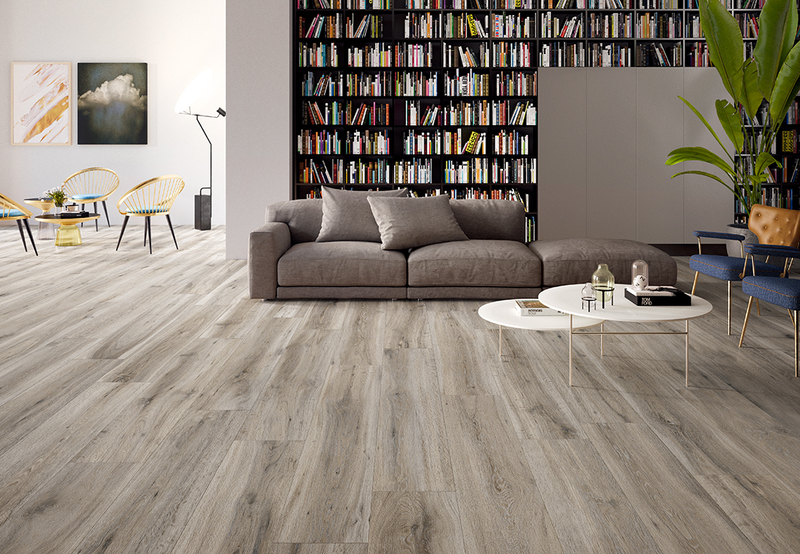 In the flooring of the living room, FMG Marmi Classici Statuario ven. Shine collection by G.e.t. Casa creates an elegant sensation with its natural marble pattern, while its shiny-wavy texture matches with the deliberately selected furniture to create a unique spatial interaction. 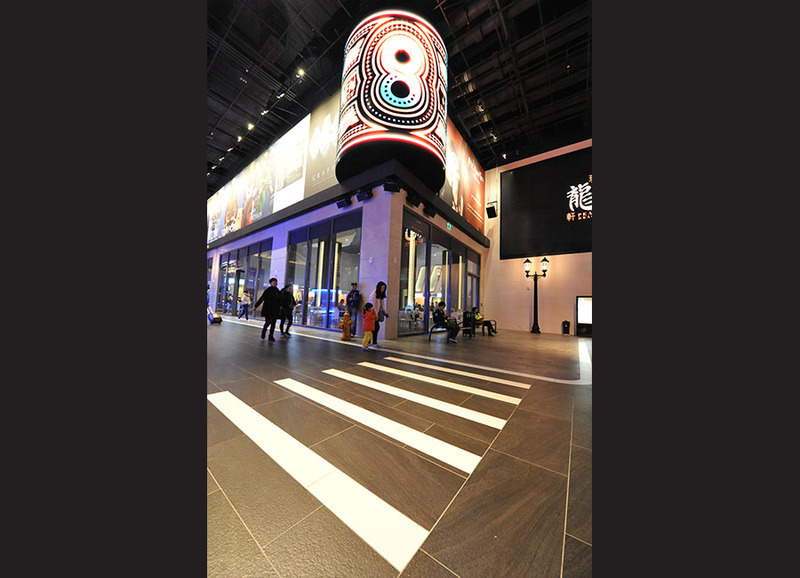 Ceramic Tiles of MA.DE is one of the masterpieces by G.e.t. Casa. Having the unique texture and the shining colors, MA.DE has made itself a perfect match with the luxurious, romantic and vivid images of high-end automobiles. 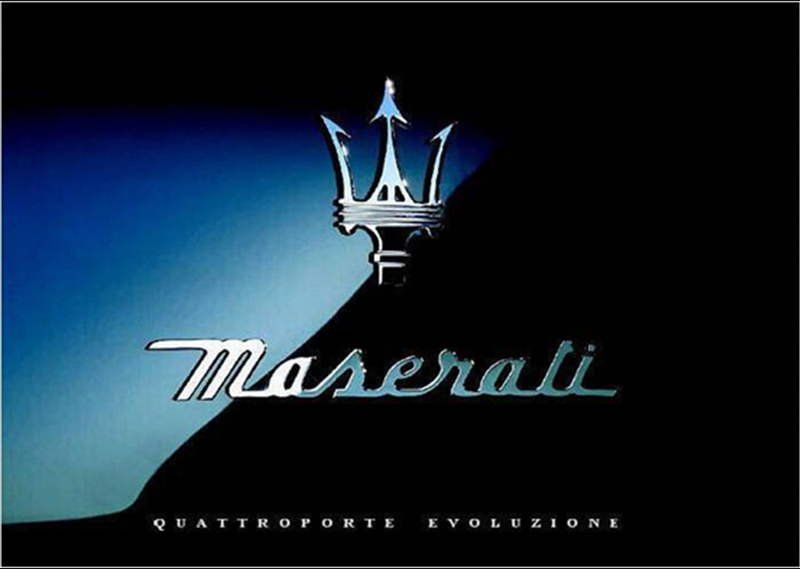 It has also illustrated the history and passion of the Italian Design. 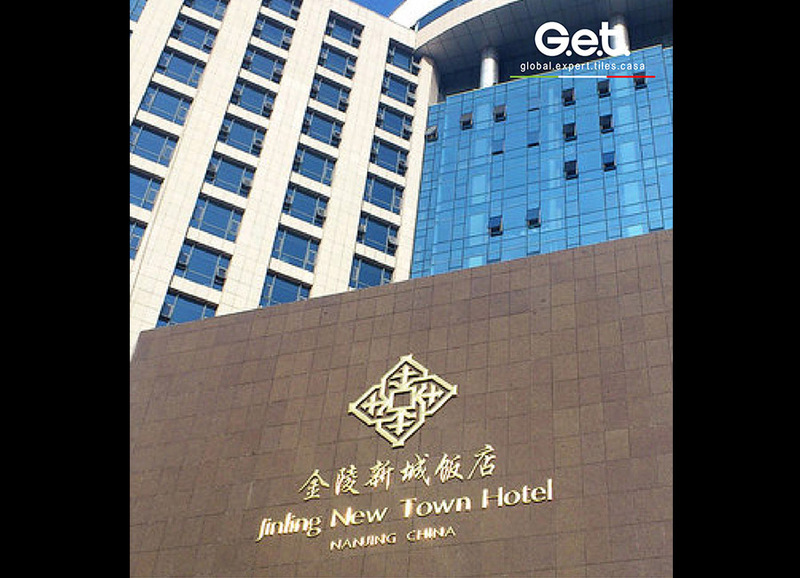 Promoting the European Modern Styles across China, G.e.t. Casa welcomes any merchant and investor to join our Marketing and Franchising Team, to promote the 100% Italian-Made tiles, parquets and wallpapers. Along with 35 showrooms, G.e.t. 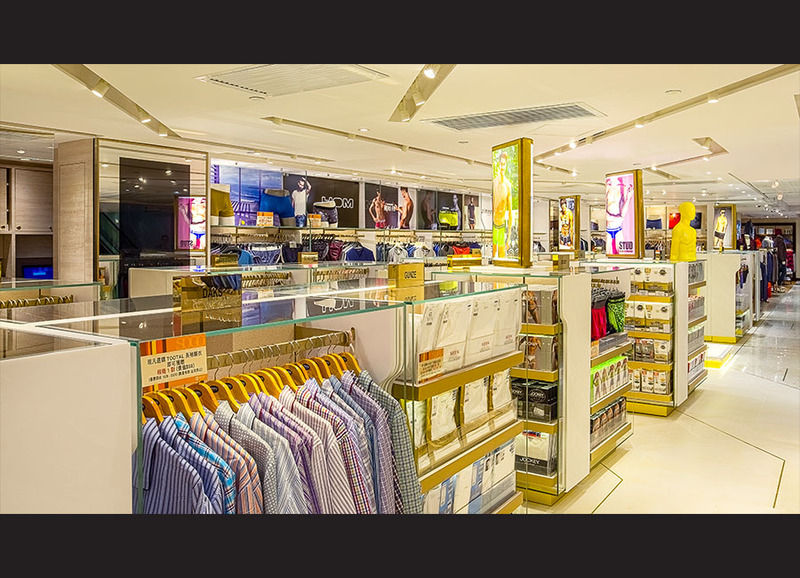 Casa has also had a number of franchisees in different regions and districts in China. G.e.t. 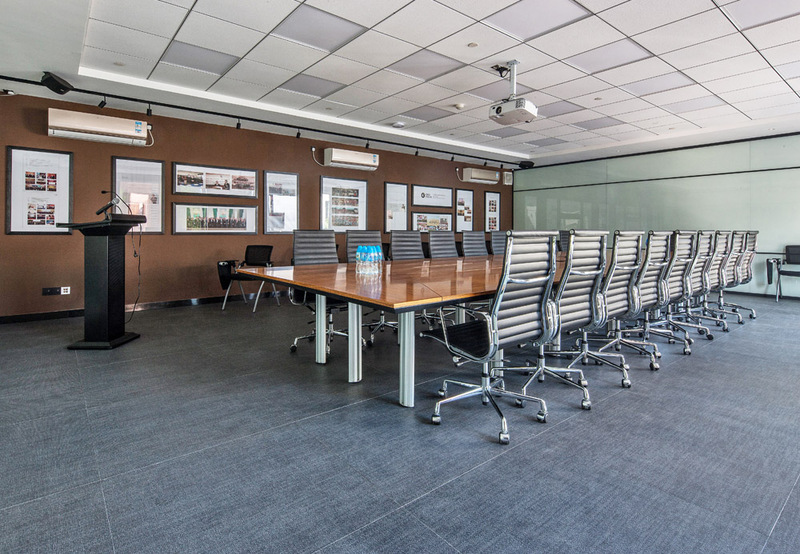 Casa provides franchisees with showroom designs, image designs, assistance for business opening, product training and selling techniques, and the national marketing campaigns etc, ensuring franchisees being able to provide the quality services for clients in an effective way. For more enquiries about franchise' of G.e.t. Casa, please feel free to contact franchise otline at 4000 132 001, or by email: franchise@get-casa.com. G.e.t. Casa Trading Company Limited.